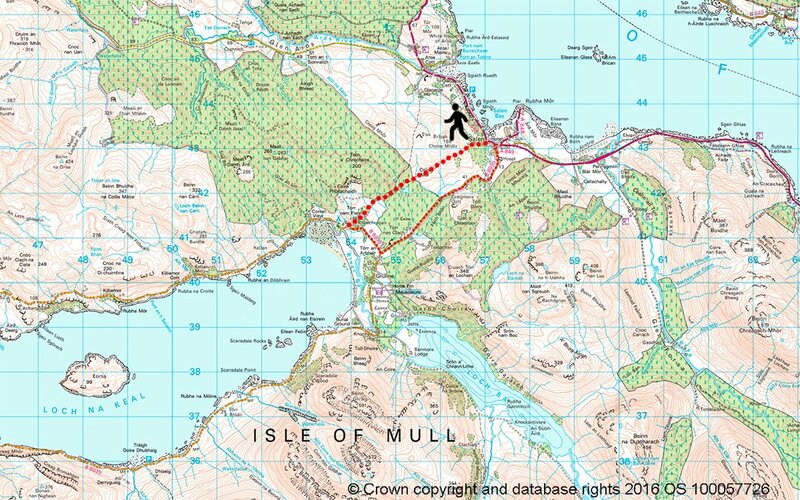 This guide to walks on the Isle of Mull contains route maps, photos, and descriptions for each walk. We have graded them, giving you a rough idea of their difficulty in relation to one another. 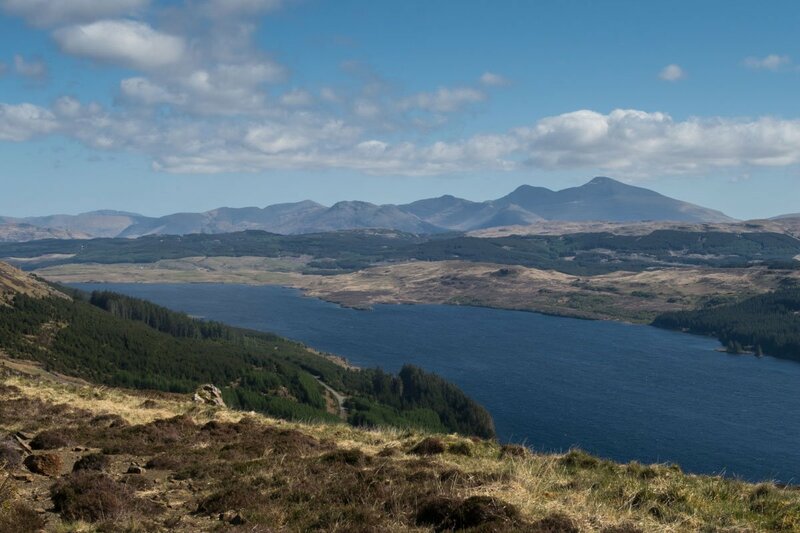 You will find a wide range, from short family walks on Mull to the more challenging routes such as the climb up Mull's highest mountain, Ben More. 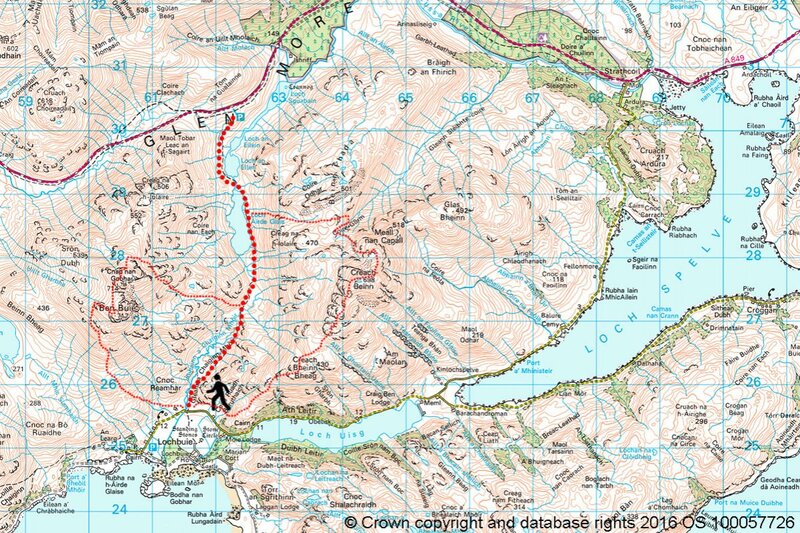 Please note that whilst we indicate 'routes' on the maps in red dots there is not always a visible path on the ground. 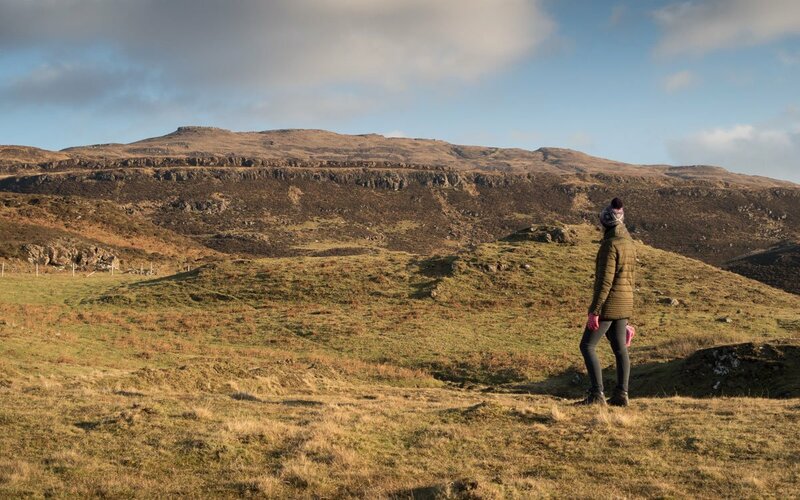 Mull's terrain can be very challenging and the weather changeable, so suitable walking clothing and the right level of experience and navigational knowledge for your chosen walk are essential. 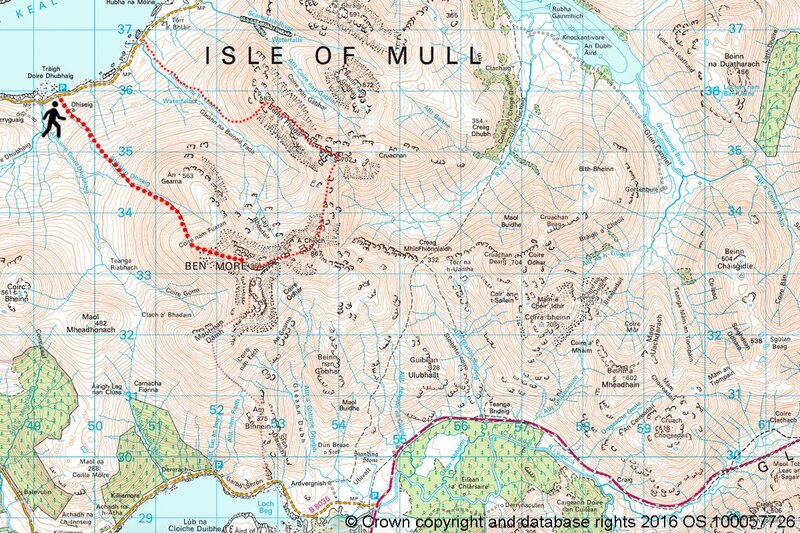 The Isle of Mull is covered by OS Explorer Maps 373. 374 and 375. 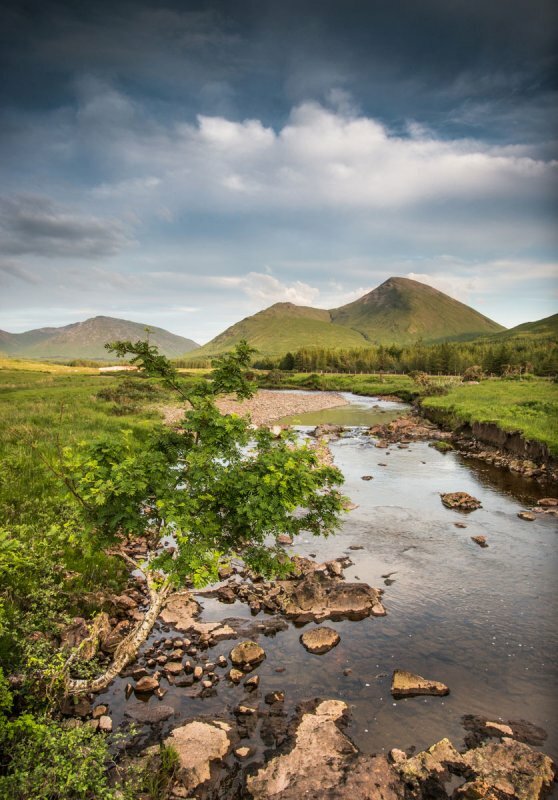 In Scotland the public have a legal right of responsible, non-motorised, access to most land and inland water. 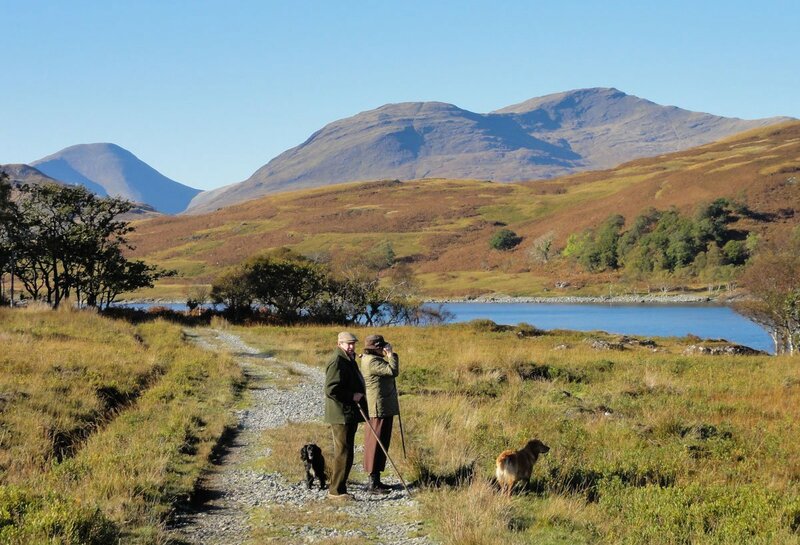 To learn more about your rights and responsibilities we recommend that you visit the Scottish Outdoor Access Code webpage for guidance. If you have a dog there is some useful information to help you ensure that you and your pet have a safe and enjoyable visit in the Practical guide for all - dog walking. 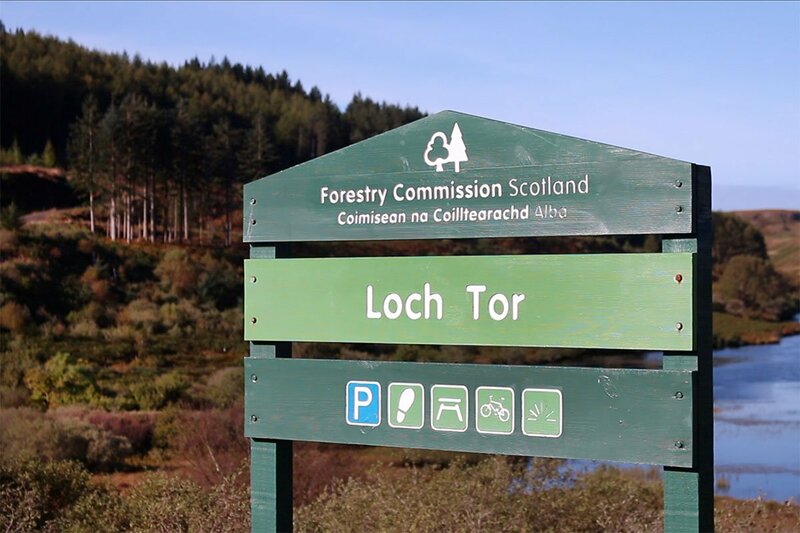 Parking at the Forestry maintained Aros Park, and also accessible via the coastal path from Tobermory, a number of well-maintained tracks explore the deciduous coastal woodlands and many dramatic waterfalls that surround the pretty freshwater Loch a Ghurrabain. This is a sheltered area, with lush vegetation, open grassy picnic areas, and covered BBQ benches provided for use. Formerly part of the gardens and estate of the now demolished Aros House, many of the paths were used by the then residents. 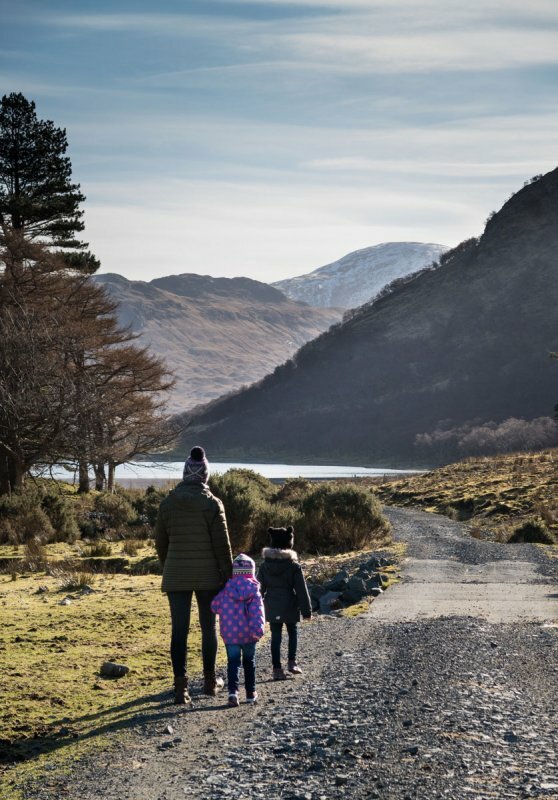 A pretty circular walk around the shore of Loch a Ghurrabain takes around 30 minutes and is perfect for a family walk. 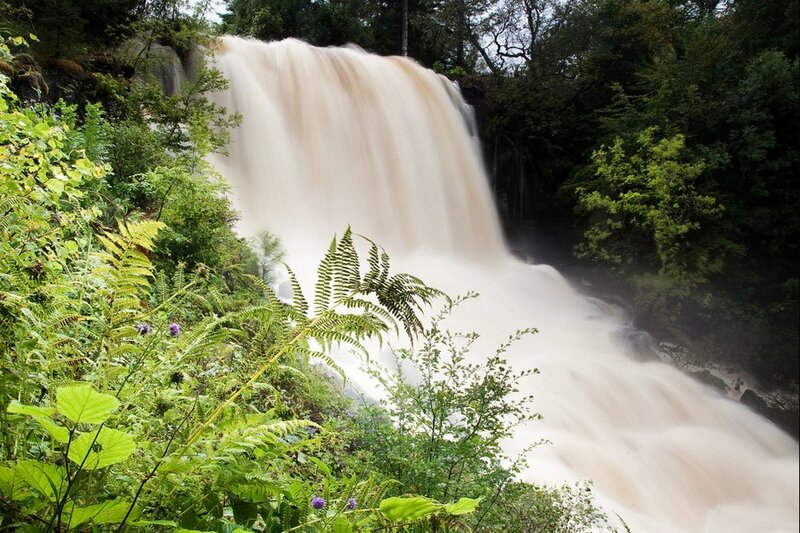 After heavy rain, the Aros burn runs in spate and the waterfalls here are stunning. 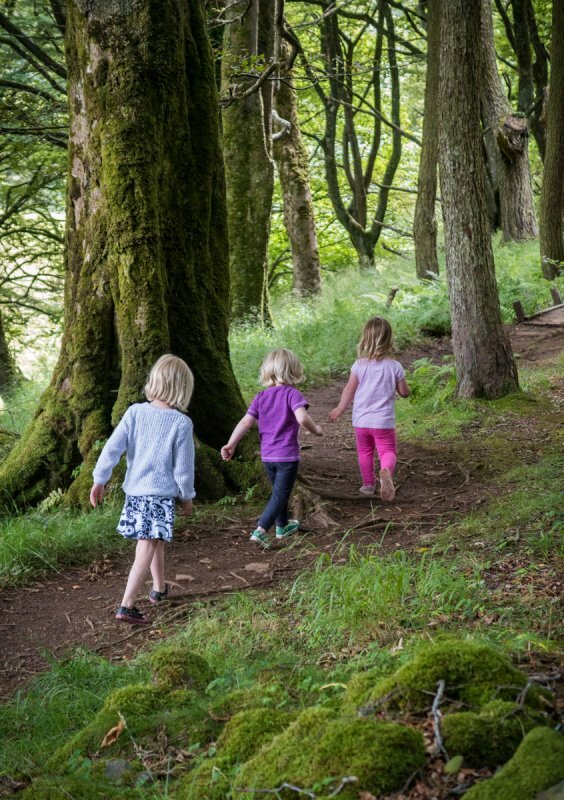 Like Aros Park, Calgary woods makes for a great short walk for families and children on the Isle of Mull. 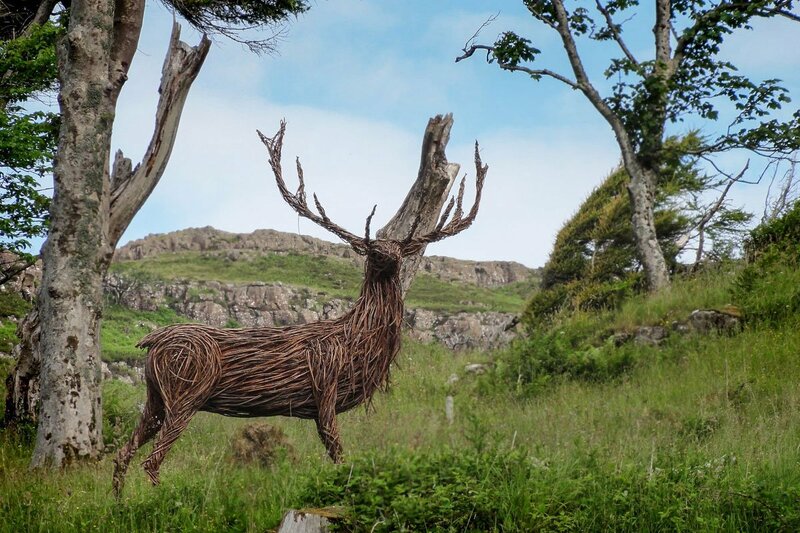 Parking either at the beach or the carpark at Calgary Art in Nature, trails weave through the wooded hillside and you can look out for the sculptural art works that are found throughout the woods. It's a great place for kids to explore, and adults too will appreciate the artwork and superb views over Calgary beach. Calgary Art in Nature has a great tearoom as well as a gallery showcasing local artists' work that is available for purchase. Parking at the old quarry beside the road, follow the track heading west to Port Haunn, passing through the farm buildings taking care to leave gates as they are found. 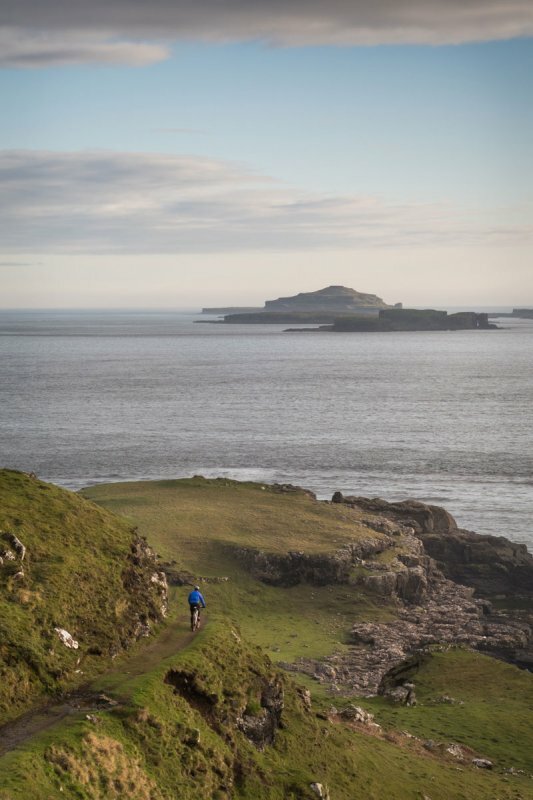 There are nice views over the entrance to Calgary bay, and as the path nears Haunn, you are rewarded with a great view of the Treshnish Isles, which look very close from this area of Mull. Here there is a dramatic section of track as it descends above pebble beaches and rocky headlands down to the coast. The path then continues south along a flat grassy area with cliffs on the one side, and rocky coast and caves on the other. As you near the remains of an old chapel the path heads steeply up hill (a popular place for adders to sun themselves!) 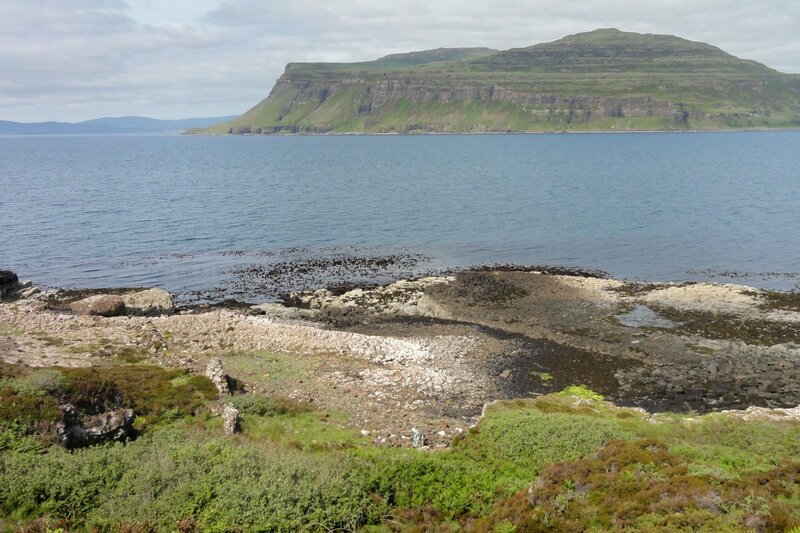 to the ruined cottages at Crackaig. From here the path is followed back to the road, before returning down hill a short way to the quarry parking. 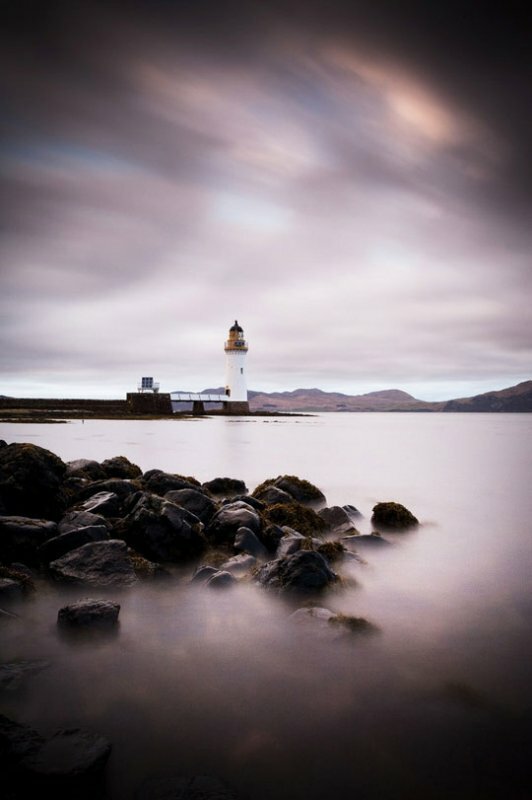 Ardmore Point is the Isle of Mull's most north easterly point, lying just to the north of Bloody Bay. The point itself is home to a signalling light and a path leading here gives great views across to Ardnamurchan and into Loch Sunart. From the car park a forestry commission track heads north descending towards the sea as you go. There are lovely views as you pass between forest and cleared areas. From the old clearance village of Penalbanach you can head down to the shore following a smaller path and passing a few picnic benches along the way. 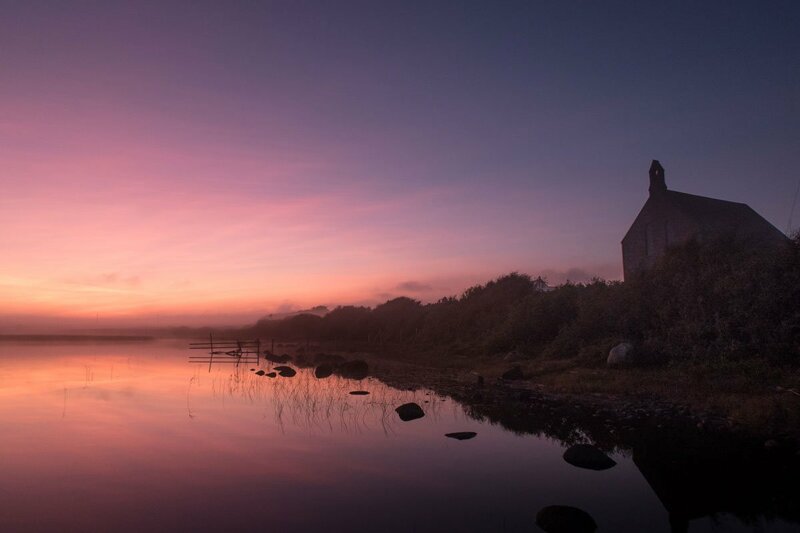 You will also find a wildlife hide at the shore here with provides a sheltered spot for a bit of otter watching! 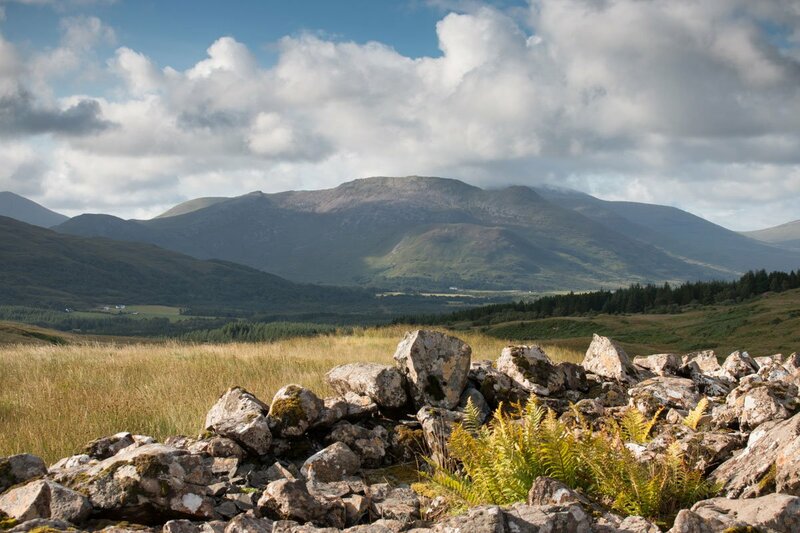 This walk offer a scenic route around the locality of Aros just to the north of Salen. 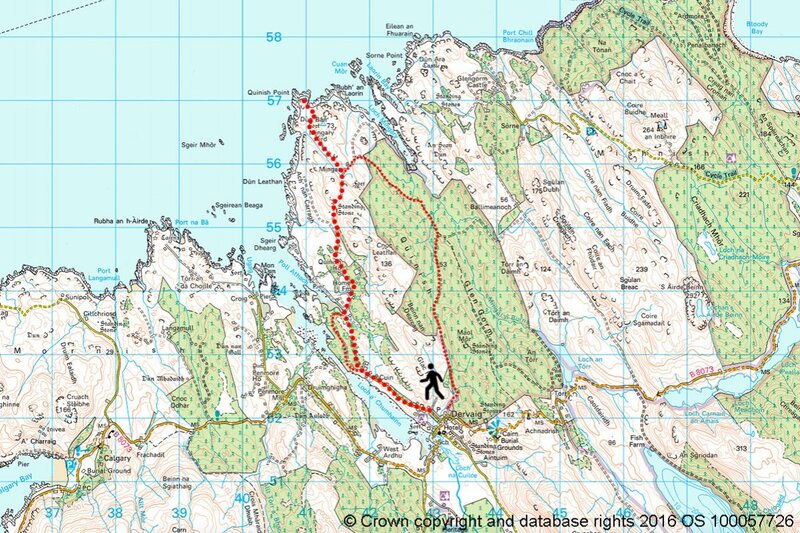 The route follows a good track that contours along the hillside giving great views of the Sound of Mull and passing old cherry trees along the way! 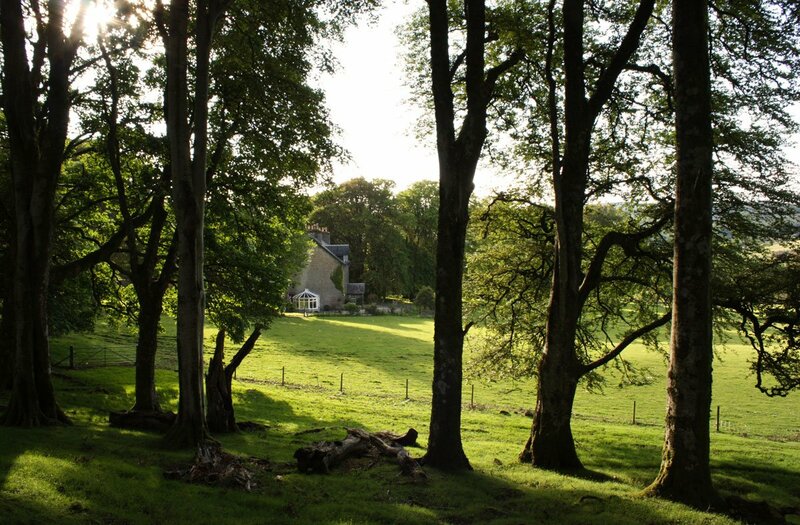 As you near the buildings at Glenaros you will see the beautiful stone build Glenaros house come into view through the trees. 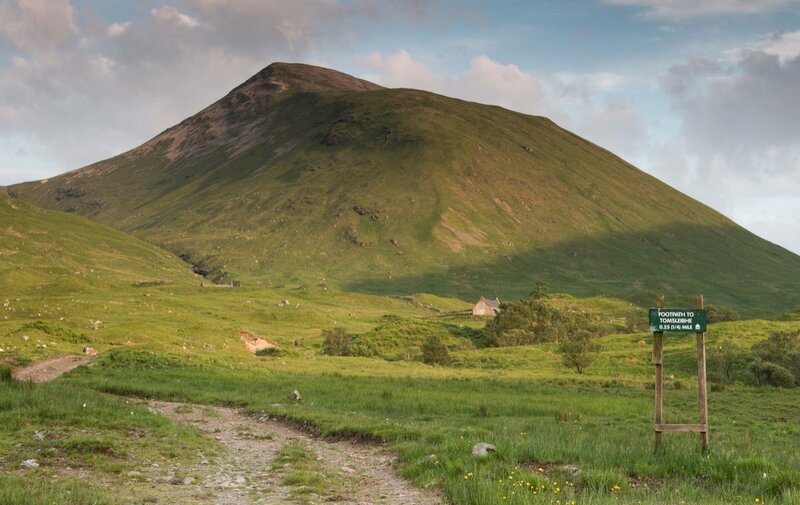 The path up to the Iron Age fort set off behind Kate's Cottage and follows the hill to the summit of Cnoc na Sroine. 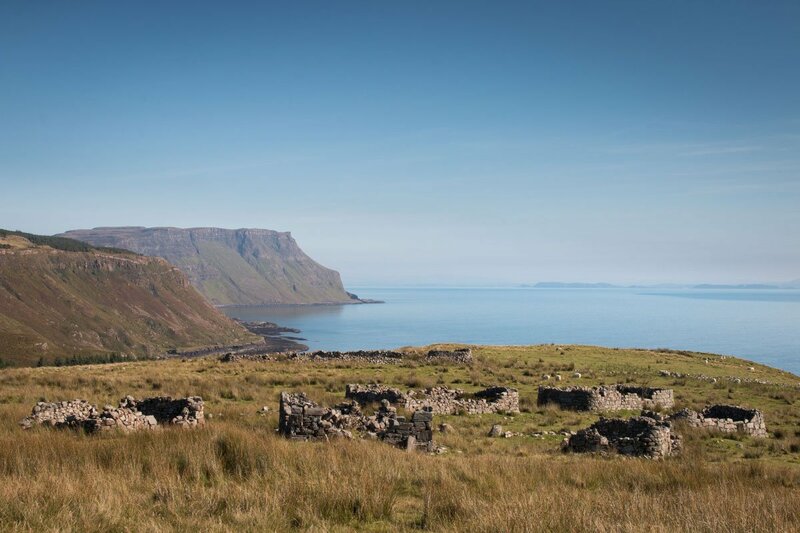 The remains of the fort are clearly discernible on the ground and the advantage of such an elevated position becomes clear as you absorb the breath taking panoramic views of Mull. The walk is best done as a circular route - using the road to return to the start. 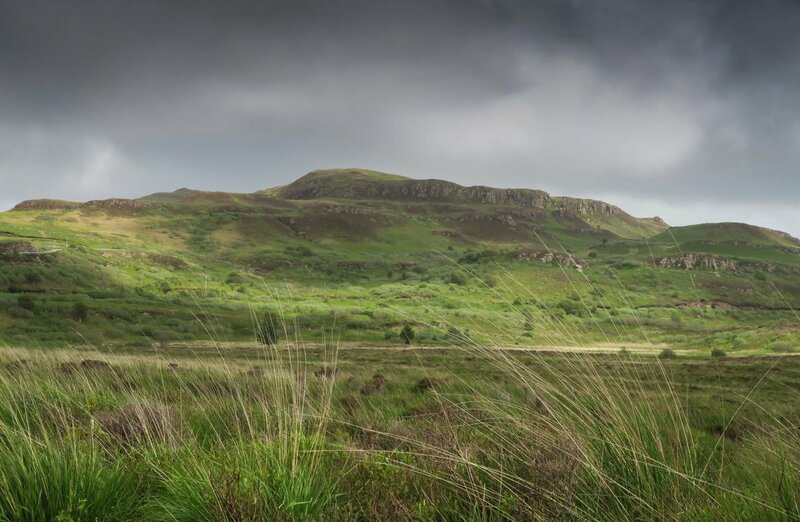 This enjoyable circular walk takes in some of north west Mull's hill country, with an ascent of Beinn na Drise (424 m) and Beinn Bhuidhe (387m). 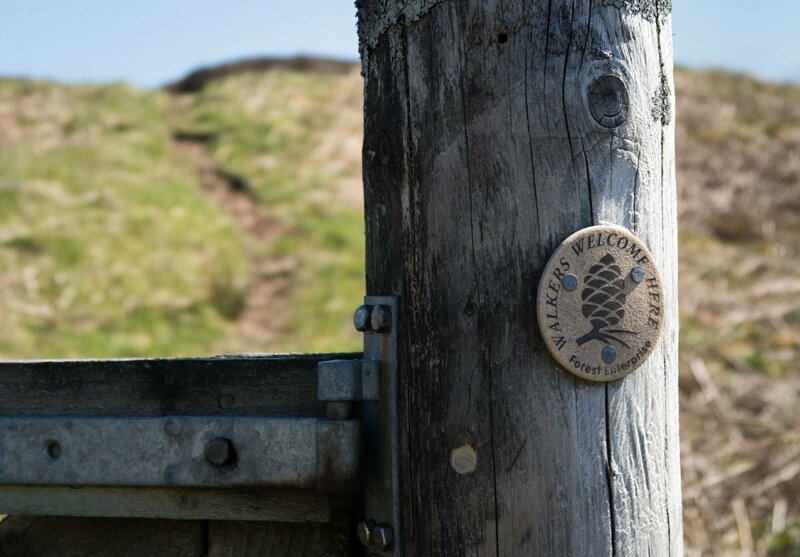 The walk starts by following the track that climbs up above the farm at Lagganulva, passing behind a couple of cottages, continuing to gain height until pricking up the course of the upper park of Laggan Burn. 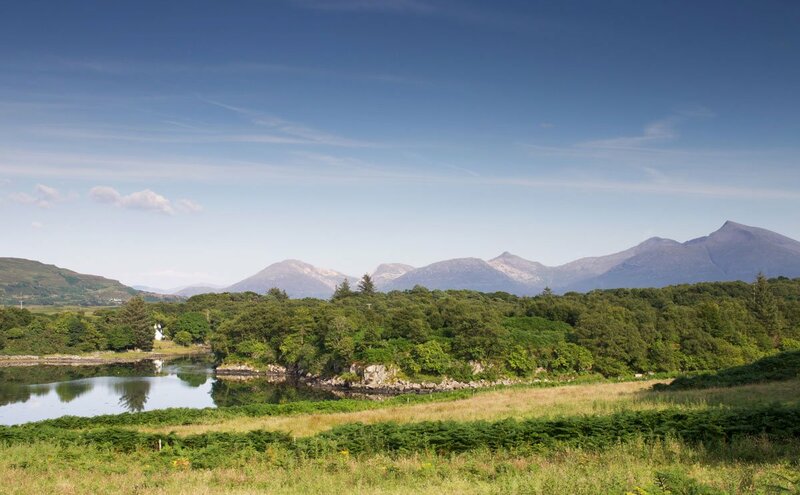 There are excellent views over to Ulva as well as Mull's mountains and the route passes by the remains of old cottages near Bruach Mor. 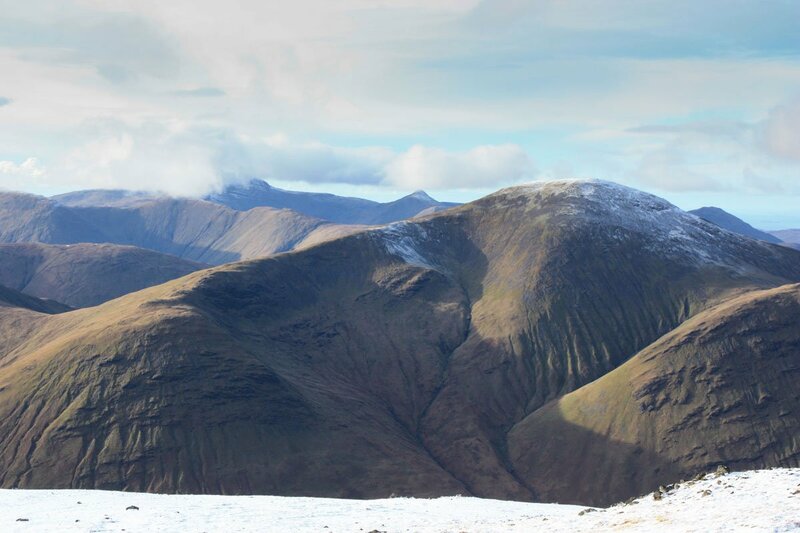 Upon gaining the summit of Beinn na Drise (marked by a trig point) you can cross to the neighbouring peak of Beinn Bhuidhe before reaching Caol Lochan and following the flowing course of Eas Fors down the hill. Eas Fors has a series of beautiful waterfalls that end downstream of the road (and parking area) in a spectacular fall into the sea at Loch Tuath. 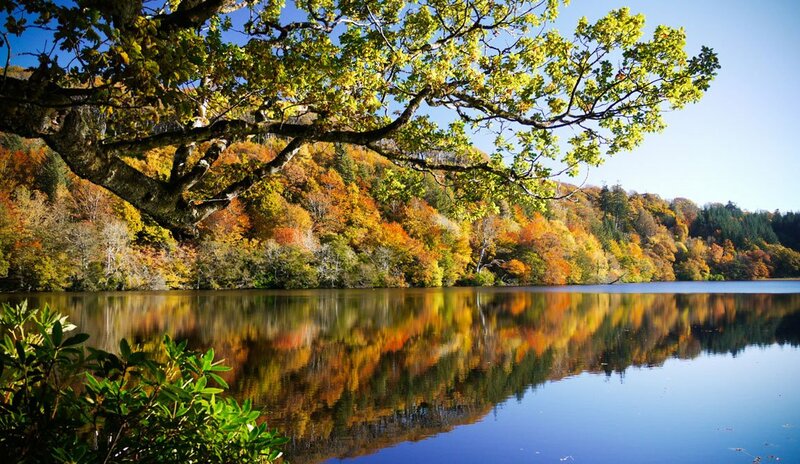 Loch Frisa is the largest freshwater loch on the Isle of Mull. A track runs along the full length of the eastern side, so walks can be started from either the north our south ends. The route is clearly marked and popular with bicycles too. 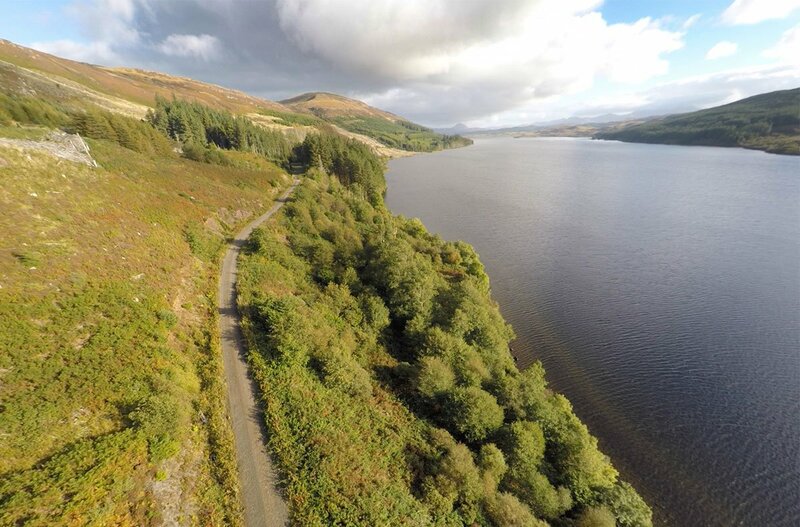 You pass through areas of forestry plantation and clearings with views over the loch and surrounding hills. 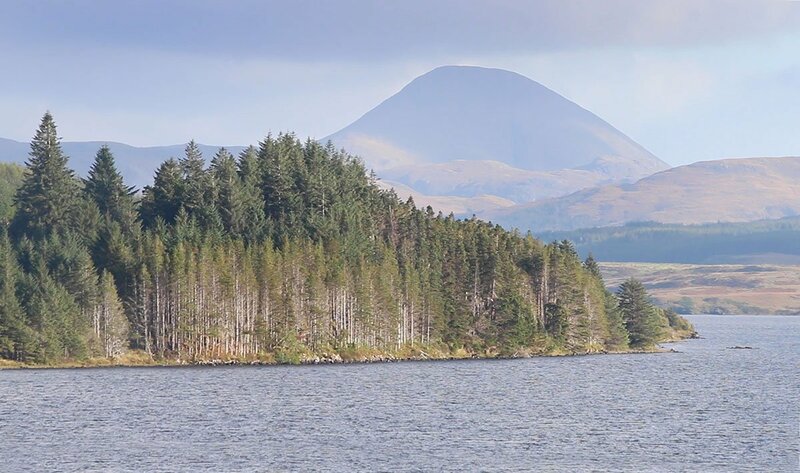 It is a great area for seeing wildlife, particularly eagles, which are often seen flying over the waters of the loch. 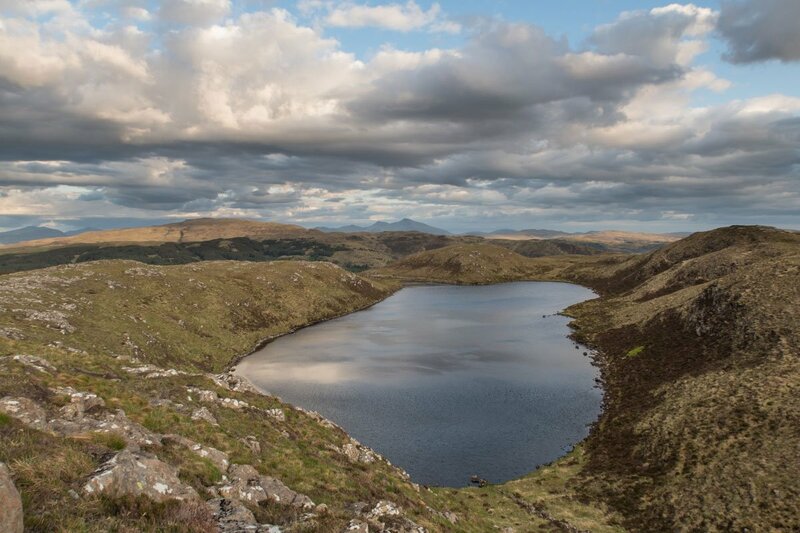 Loch Frisa lies in a hollow and is secluded from motor traffic, in fact the loch is only really glimpsed from along the Dervaig to Tobermory road. 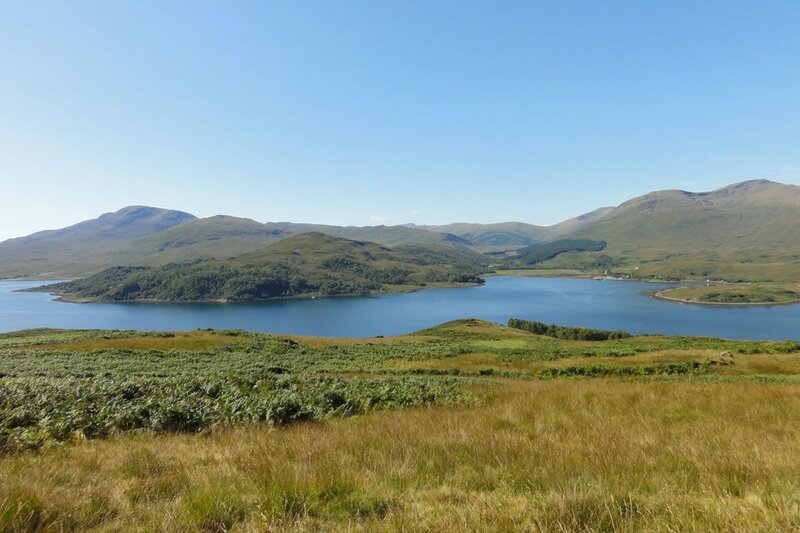 The surrounding hills are gentler than the south Mull peaks which you have good views of, when looking south down the loch. There is ample parking at both ends of the loch though there are more spaces at the northern end below the pass of the snakes. From Dervaig follow the road as it heads north above Loch Cuin over which there are great views including the distant summit of Ben More. The road becomes a track which passes through a gateway entering mature woodlands. 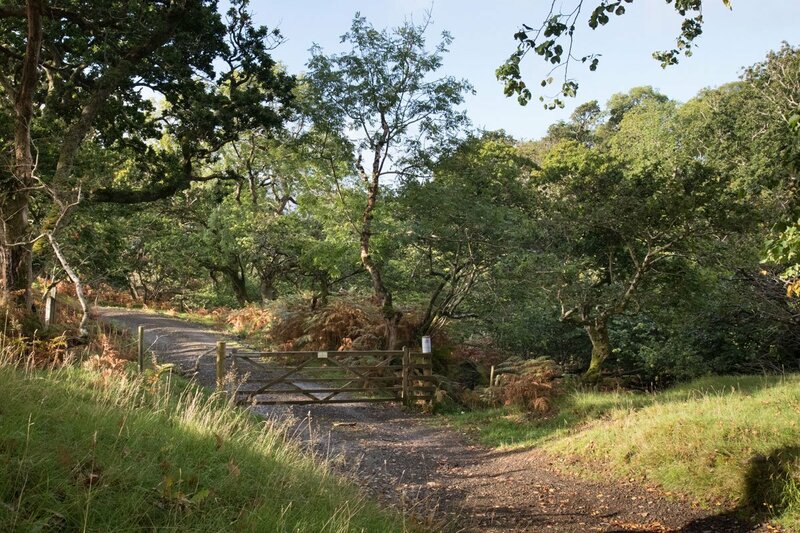 There are a wide variety of trees and mosses in the woodland and the track descends to a bridge at an inlet of the sea (here there is a shorter option of turning left, looping back on yourself through the woods start of the gravel track). 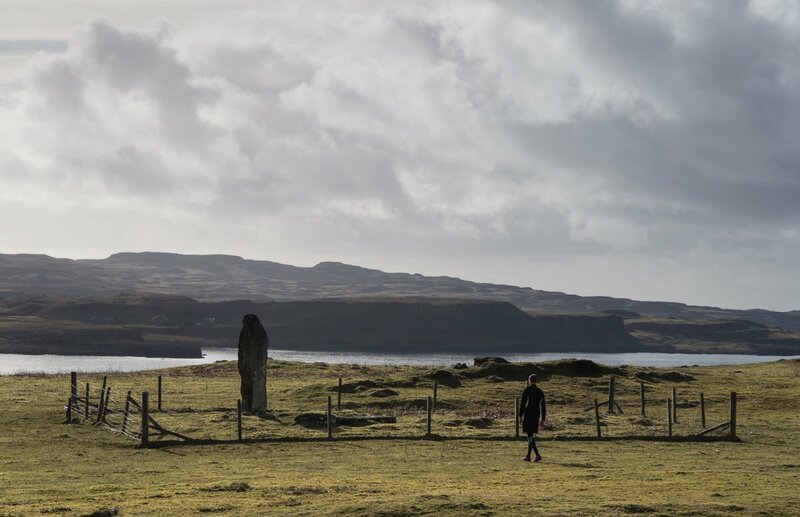 If you choose to continue on, the farm steading at Quinish the track rises and crosses open country with great views over the open sea and Coll in the distance. 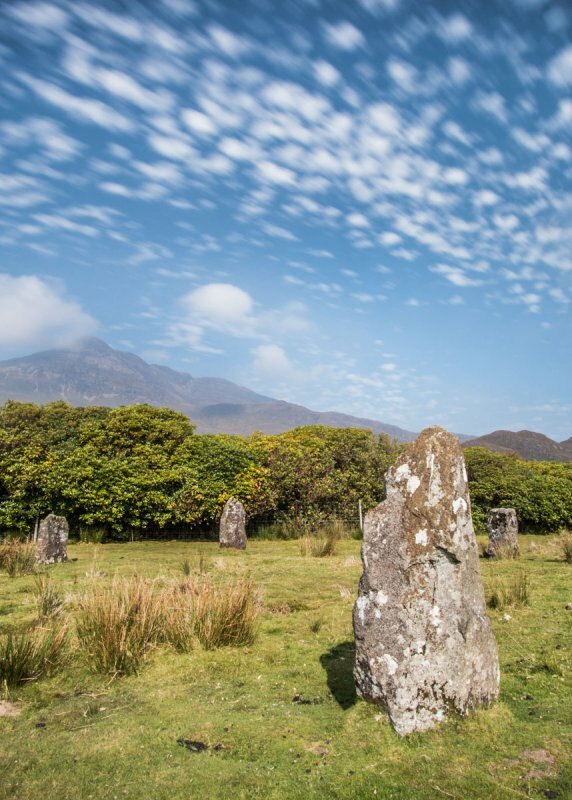 Upon reaching a group of standing stones, head east. The path rises over the hill and then descends toward the farm building at Mingary. 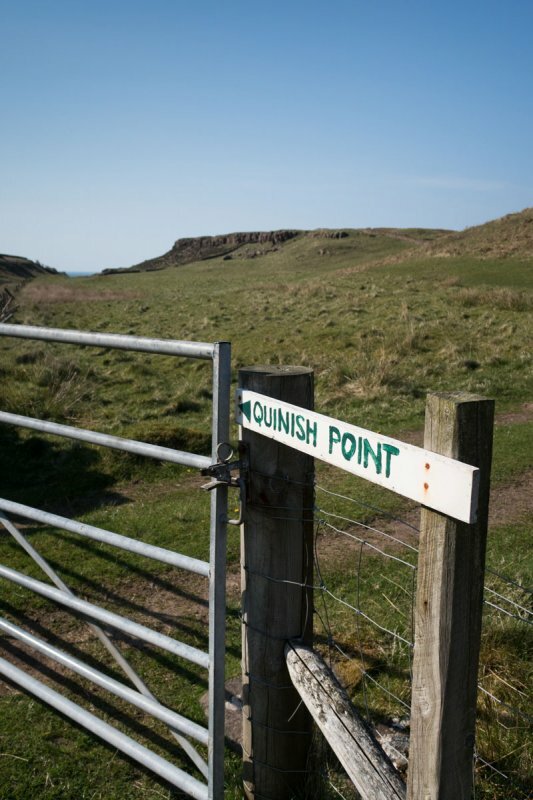 A sign points to Quinish point where two spectacular rocky headlands. 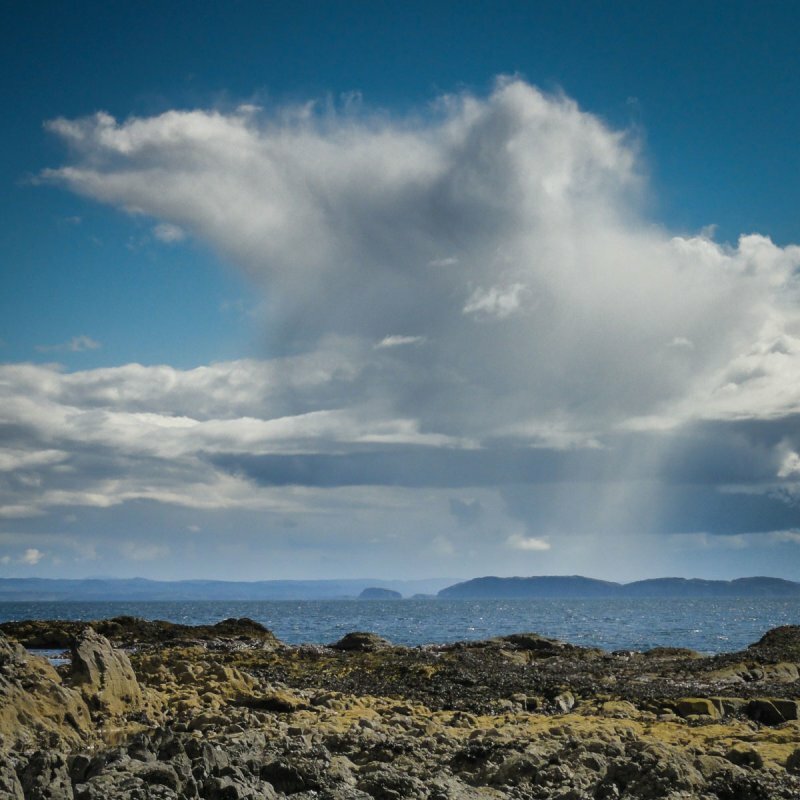 There are fantastic views over the sea with Ardnamurchan lighthouse; Coll and Tiree visible. 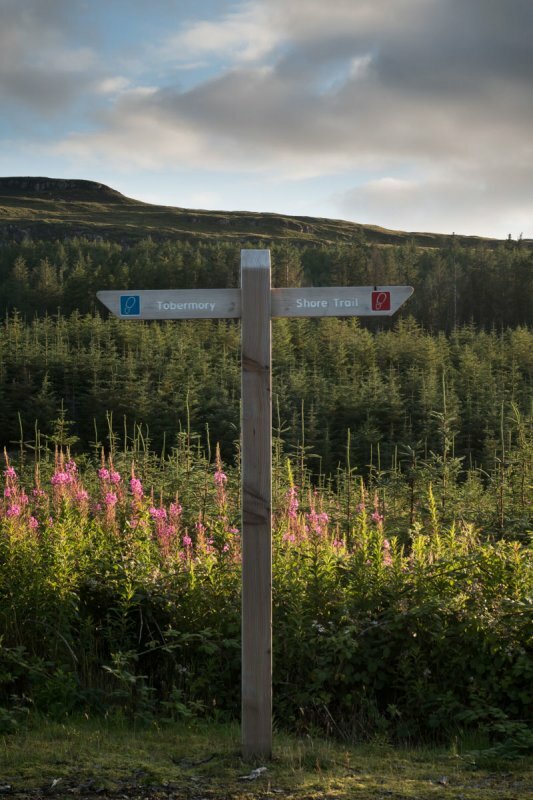 Those wishing to make the walk circular can follow the woodland track at Mingary which heads through forestry plantations and clearings back to Dervaig. 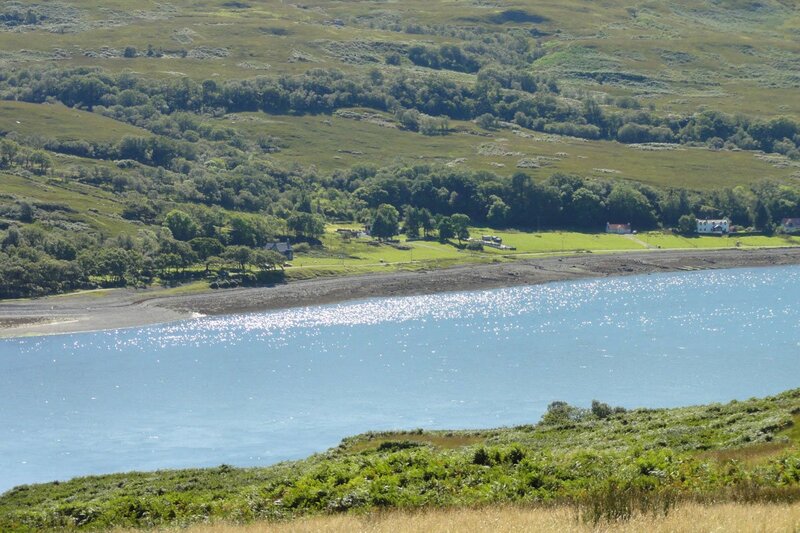 Along the road between Tobermory and Dervaig you will find Loch Torr, a small freshwater loch. Parking at the forestry car park the track rises above the loch before reaching a wildlife hide. 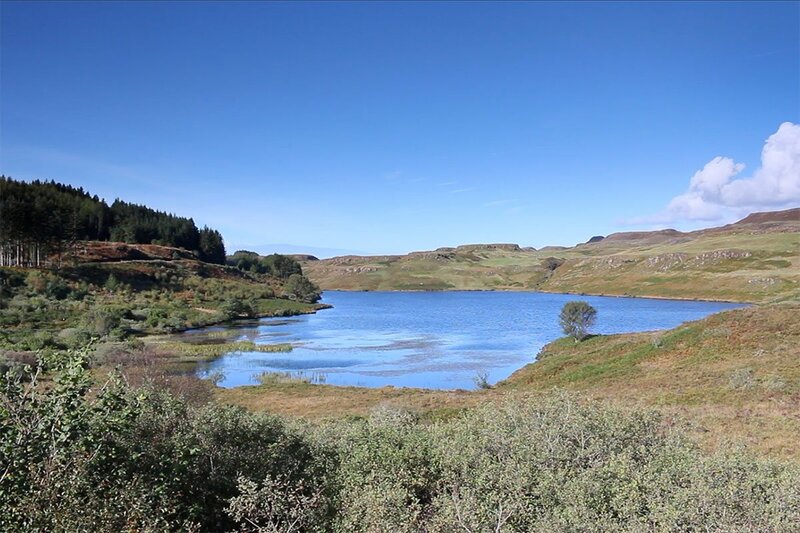 This is the hide that was formerly at Loch Frisa and provided a viewing point for Mull's famous eagles Skye and Frisa. 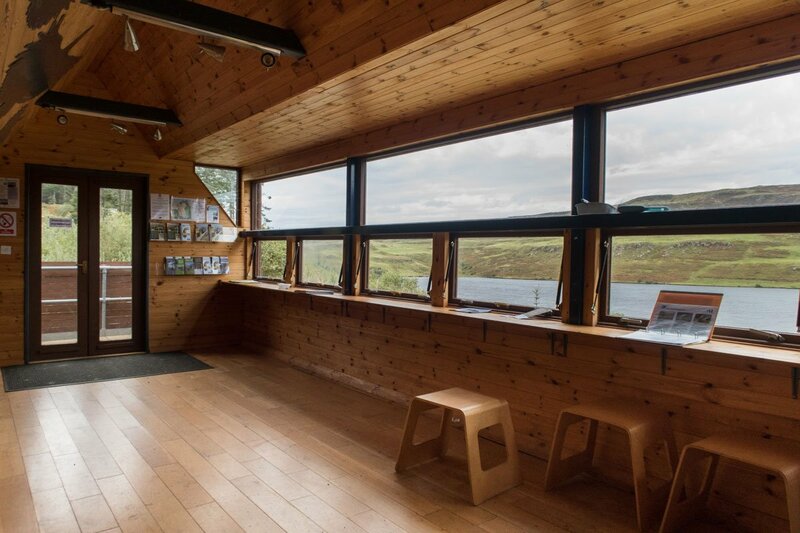 You can enjoy great views over the loch from the hide which also carries information and leaflets about Mull's wildlife. From here the track continues through areas of cleared and planted forestry before descending to Mingary Burn and crossing over. Continue along the track taking the turn back towards the road and Loch Frisa before then returning to the parking area. 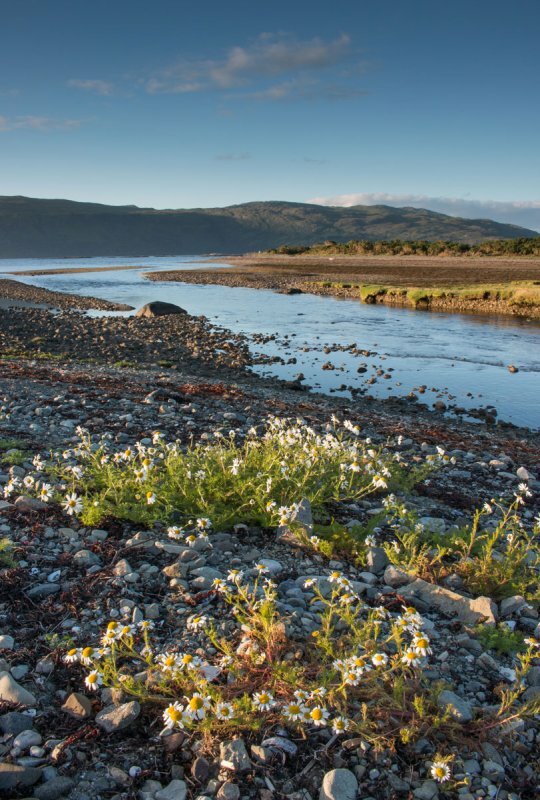 Aros Estuary is a beautiful tidal inlet into which the river Aros flows, passing underneath two bridges at the head of the estuary. 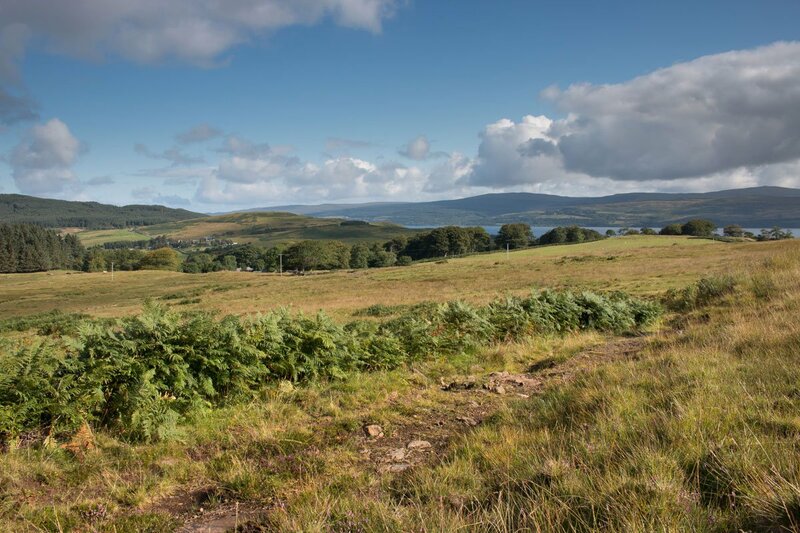 The fields beside the estuary are also the site of the Salen Show, organised by the Mull and Morven Agricultural Society each year in August. 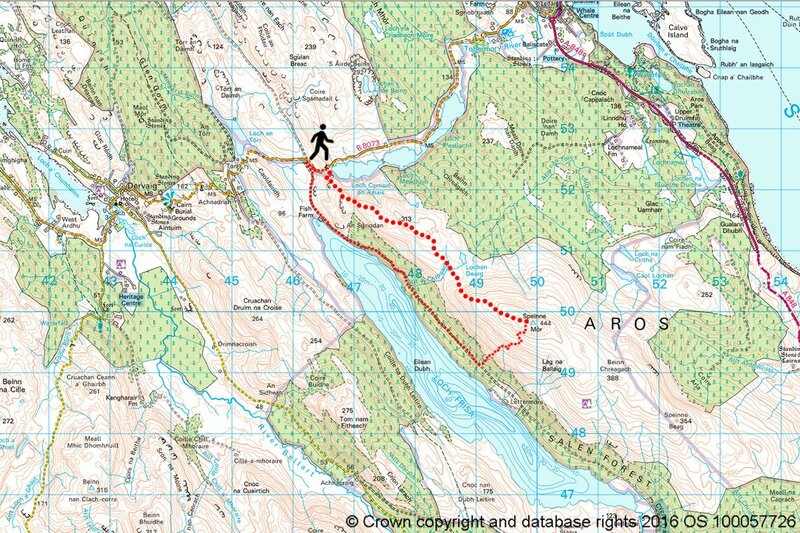 The short loop around Aros castle is an enjoyable and easy walk with nice views and a good chance of seeing wildlife. 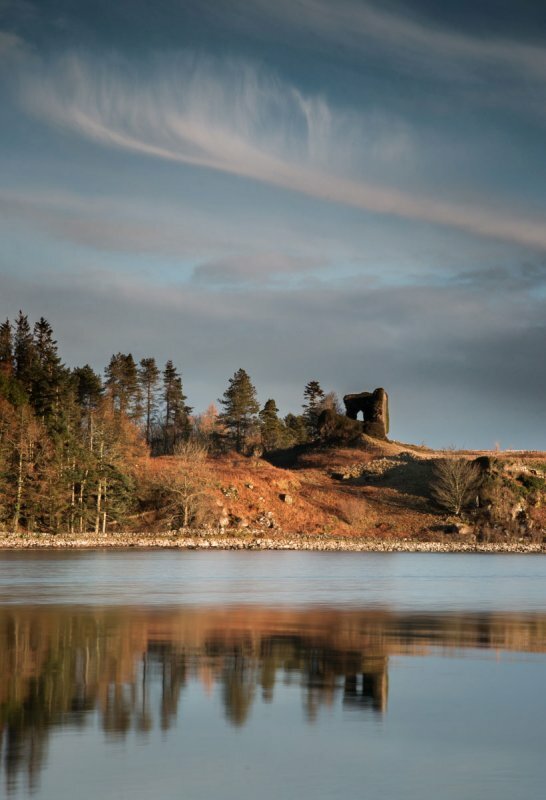 The 13th century Aros castle (now in ruins) was once of vital strategic importance on Mull. The path follows the coast below the castle where there are some nice shingle beaches. The area around the castle is rich in plant life and mature trees. 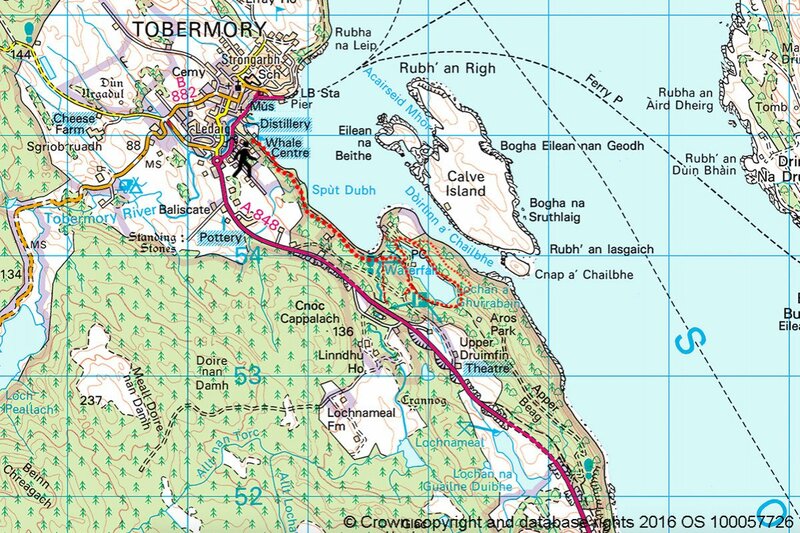 This is a cracking walk that starts right from Tobermory's Main Street! 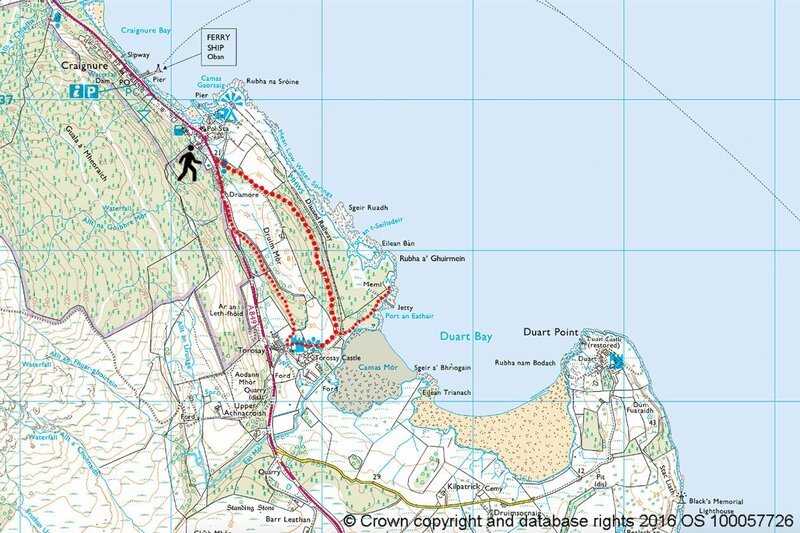 Although not a very long walk the route does cross some steep terrain, and the way can be boggy underfoot so due care is advised. 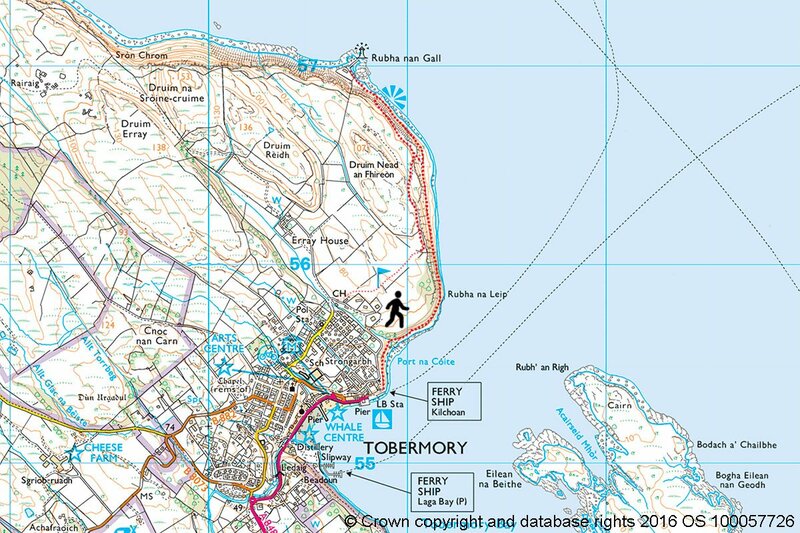 You may choose to reach the Lighthouse by taking the high route that starts near Tobemrory Golf course instead (see map). 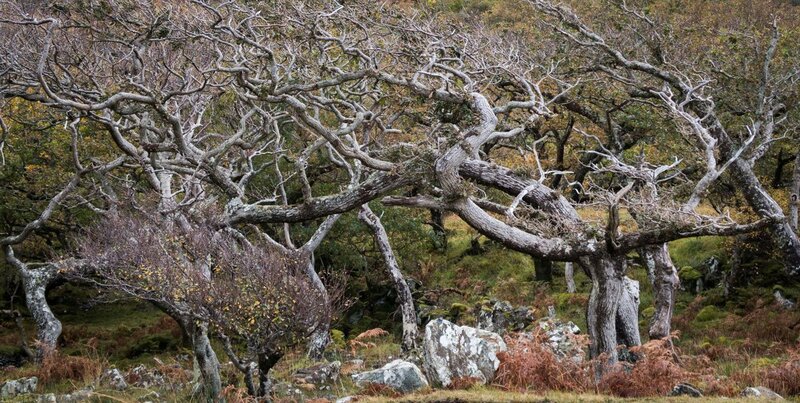 The walk begins by heading north following the coast and passing through some stunning mature Atlantic Oak woodlands. 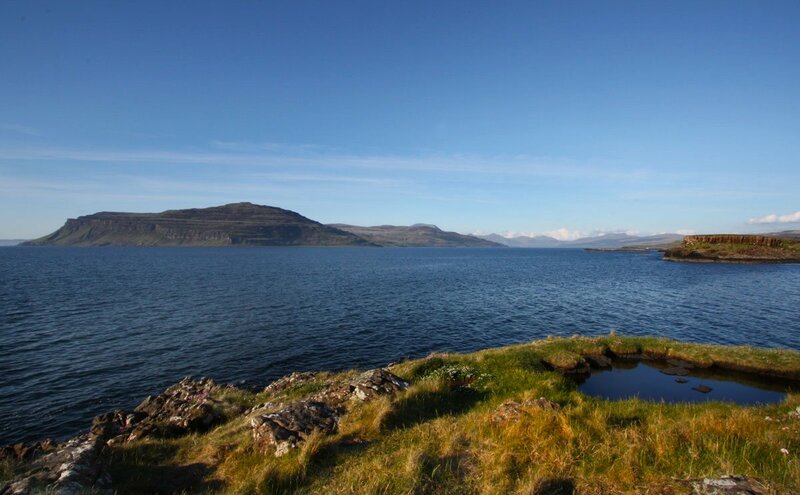 There are wonderful sea views over the Sound of Mull, Morven, Calve Island and Loch Sunart. As you near the Lighthouse the route opens up, leaving the woodland behind and descending to the old lighthouse keeper's cottages. 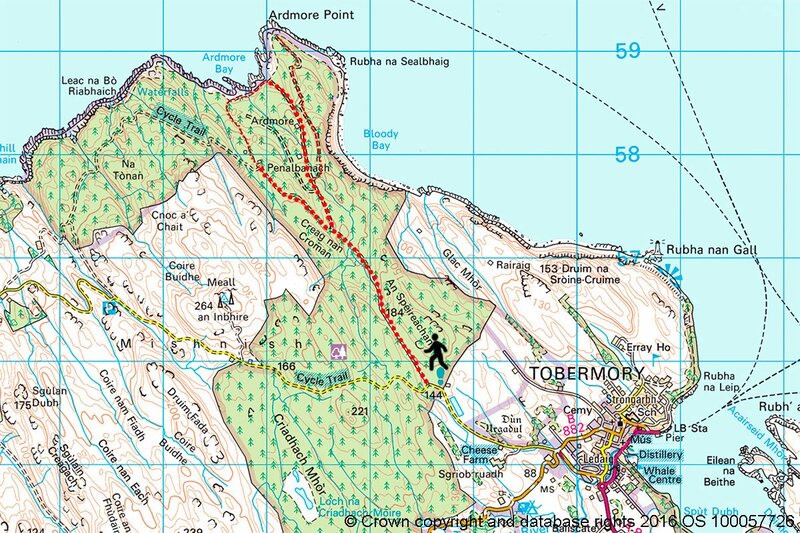 Return the same way, or take the simpler alternative route which stays on higher ground before reaching Tobermory Golf Course. After relaxing at the beach and soaking up the view, you can also enjoy a walk from Calgary beach to Caliach point. 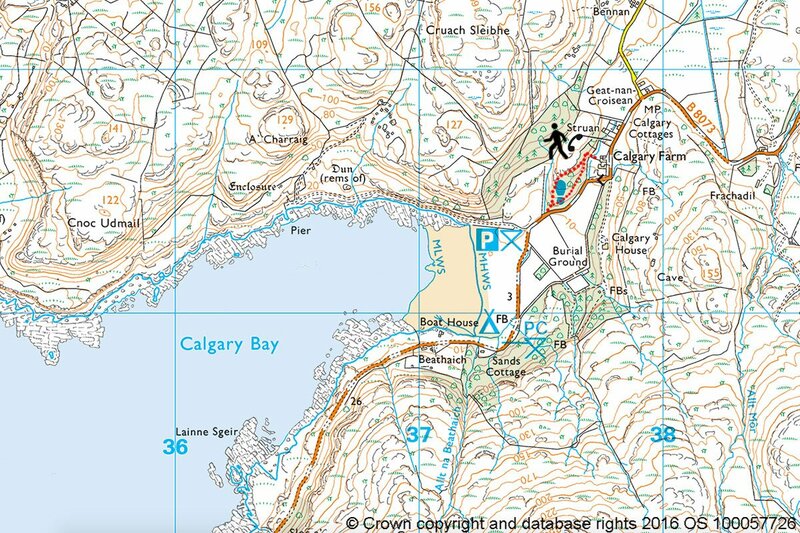 The route starts along the north shore of Calgary bay heading west until you reach the old granite pier. Climbing up the hill a short way, the well-defined path continues westward around the headland. There are breathtaking sea views and in wild weather some big waves break onto the rocky coast below. Heading north the track passes through many well preserved clearance village houses and settlements. 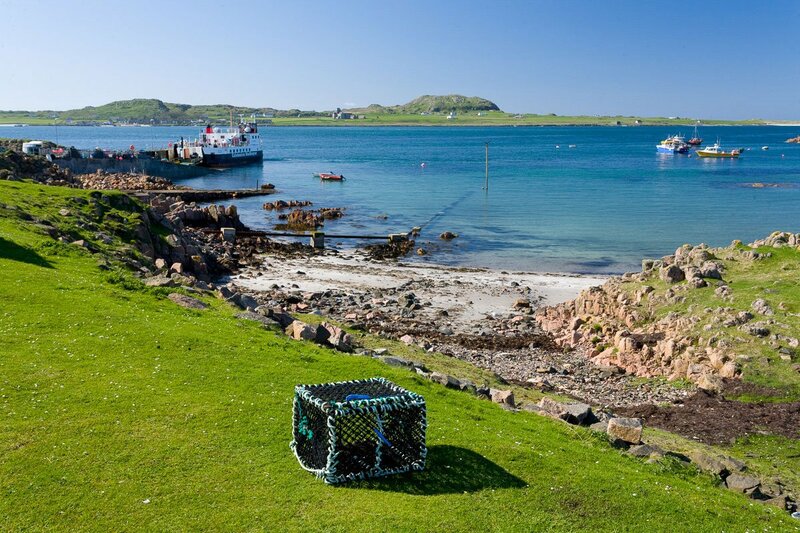 The sea views are excellent with the Isle of Mull's neighbouring islands of Coll and Tiree close by. The track becomes less distinct as you head toward the headland of Caliach point. The headland here is quite exposed and it is a good place to watch out for whales and other marine life passing by. 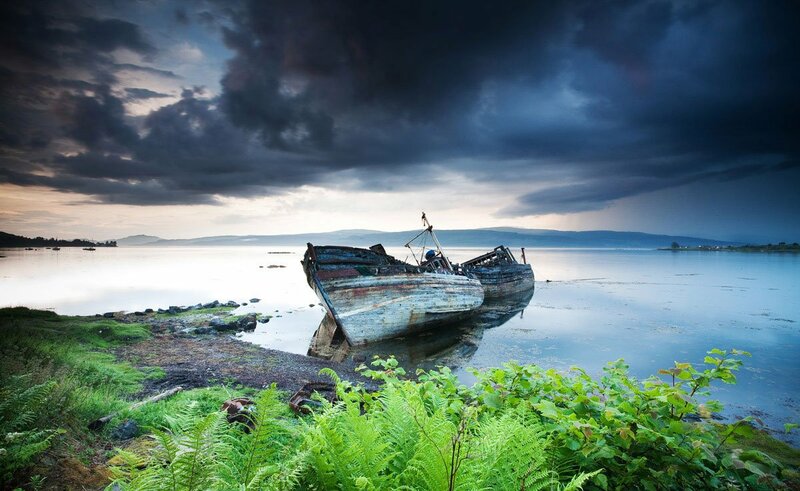 As the road winds along Mull's north west coast offering such amazing views over the sea it can be tempting to stop and head to the shore for a bit of exploration! 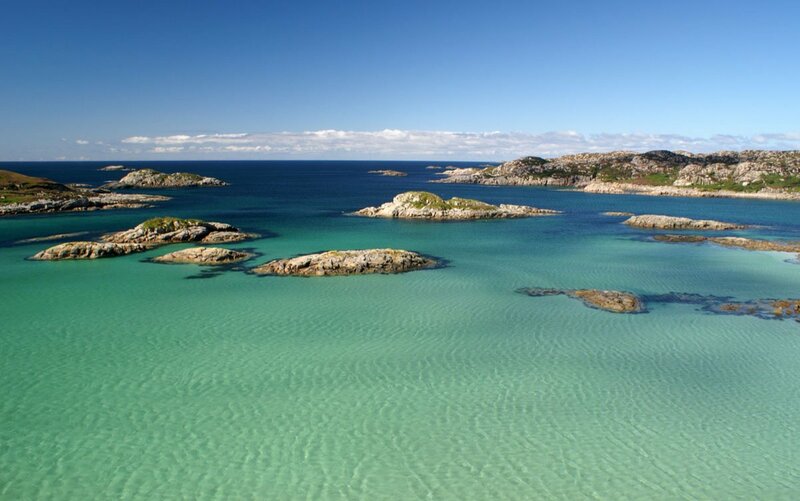 One of the best places to do this is just south of Kilninian. 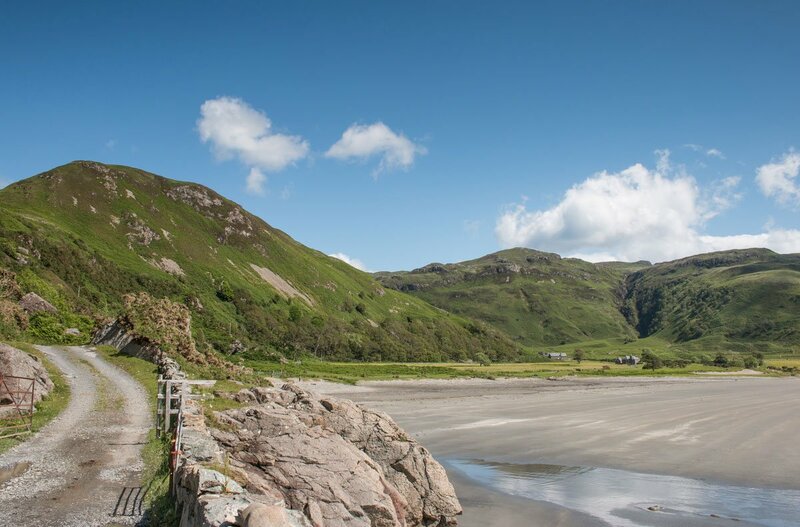 Parking in the layby near the stone bridge that crosses the Allt na Cille you can enjoy a short walk that descends to one of Mull's beautiful beaches Traigh na Cille. 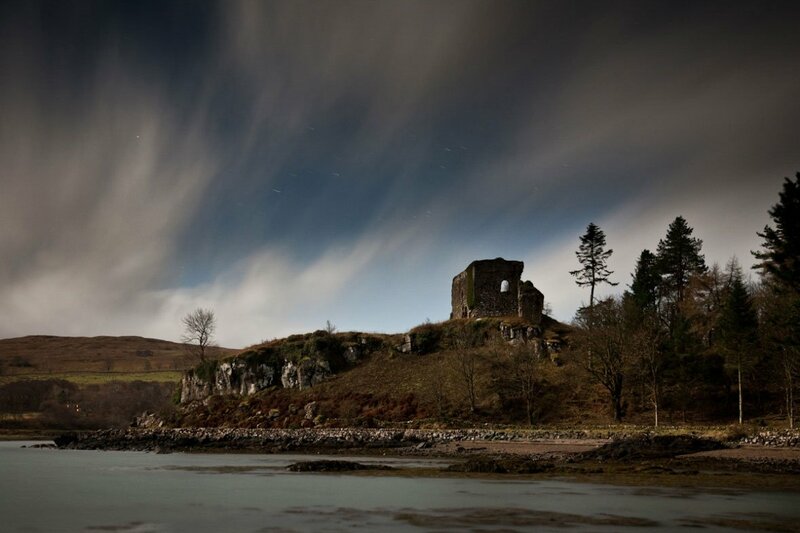 Cille is the Gaelic word which means ‘monastic cell' an indicator of Mull's past and place in Christianity. The track first passes through woodland before descending toward the beach. 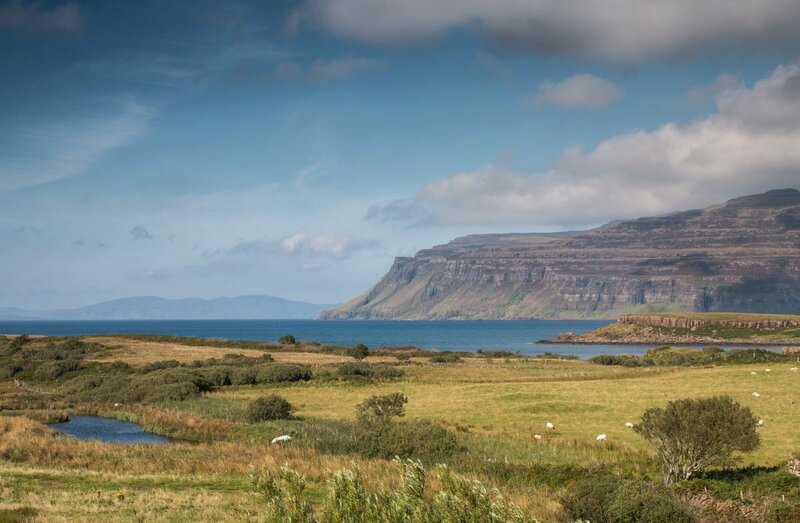 There are superb views across Loch Tuath to Ulva and the Treshnish Isles. 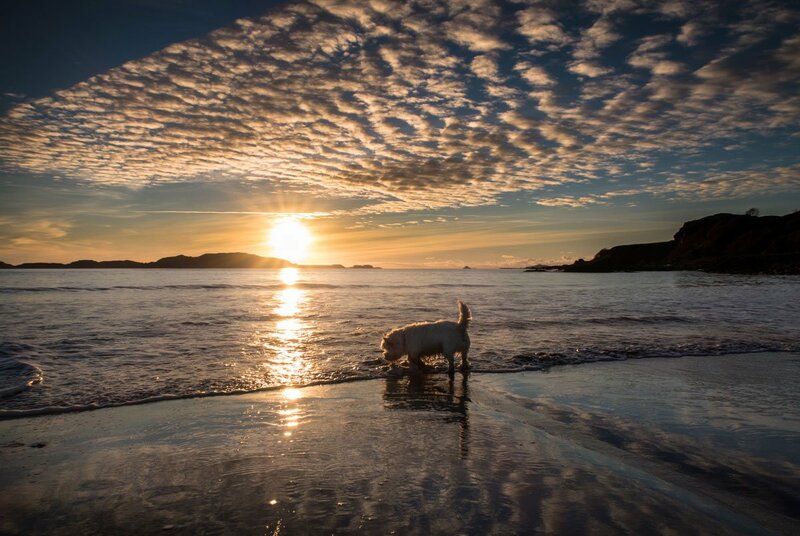 The beach is a great spot to watch winter sunsets, explore the coast and follow the small path that heads along the north shore to Sgurr na Cille. 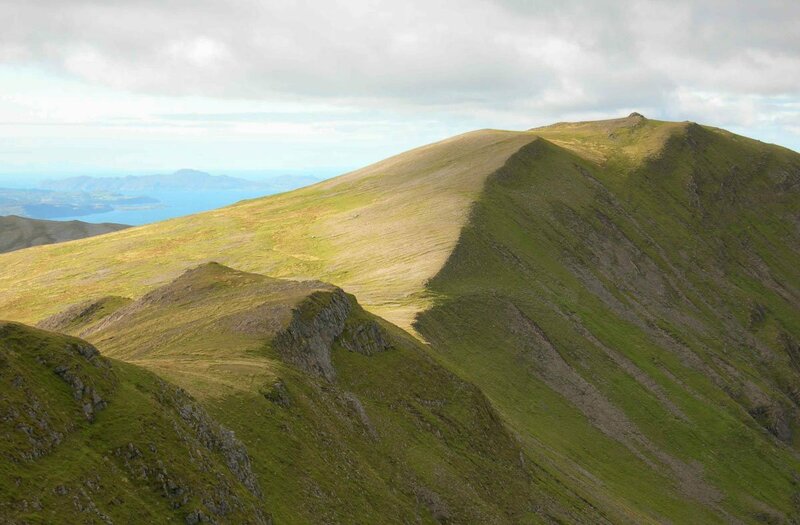 This lovely, short walk is a like a mountain day in miniature! Parking beside the ruined cottage approximately midway along the Mishnish Lochs the path heads up hill parallel to the forestry on your right. The way can be soggy underfoot, but nice views lift the spirits! As you near the rocky peak keep left. The path zigzags before arriving at a stone cairn. From this high point of the 'crater' the view over the otherwise concealed Lochan is revealed, hidden as it is by the circle of the crater. Walk all circle around the 'crater' enjoying the excellent views before heading back down the hill near the old stone wall and rejoining the same path you climbed up. 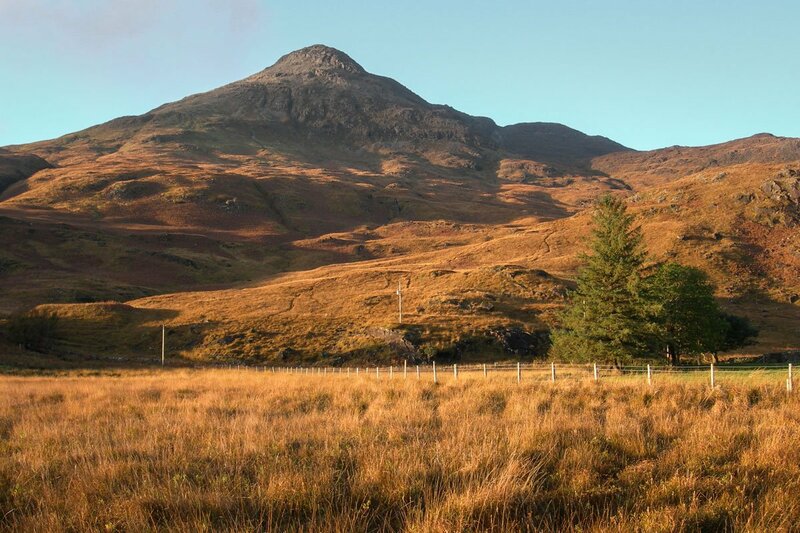 Speinne Mor is north Mull's highest point and though lacking the rugged grandure of Ben More, it does offer a fine walk and panoramic views over the north of the island. 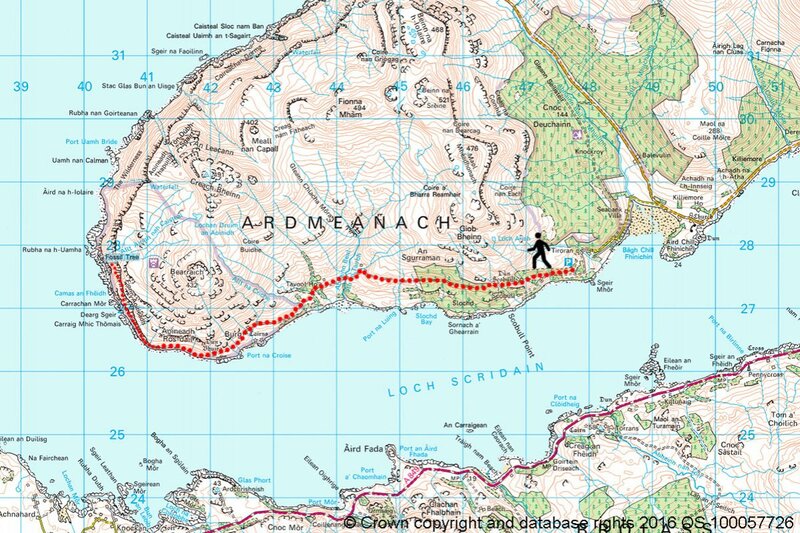 The simplest way to the top starts by parking at the western end of the Mishnish Lochs (along the Tobermory-Dervaig road). 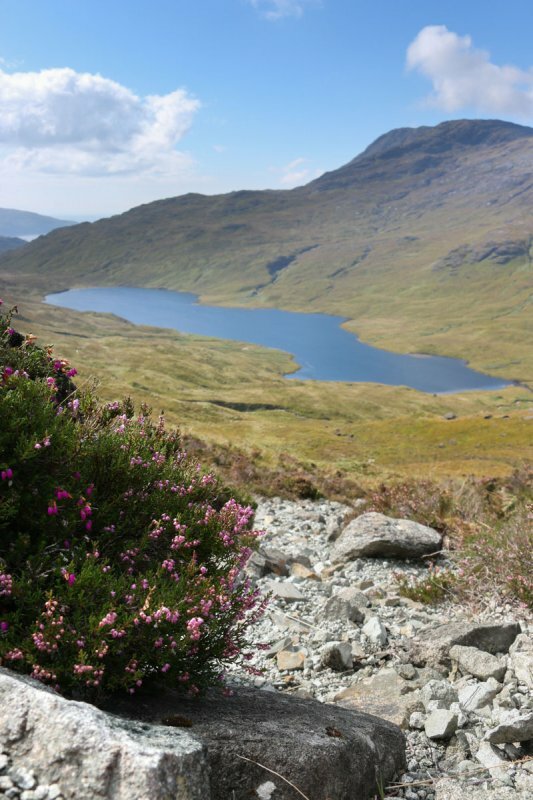 From here a path leads gradually upward over the heather covered hillsides and up to Sron na Beinne Creagaich. Views back over the Mishnish Lochs are great and the path follows the line of an old fence, with views over Loch Frisa now commanding the scene. Ben More and the central Mull hills for a beautiful backdrop as the path continues upward. Passing Lochan Dearg, you make the final climb, crossing the odd patch of scree, up to the summit. 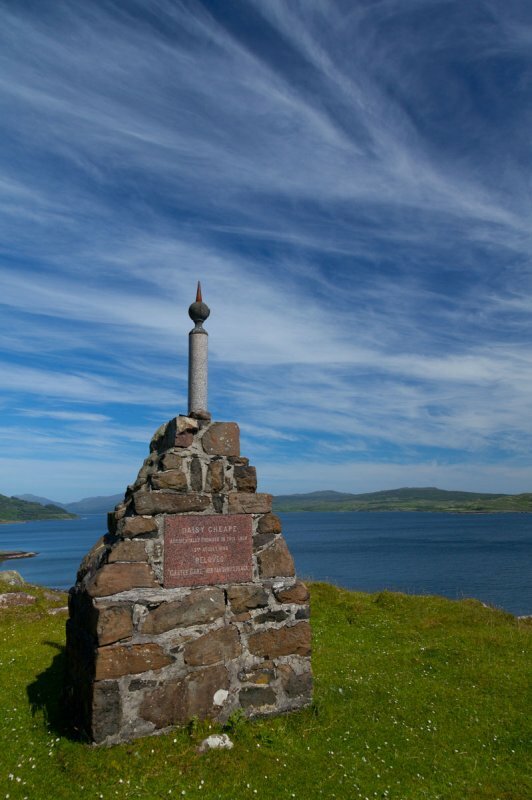 A trig point is circled by a low wall of rocks and the sweeping vista over the north of Mull is fantastic. 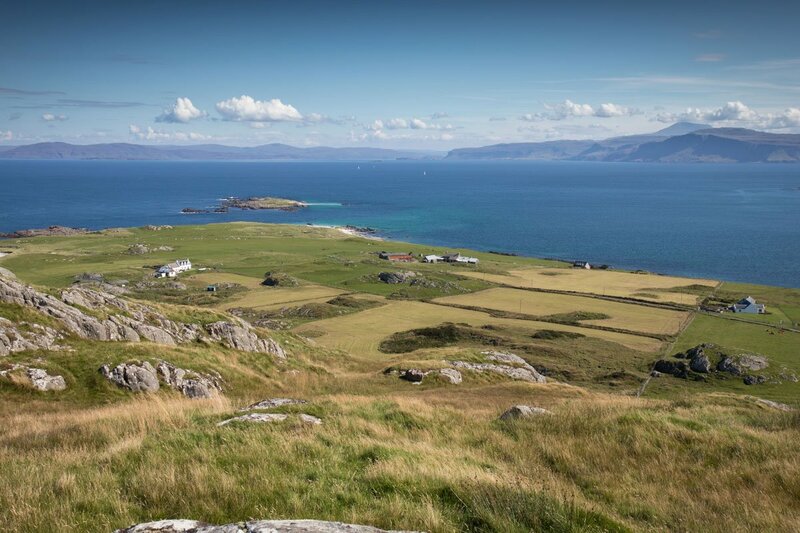 Rum, Eigg and Skye are all visible to the north on a clear day. 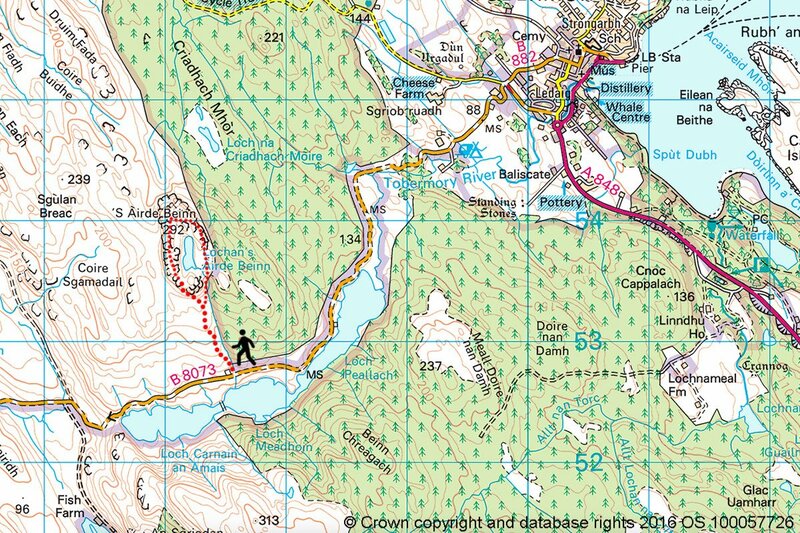 By descending the hillside to Loch Frisa the walk can be made circular, following the track north and back to the road. Alternatively return the same route. 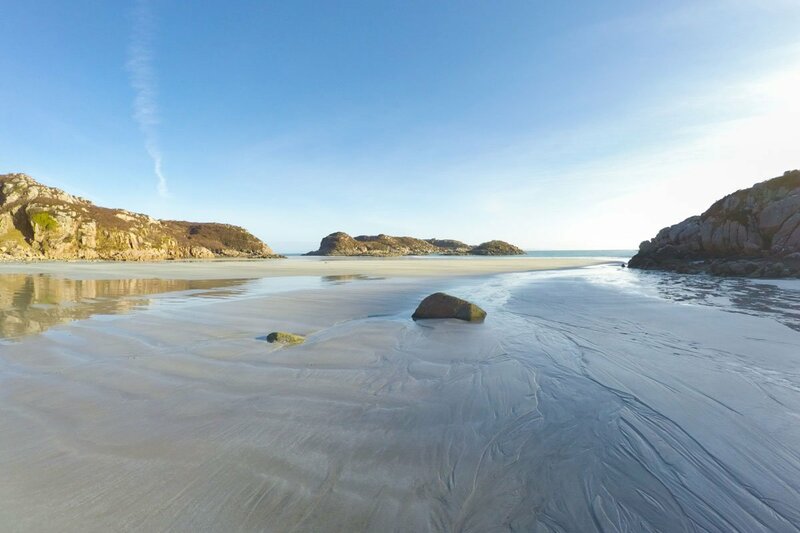 Laggan Sands is the largest sandy beach in the Isle of Mull's south east and is arguably one of the most beautiful on Mull. 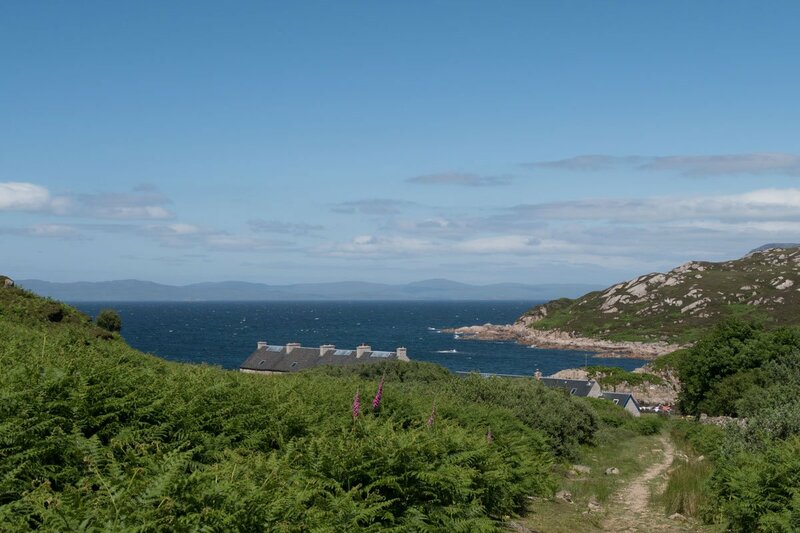 Surrounded by a dramatic mountain landscape and with wide open views out to sea this is a beautiful beach with good walks in the surrounding area too. Parking at Lochbuie there are two good tracks running in both directions along the coast. 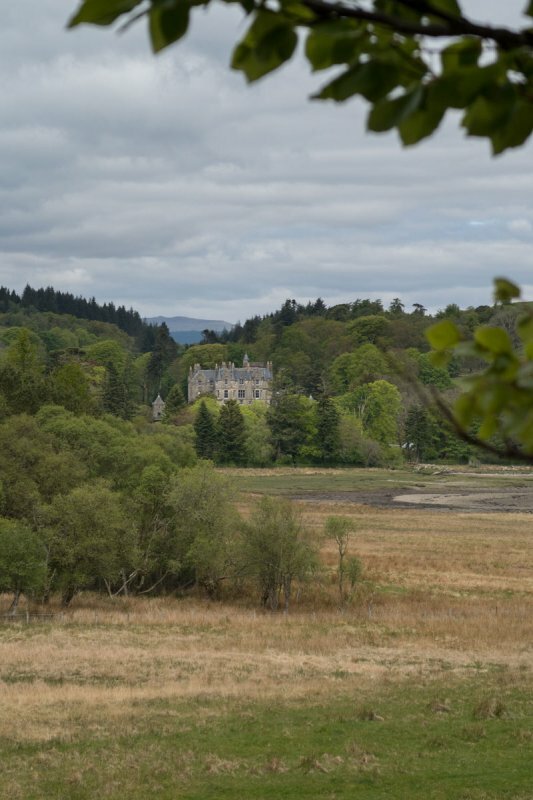 Following the track along to Laggan Sands, the route follows the shore, skirting through areas of woodland and passing Moy castle en route. 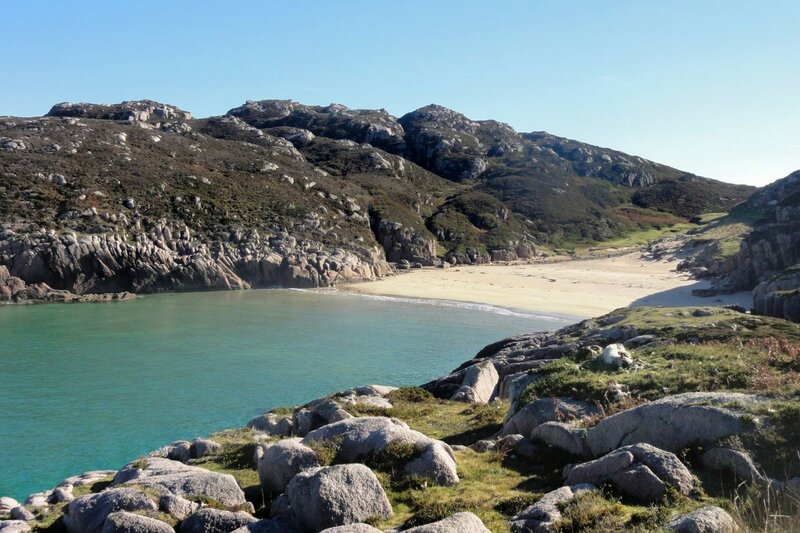 The track continues around the rocky headland and arrives at the large expanse of pale grey sands at Laggan beach. A visit can also be made to the walled mausoleum, before returning back to Lochbuie. Be sure to pop into the Old Post Office where you can find a good selection of home baking, drinks and local crafts. 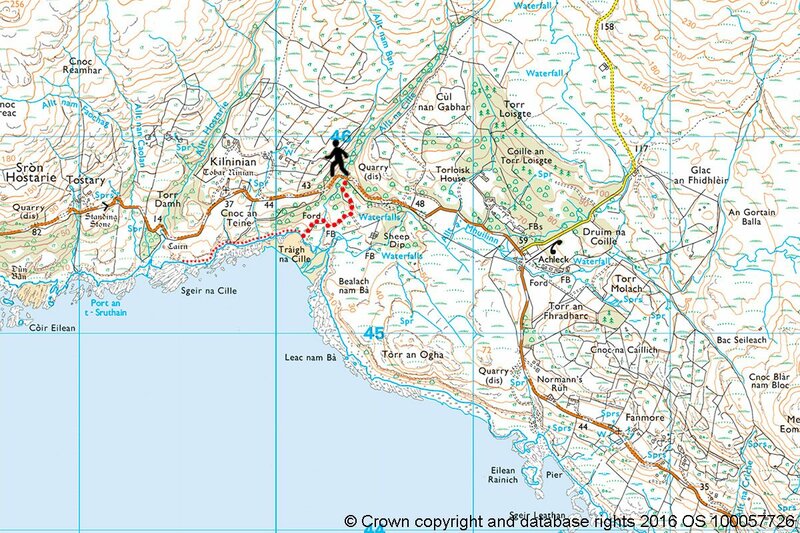 Parking in Craignure, walk south along the road heading toward Lochdon in the Isle of Mull's south eastern corner. Just after you pass the garage take the track on your left which starts at North Lodge. 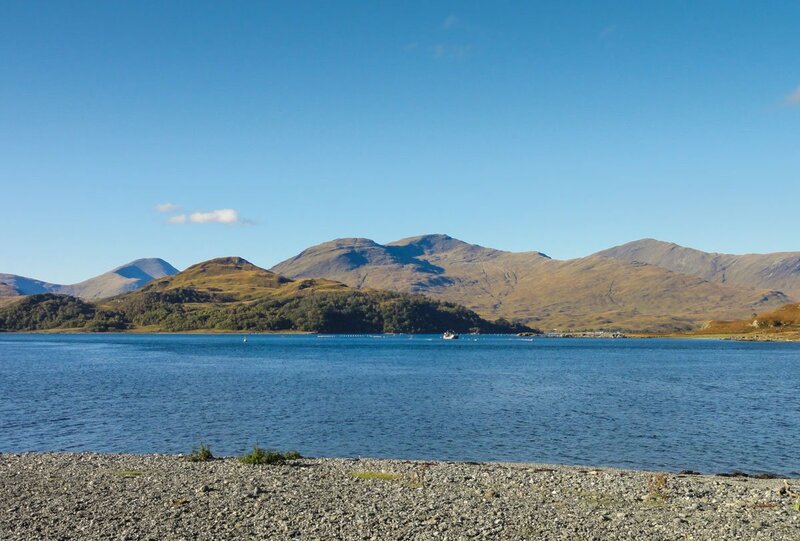 The track climbs a short way offering excellent views over the sea and toward the mountains of the mainland with great views of Ben Nevis. 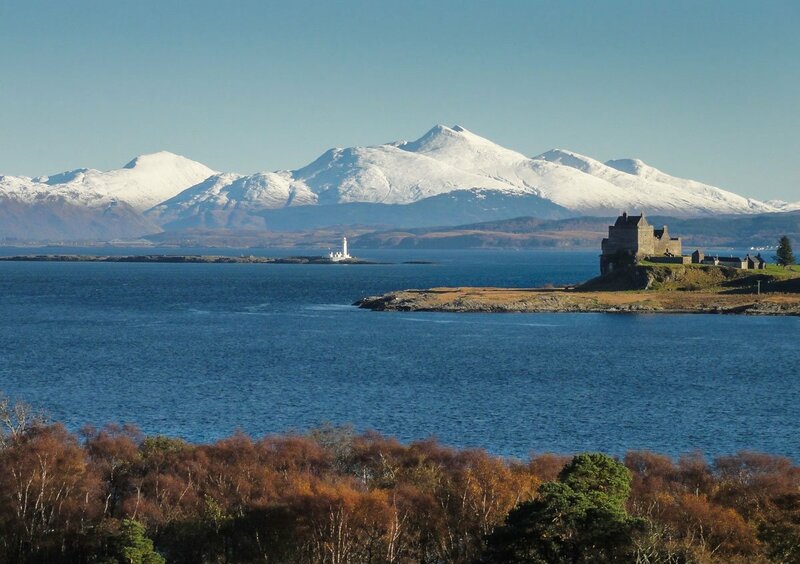 Descending through mature deciduous woodland toward Torosay Castle, you get great views of Duart bay and the castle. 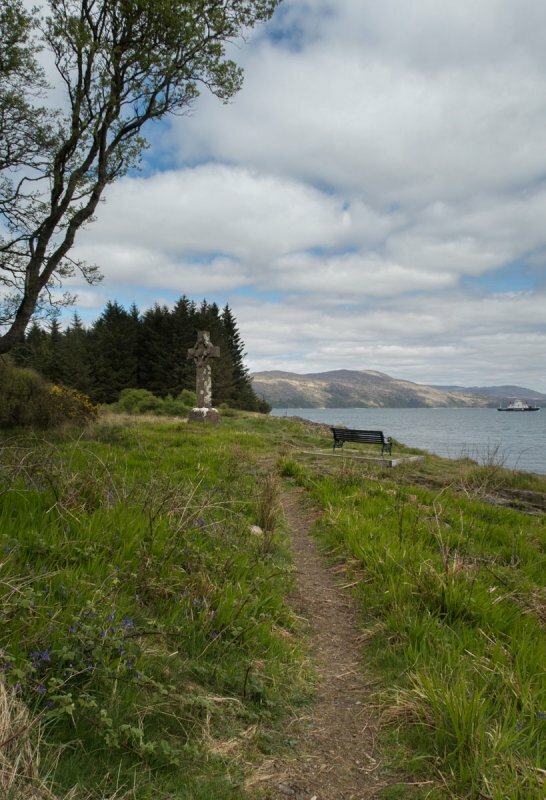 Upon reaching Torosay castle the track can be followed down to the shoreline which passes some stunning scots pine trees and ends at a large stone memorial cross. 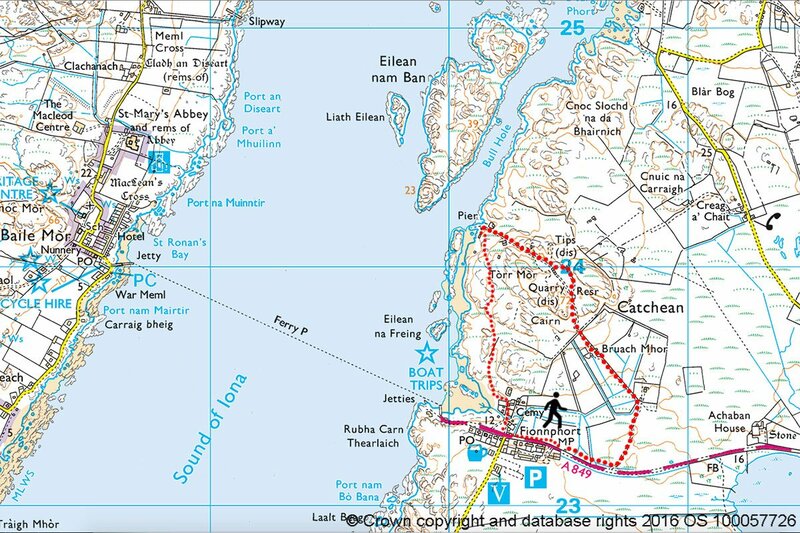 Those wanting a circular walk can at this point choose to follow the shore back to Craignure, but the way is difficult, and terrain can be boggy. It is therefore recommended to return either via the same route or through 'Hedgehog wood' - reached by crossing the field up to the woods from the lower farm buildings. 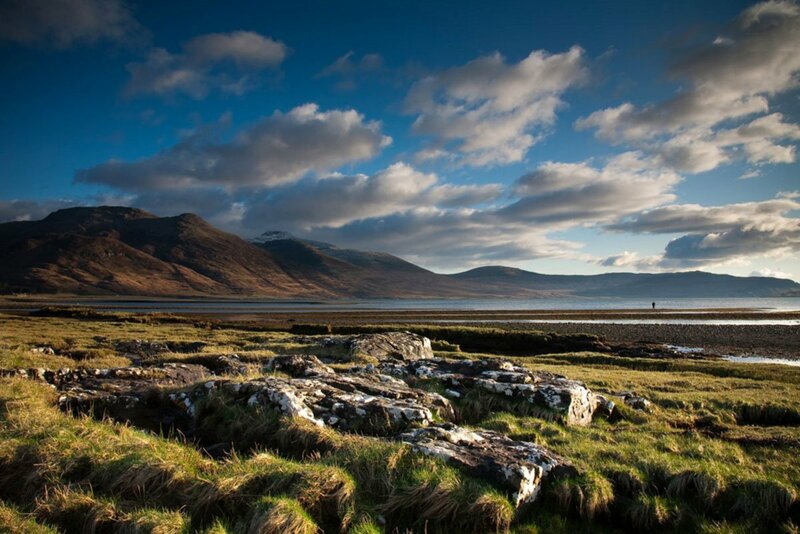 This is a stunning region of the Isle of Mull that not everyone chances upon during a visit due to its remote nature. 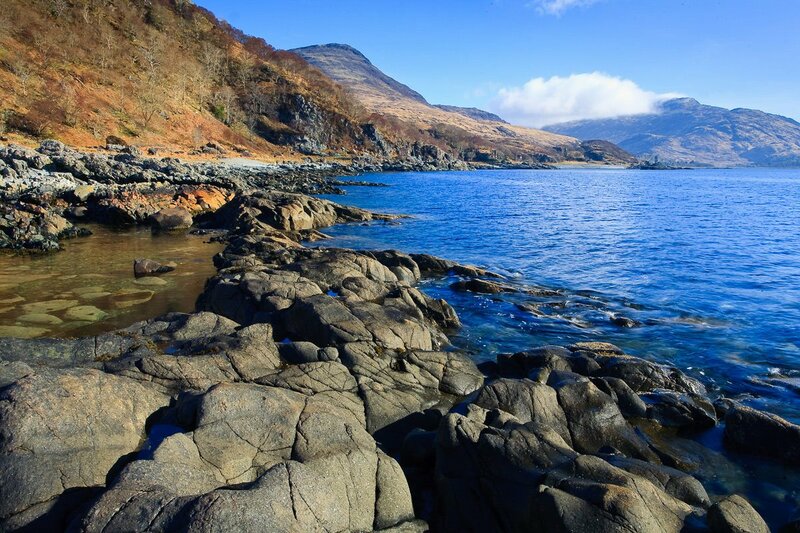 Starting in Loch Buie the old drove road follows the coast skirting beneath Ben Buie passing by some stunning raised beaches and sea caves. The way continues heading through sections of atlantic oak woodland to the old farm buildings at Glen Byre. 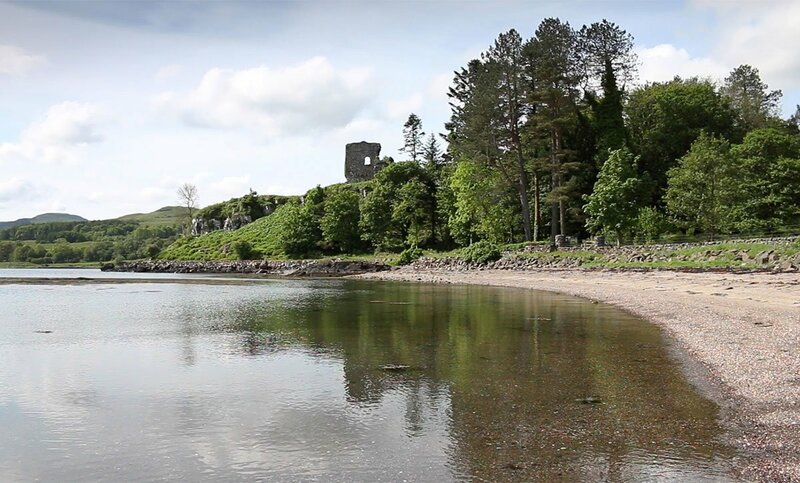 Here the Glen Byre burn flows into the sea via a series of nice pools, perfect to cool off in during the summer months. 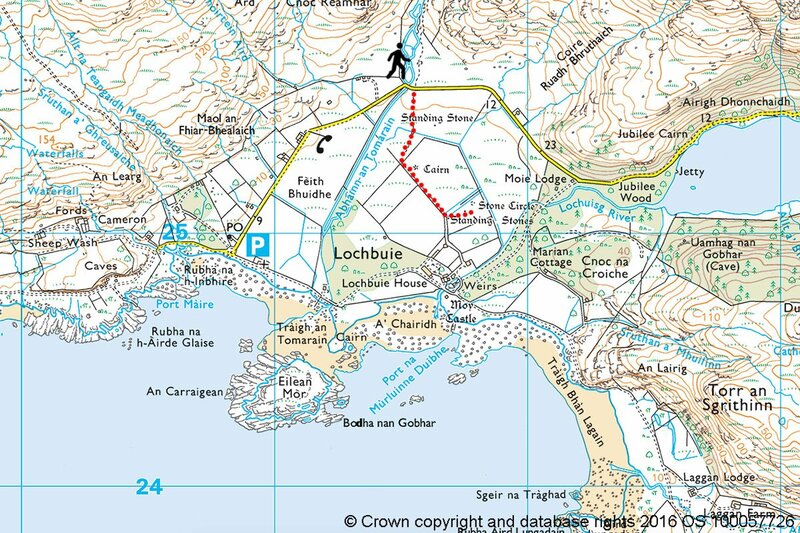 Those wanting a shorter, less arduous walk, may return along the same route at this point back to Lochbuie. 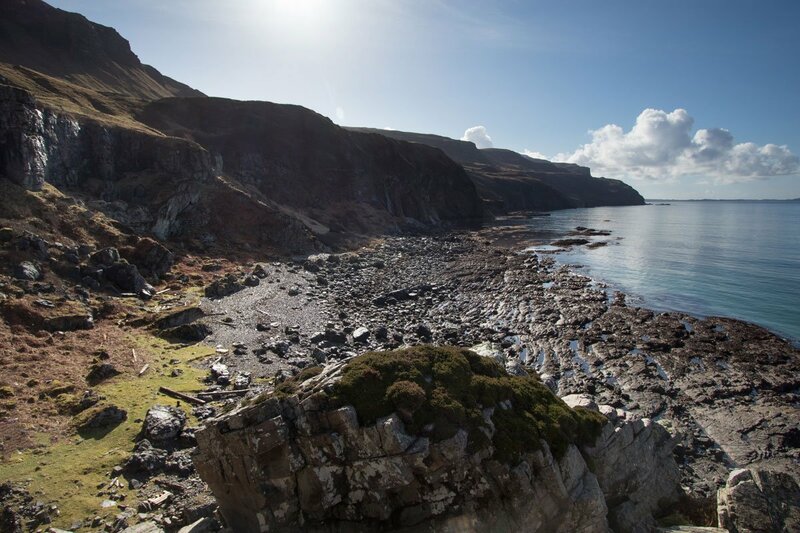 For those wishing to continue onto Carsaig, cross the burn and from here on the track to Carsaig passes through increasingly wild and beautiful coastline and high cliffs with expansive sea views. The going underfoot is also trickier. 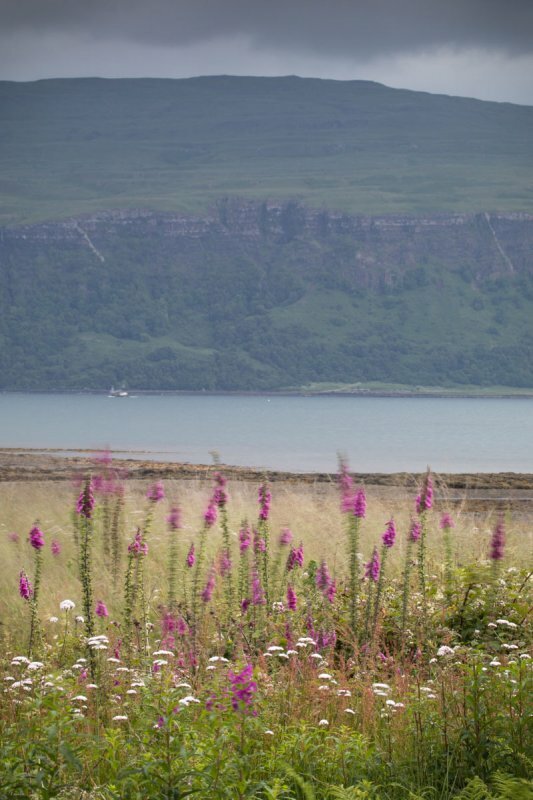 There are many wild goats here, and you have a great chance of seeing lots of Mull's other wildlife species en-route. The final section as you approach Carsaig gets a little easier underfoot and the path emerges by the old pier, a well-deserved rest point and place to admire the fantastic views toward the cliffs. 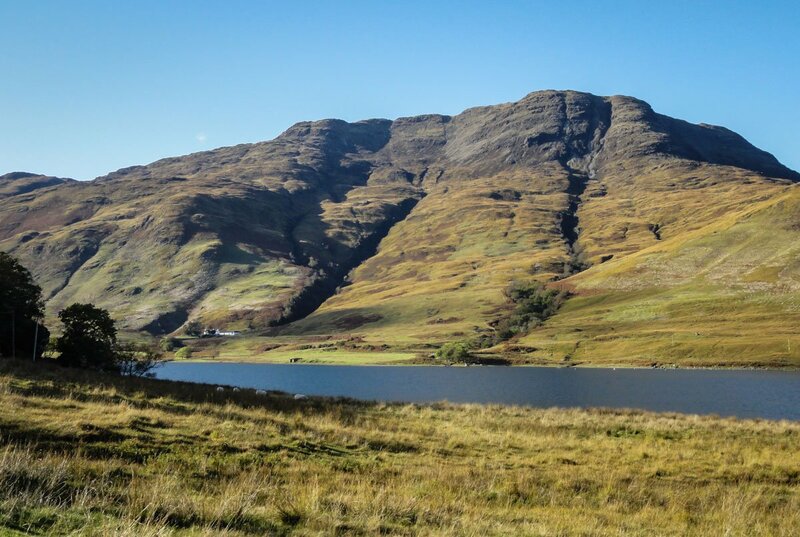 This rugged conical shaped mountain is one of Mull's finest hill walks, and whilst it may only stand at an altitude of 714m it has the feel of a larger and much more challenging peak. Of the ways to reach the summit the most direct is probably by climbing the northern slopes of the hill from the car park of the ‘three lochs' viewpoint in Glen more. 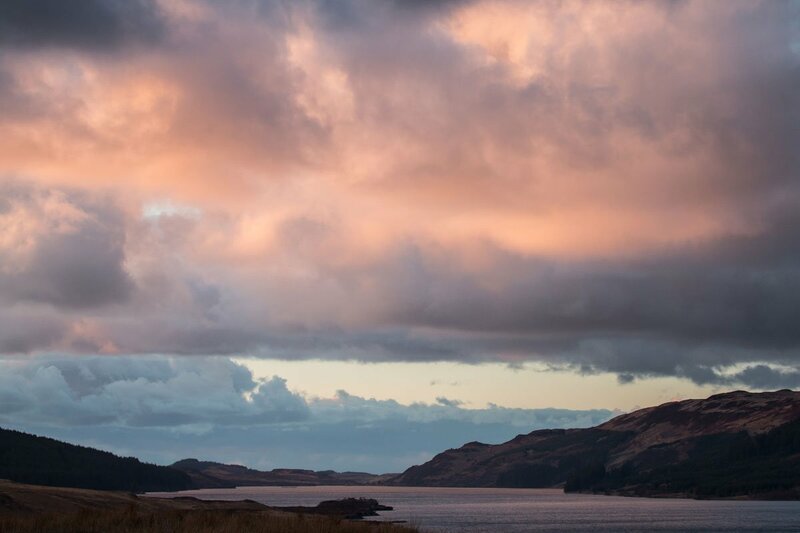 But the best and most scenic route starts in Lochbuie. Parking by the bridge follow the left bank of the burn before heading up hill to the small lochan. 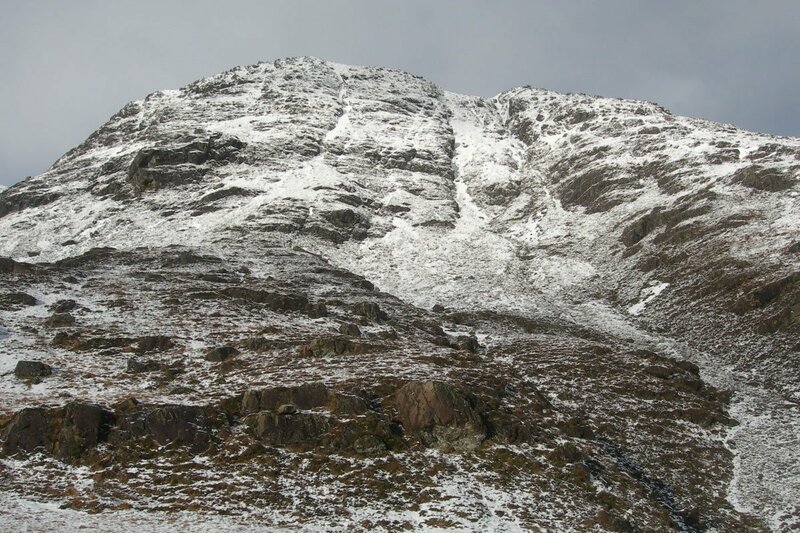 From this point you scramble up the final approaches to the summit crossing crags and screes along the way. 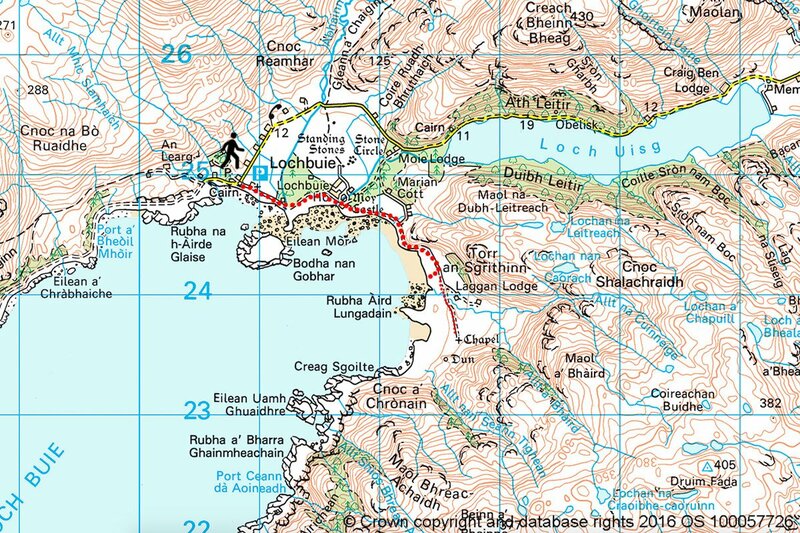 You may choose a simpler descent following the grassy slopes on the Loch Fuaran side of the hill, or drop into Gleann a' Chaiginn Mhoir and pick up the path back to the bridge. A final option is a dramatic scramble that is not suitable for the average walker. This is the ascent beginning near Craig in Glen More climbing Sron Dubh – a continuous and very steep band of crags and screes composed of Gabbro which give very good grip. The situation and views are both stunning! 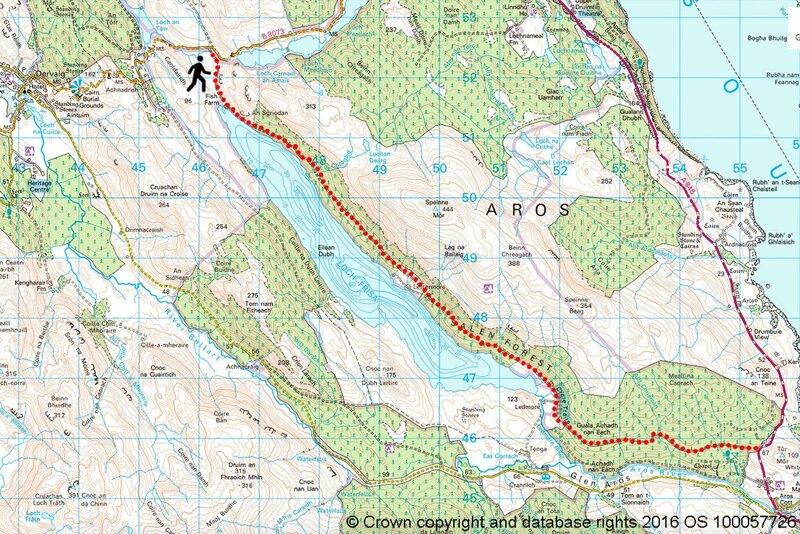 Note: This route is potentially hazardous and requires experience in mountain walking! 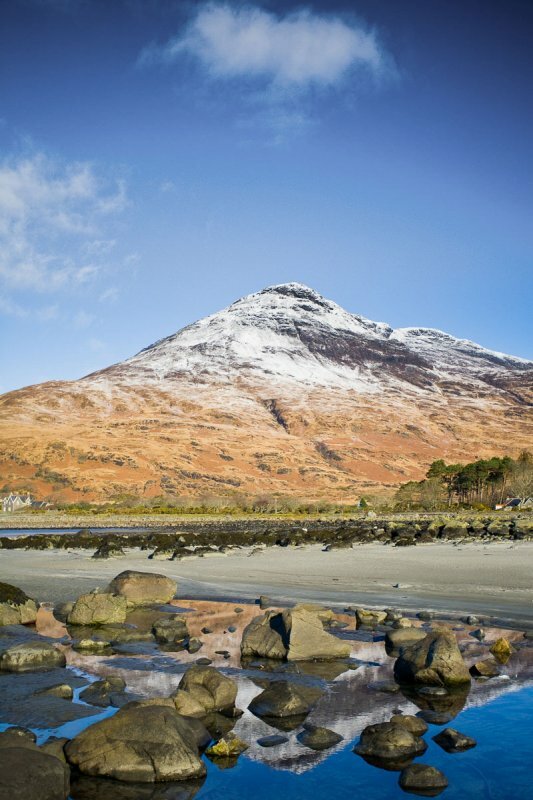 This beautiful mountain is located in south Mull and its height of 698m belies the grandeur and difficulty of this mountain. 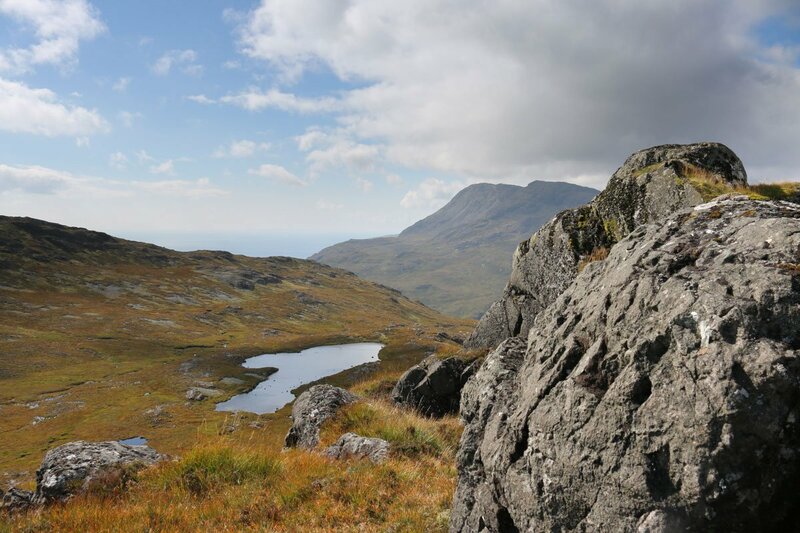 From the ‘three lochs' car par' in Glen More you can climb the mountain by first climbing Beinn Fhada, then walking the long ridge passing many lochans and rocky outcrops along the way. A beautiful route that gives great views along the way. 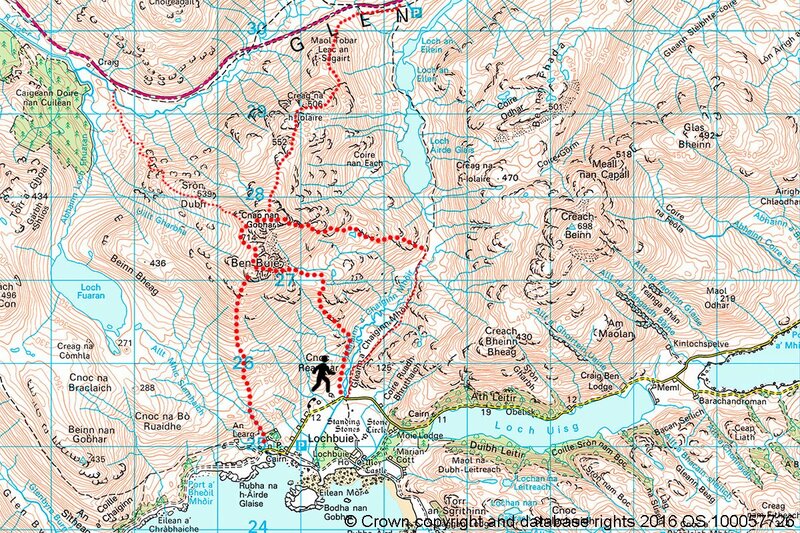 Another alternative is to start at Lochbuie and climb Creach Bheinn Bheag, then follow the ridge up to the summit. 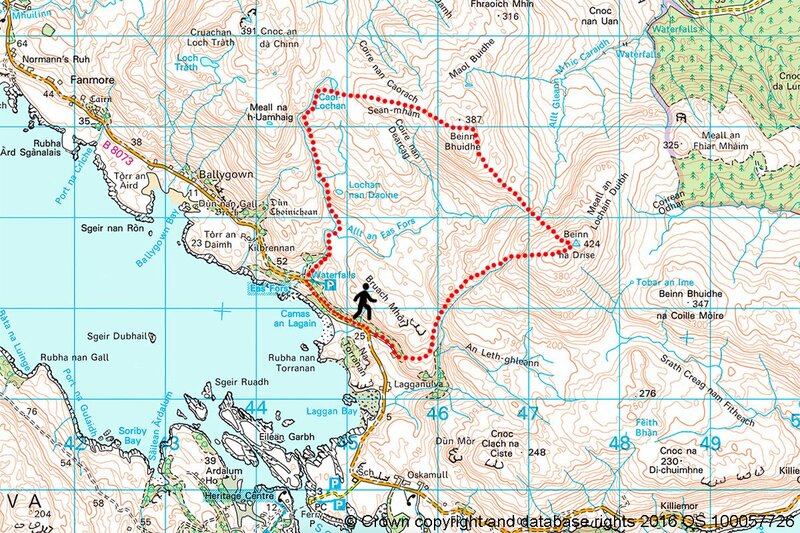 Descent can then be made via Glas Bheinn down to the shore of Loch Spelve. 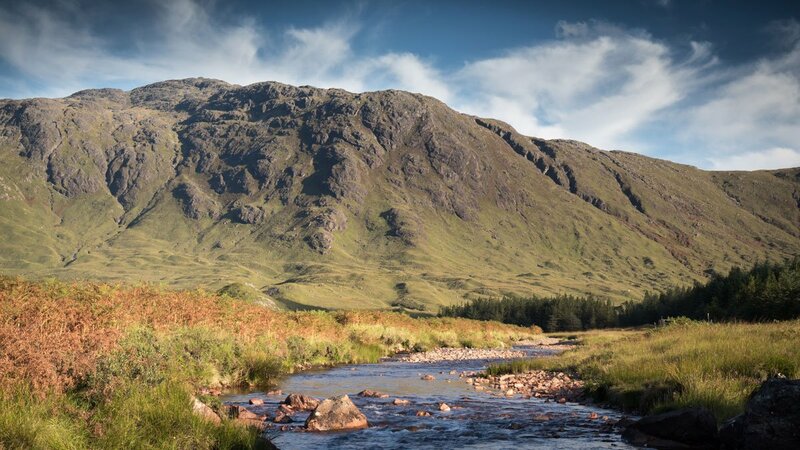 Those who enjoy a scramble can begin at Kinlochspelve and follow the course of the burn Allt Faolinn Glaise, then climb the steep gully that splits the crags of the mountains south face. 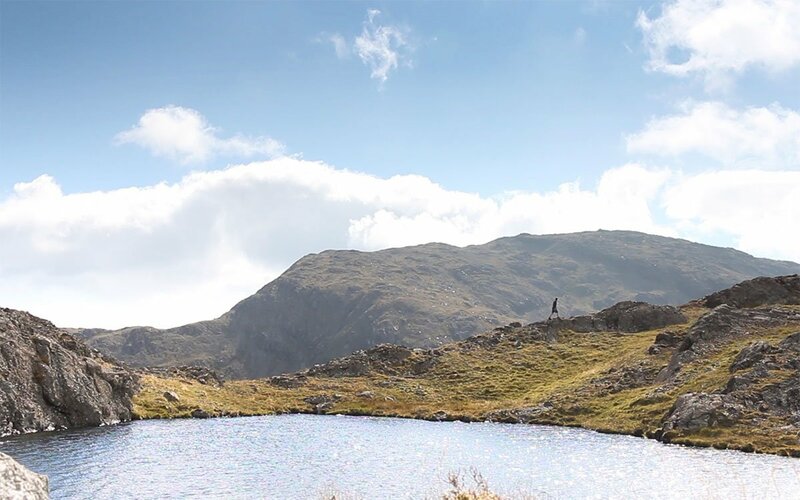 From the summit views are spectacular and much wildlife is likely to be seen along the way. 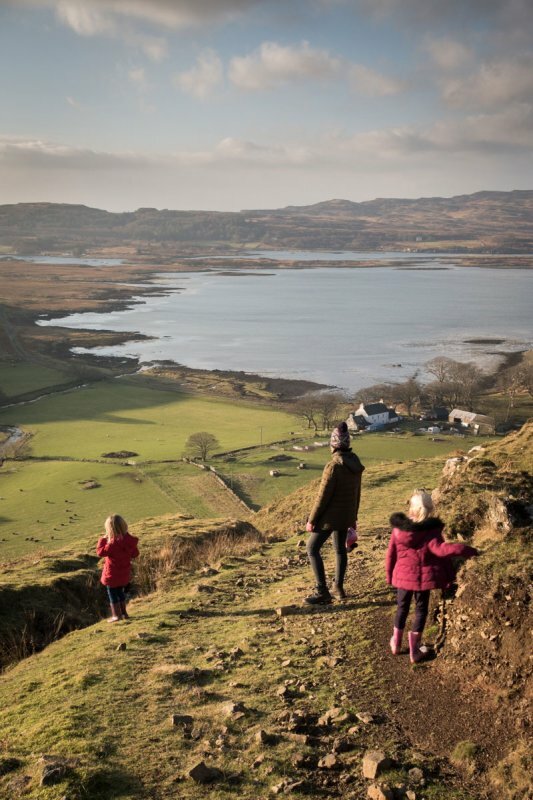 A great way to explore Mull's hill walking. 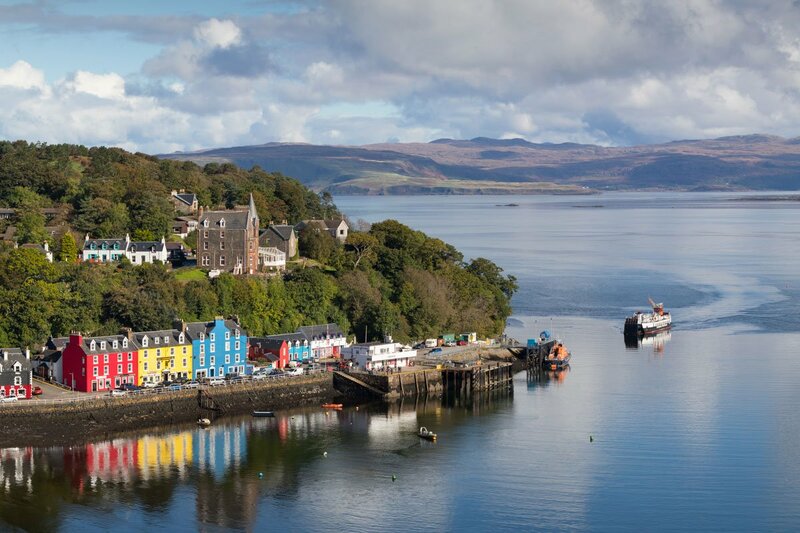 The road that runs between Craignure and Tobermory follows the Sound of Mull giving great views over the water. For those wanting to see more of this area at a slower speed the walk between Garmony and Fishnish will be rewarding. You can park at either end of the walk. 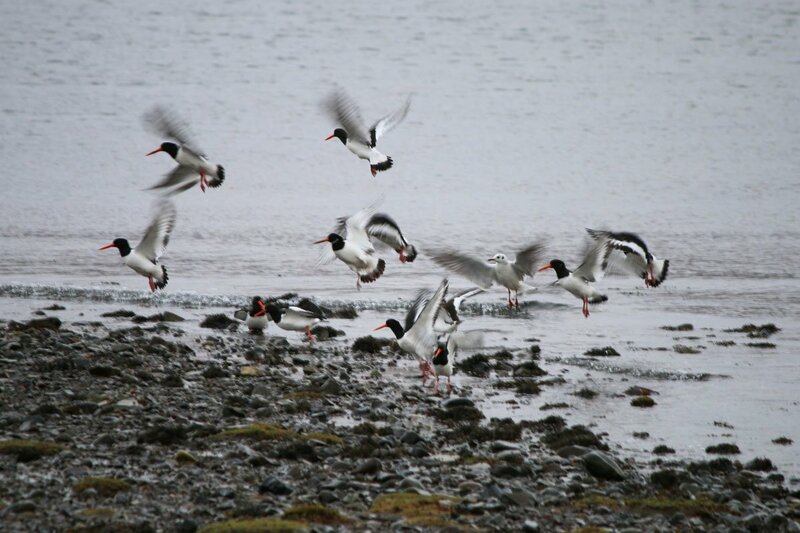 Starting at Garmony you can take time to observe the prolific birdlife around Garmony point where the river Allt Achadh na Moine meets the sea. Heading north the route follows the pebble shores of the Sound of Mull with great views across to Morven on the mainland. As you near Fishnish the ground becomes wooded, a mix of birch and spruce. 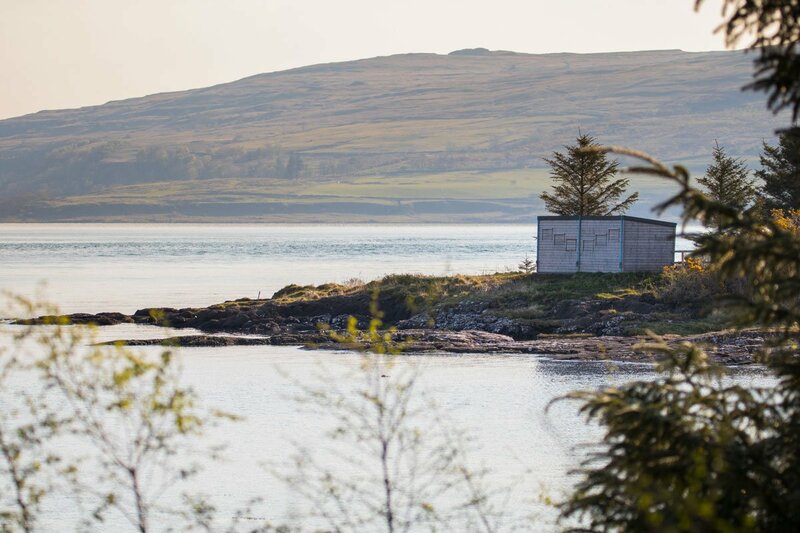 At Fishnish there is a wildlife hide that makes a nice sheltered base from which to watch for otters. Return the same route. Park at the end of the track at Tiroran and walk along the access track to Burg farm. 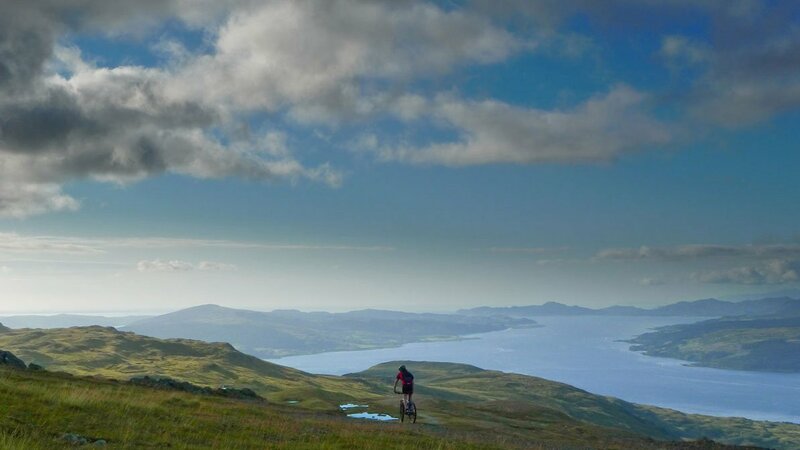 The track is elevated above the northern shore of Loch Scridain and has excellent views to the south over the Ross of Mull. The going is easy underfoot and affords ample opportunity to watch for wildlife and take in the surrounding landscape as you head towards Tavool and Burg. After the farm buildings the path winds through an area of deciduous woodland before reaching the memorial cairn to Daisy Cheape. 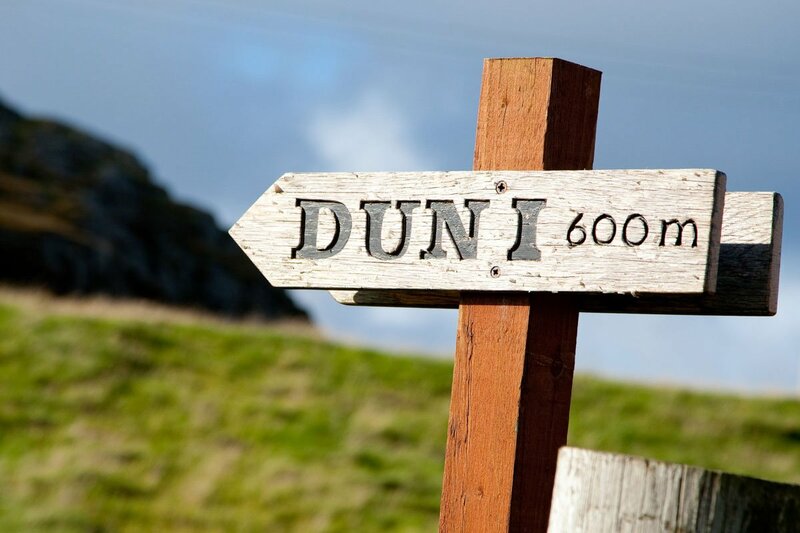 This area is of historical interest being the site of Dun Bhuirg, and the remains of the Dun are still visible. 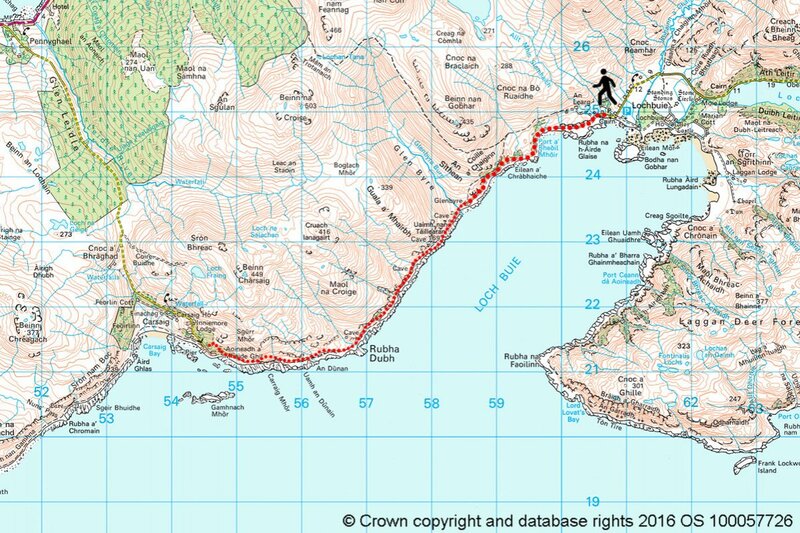 From here on the way ahead is via a much smaller footpath which closely follows this dramatic and rugged part of the Isle of Mull's coast. 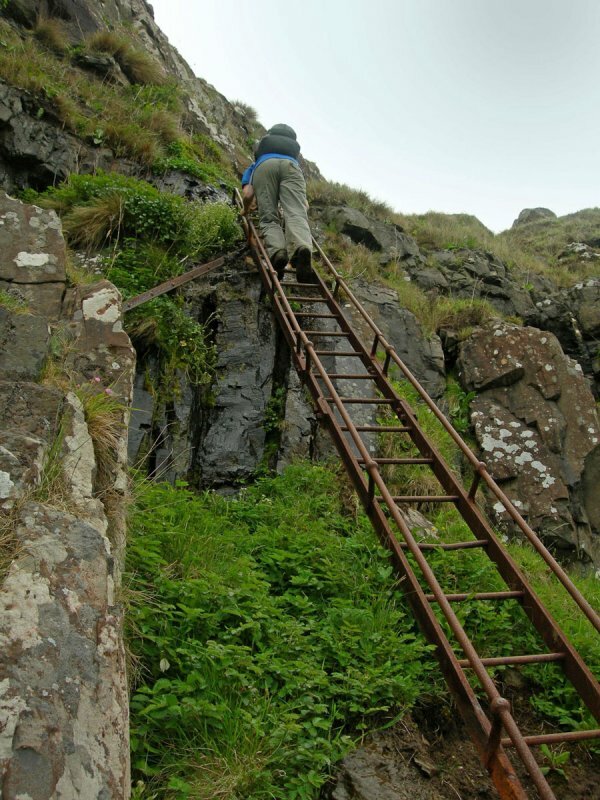 The way becomes progressively 'wilder' and there is one section of the coast which must be descended using the steel rung ladder that is bolted to the rocks. 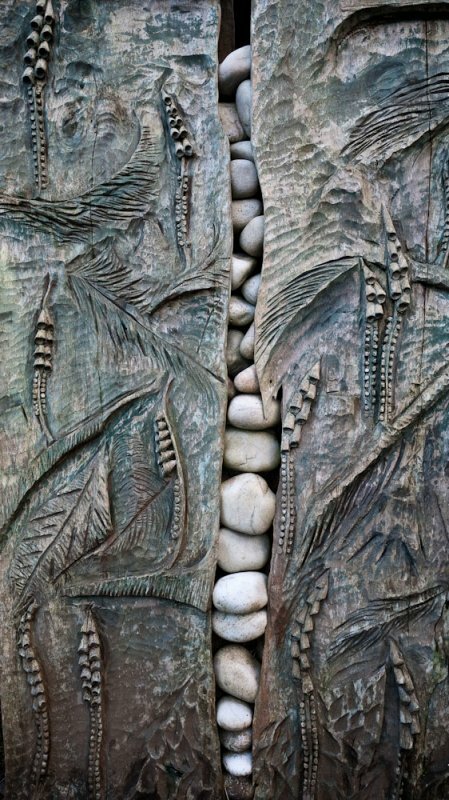 Shortly after this you reach the fossil tree, positioned at the head of a pretty cobblestone beach. 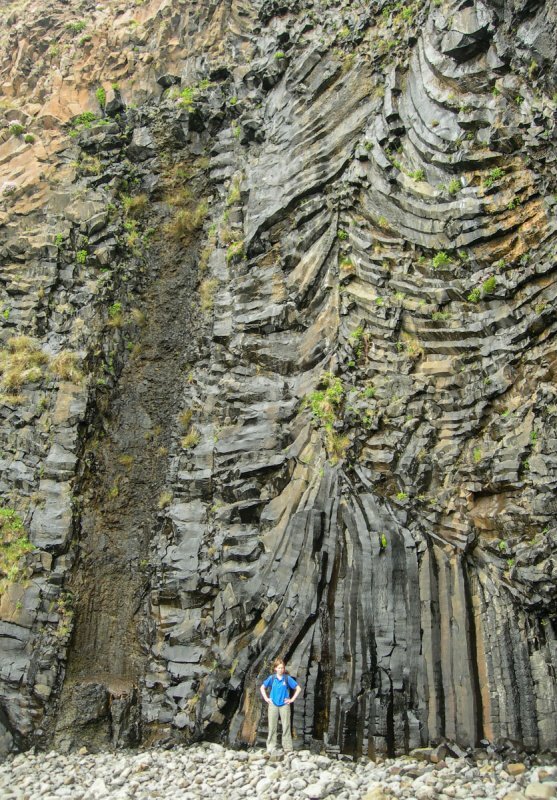 The cast of the tree can be clearly seen in the surrounding basalt Lava, though much of the fossil itself has been removed by collectors. Please leave the fossil tree remains undisturbed. Return along the same track. 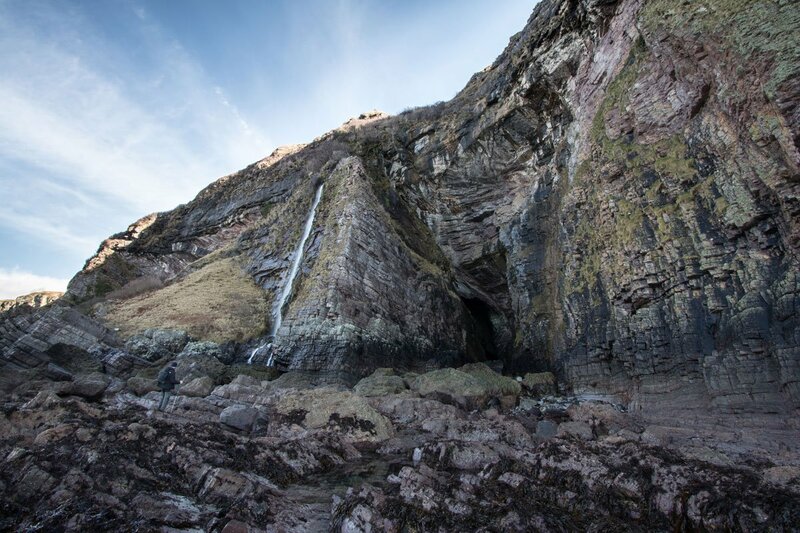 At around 500 feet in length MacKinnon's Cave is said to be the longest in the Hebrides. The (tidal) walk to the cave begins at the parking area near Balmeanach Farm. 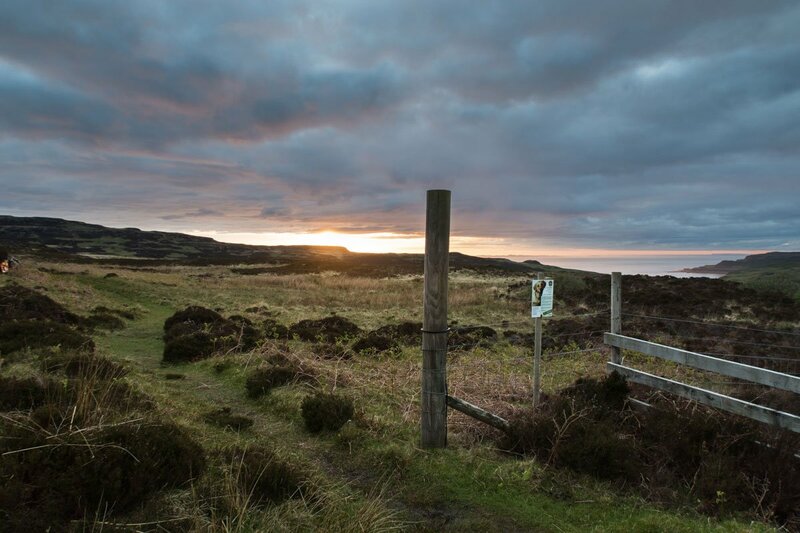 Signs point the way which follows a fence line crossing fields before descending to the coast. At this point the going becomes much more difficult underfoot and great care needs to be taken while scrambling over the jumbled boulders to get to the entrance of the cave, which is only accessible on a low tide! 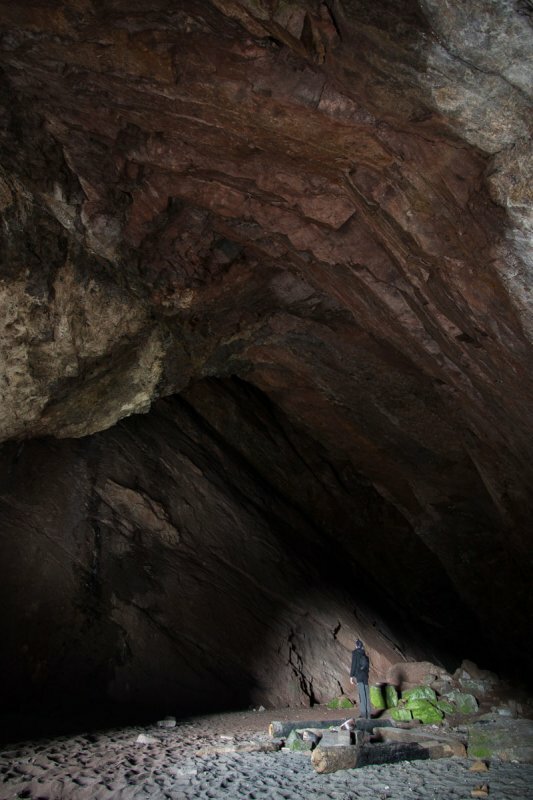 The cave consists of a large main chamber with a narrower passage leading to a second chamber at the rear of the cave. 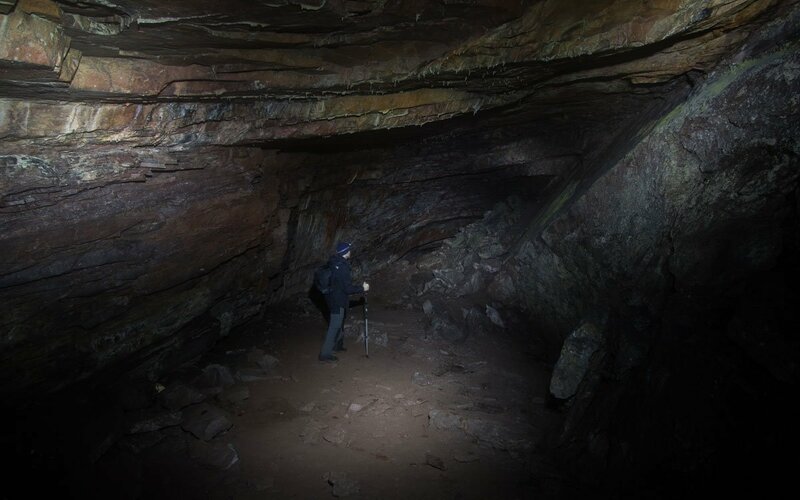 It is simple to explore the cave but torches are of course required! Return is made by the same route. 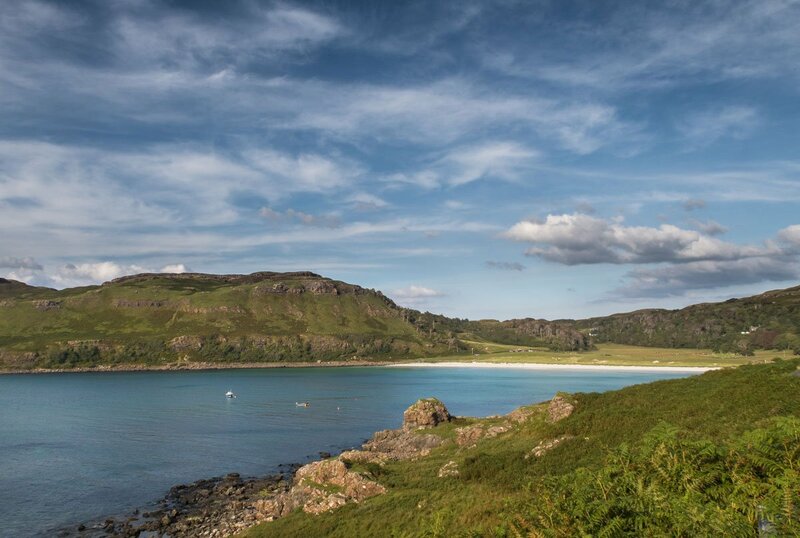 This is the Isle of Mull's coast to coast walk! 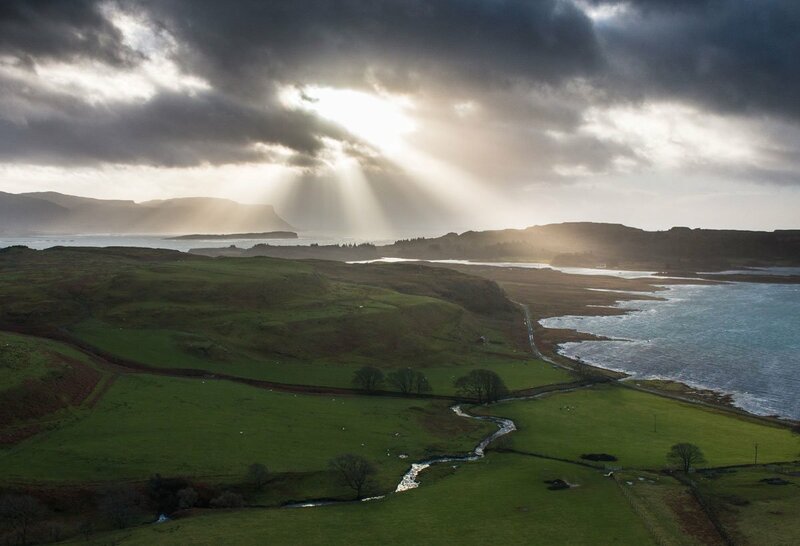 North and south Mull are joined by a narrow isthmus between the village of Salen and Gruline. 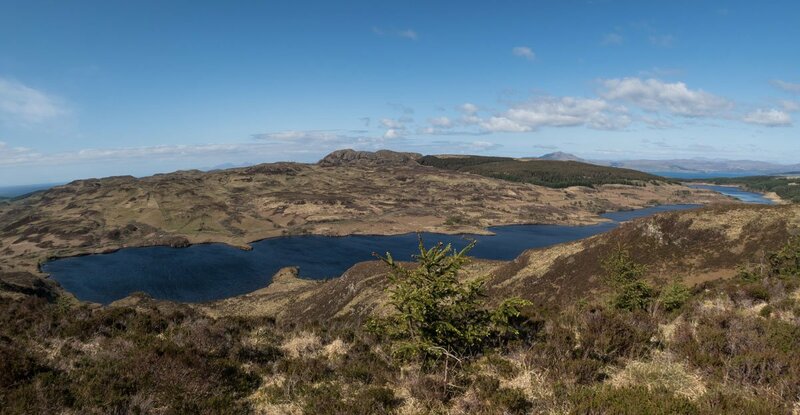 This fine hill walk begins by climbing through woodland near the old fishing boats just north of Salen before breaking clear of the trees and emerging onto moorland on the hilltops. The way here can be a little boggy underfoot, but fantastic views are more than ample compensation! 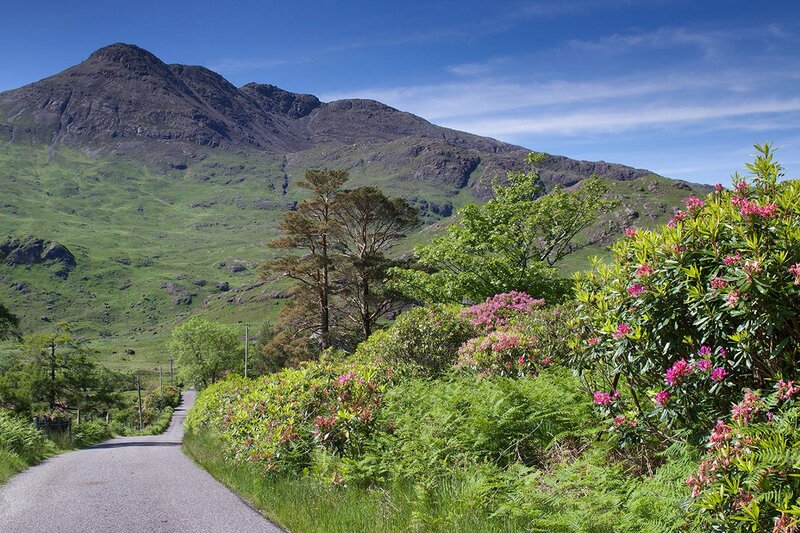 As you begin the descent to Killiechronan and Loch na Keal you again enter woodland which becomes increasingly dense and offers stunning displays of bluebells in spring. 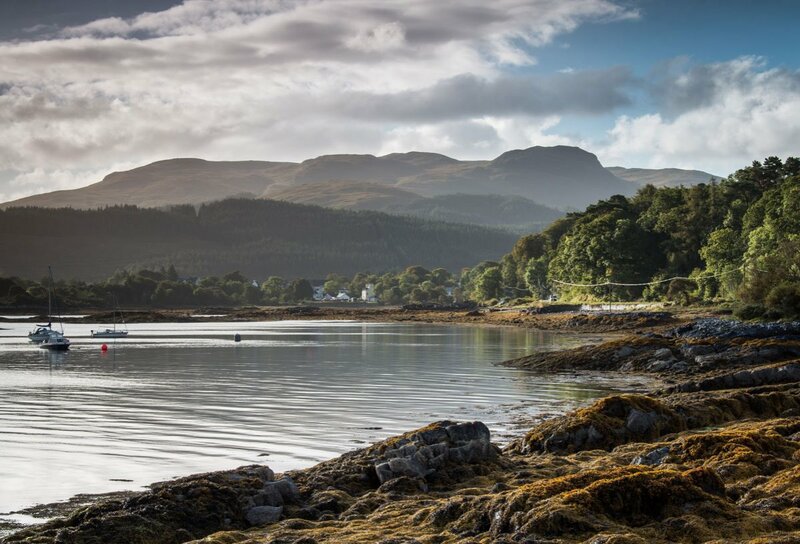 Return the same route or by road to Salen. 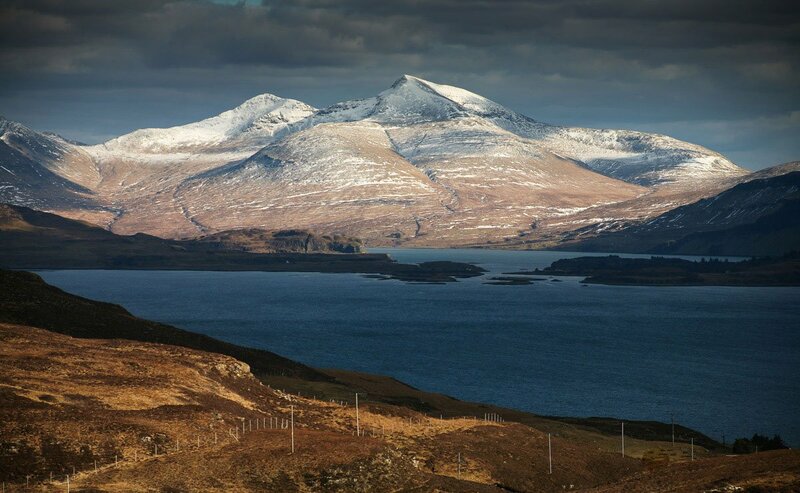 Ben More is the Isle of Mull's only Munro, and the only Munro in Scotland accessible only by boat. It is a fantastic peak with many different 'moods' depending upon the season and weather. 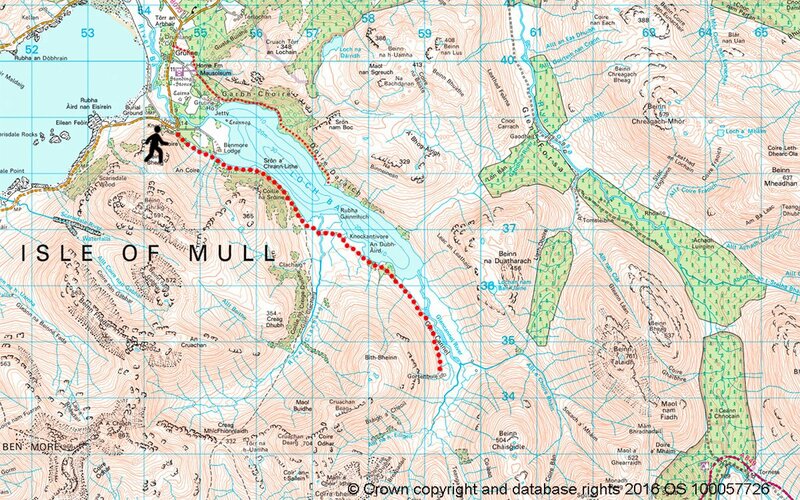 This has to be one of the best walks on the Isle of Mull for those wanting a challenge. 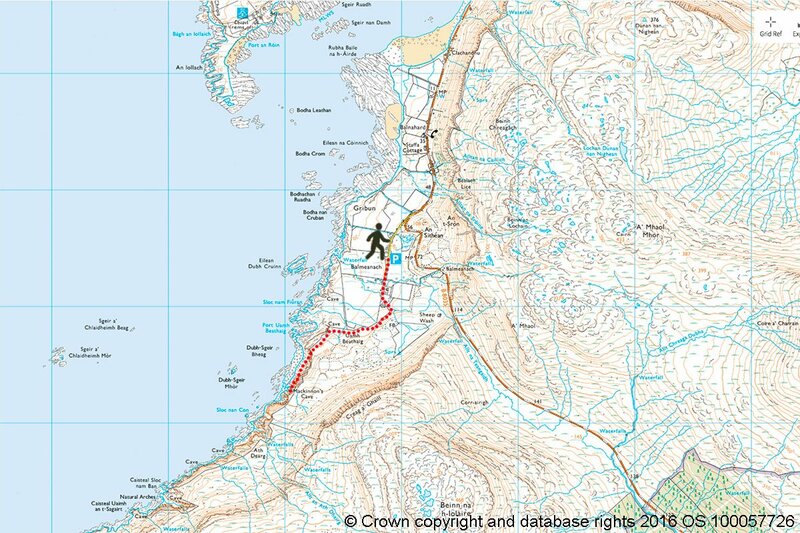 There are numerous ways to climb the mountain, but the most common choice is from the south shore of Loch na Keal at Dhiseig where there is a well worn path from sea to the summit. 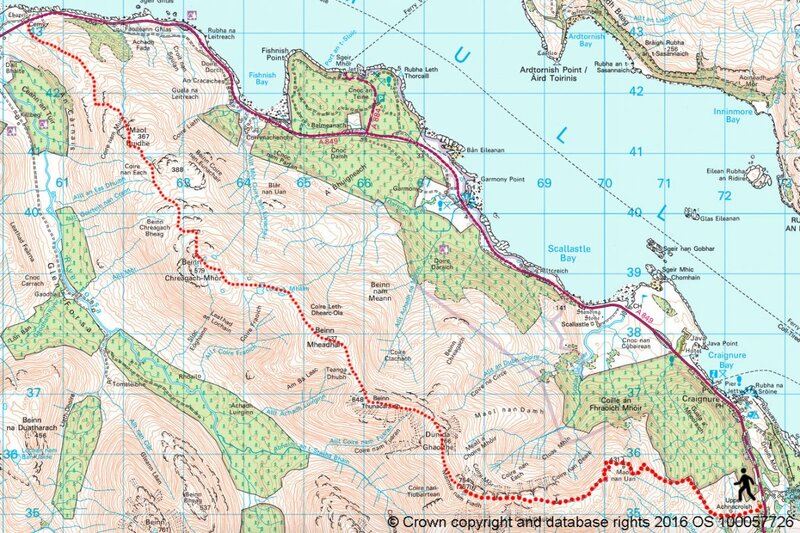 This is a simple route up and down, and aside from the exertion, of little difficulty (assuming the weather is fine). 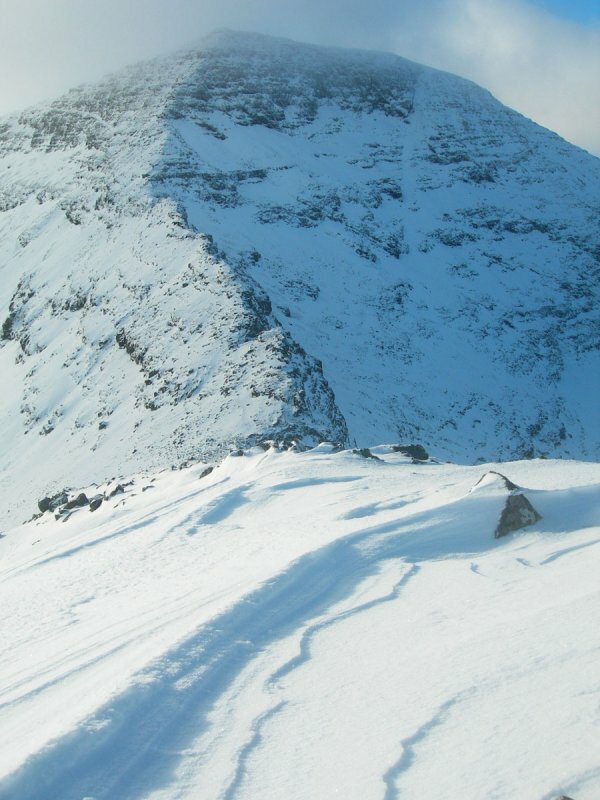 An alternative circular route can be made by first climbing Beinn Fada (path less) and following the ridge which is quite exposed at A' Chioch. Returning via the standard path. 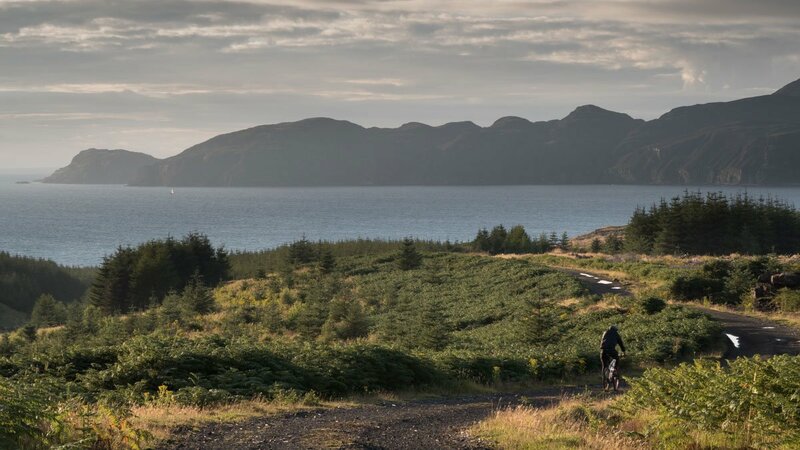 This is a stunning route and one of the finest mountain rounds on the island. This is a more difficult route than the usual way up, with some scrambling involved, so caution is advised before undertaking. From the Glen More side of the hill park near the bridge, just a little way along the road turning marked 'scenic route to Salen', you can either follow the burn Allt a' Ghlinne Dhuibh then climb A' Chioch and take the ridge to the summit, or up the broad Maol nan Damh - a way that avoids the difficulty of the ridge route. 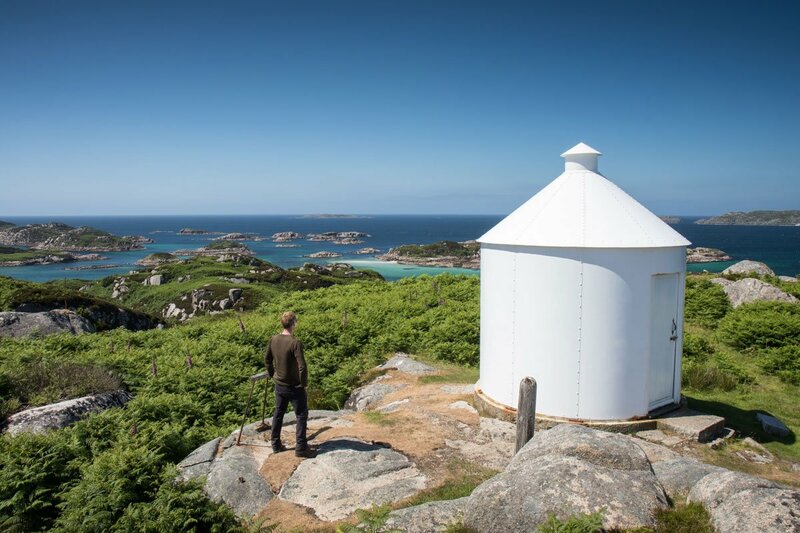 The views from the summit are fantastic and there is a circular cairn to gain a little shelter and enjoy a picnic! 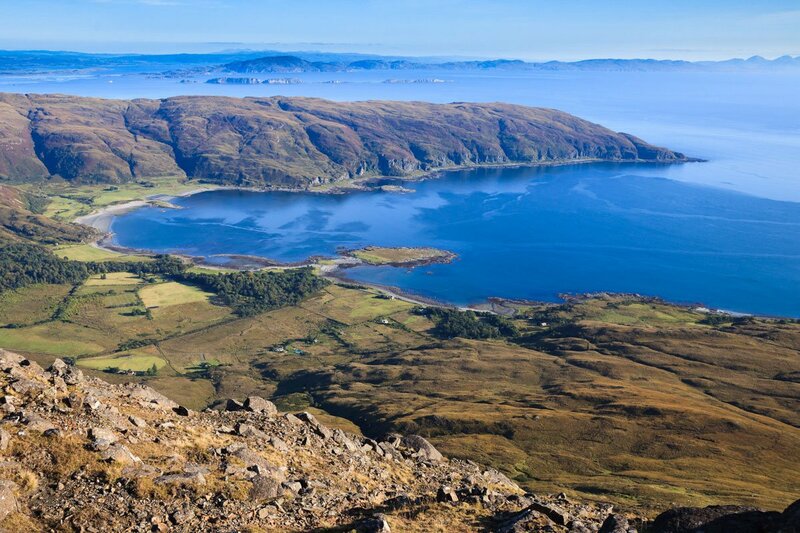 This is one of the Isle of Mull's finest and longest mountain ridge walks. 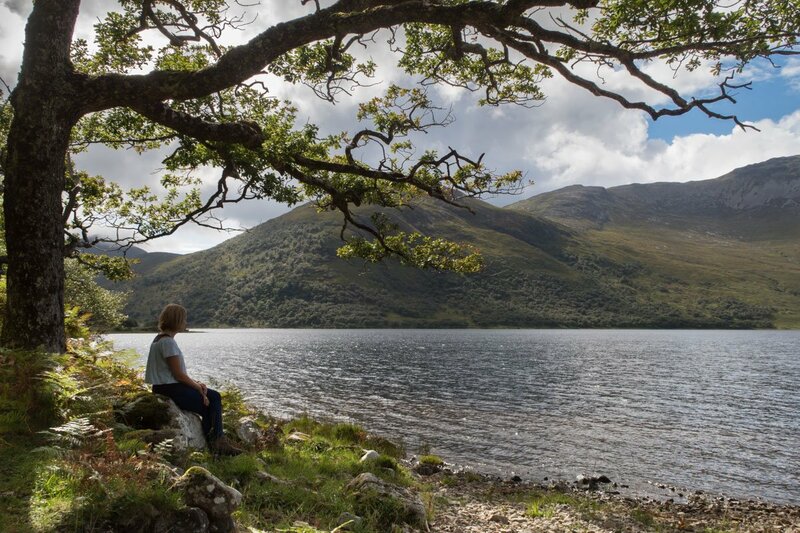 Rated as one of the best walks in Scotland for its superb panoramic views over Loch Linnhe and the Grampian mountains of the Scottish mainland. 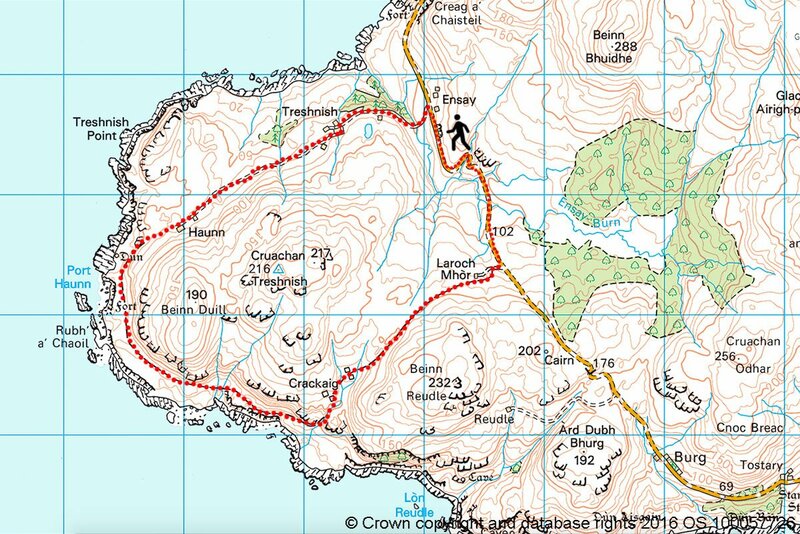 Starting near Torosay castle the mountain walk to the top of Dun da Ghaoithe (766m) follows a well-marked gravel vehicle access track for two thirds of the climb. This makes navigation much simpler and makes the walk a good option for those wanting some exertion over less tricky terrain. 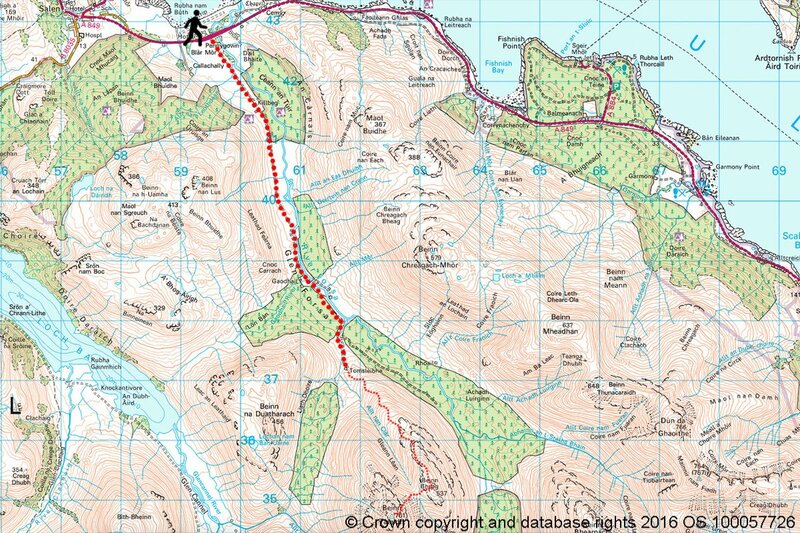 After passing the final mast the walk is largely pathless, though sheep trails do converge with previous walkers routes to form a 'track' of sorts. 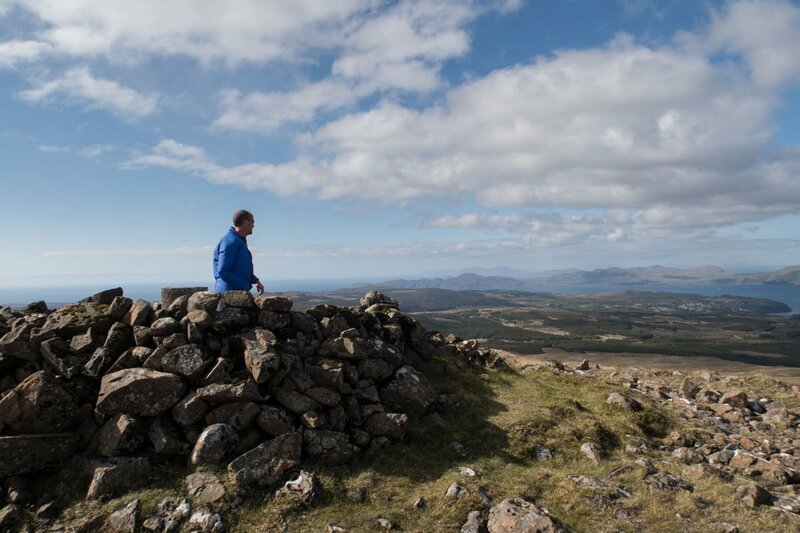 The summit cairn is a superb viewpoint offering fantastic open vistas over the Isle of Mull's interior mountains and a distant Ben More. Many choose to return the same way at this point, but for those want a longer linear walk continue along the ridge heading for the old Chapel at Pennygown. 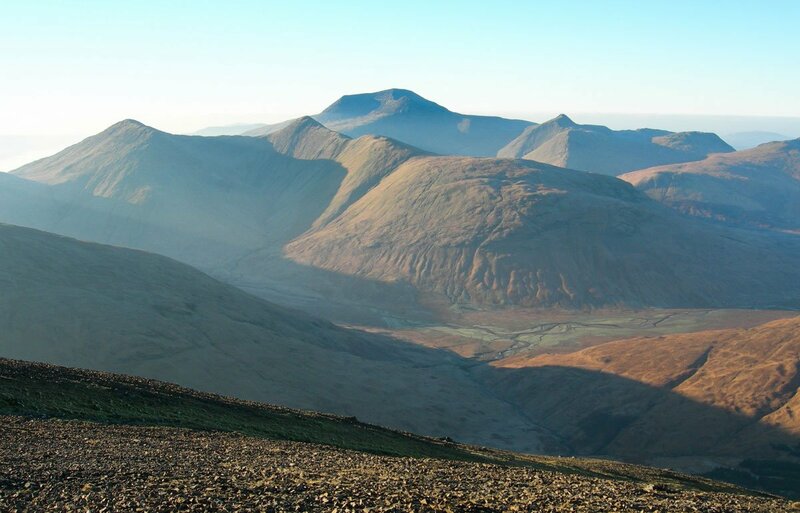 The route remains elevated for much of the way, slowly descending and offering superb views at all times. 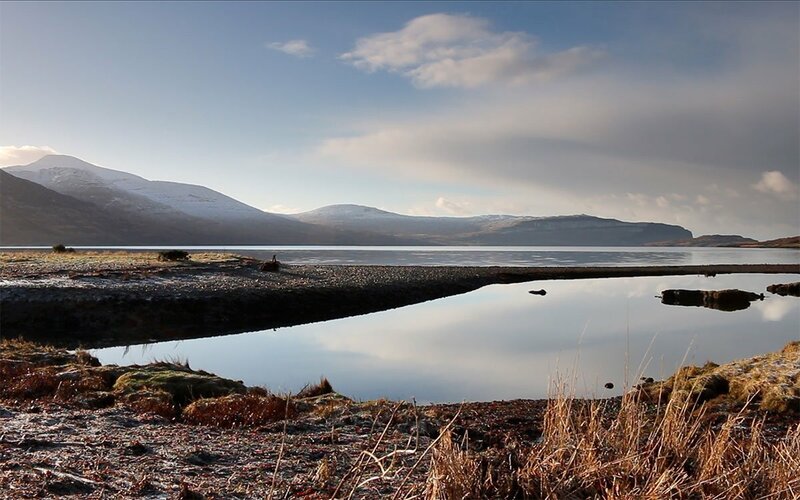 Loch Ba is one of Mull's largest freshwater lochs and the area offers an almost infinite choice of walks! Here we focus on two routes that run each side of the shore. 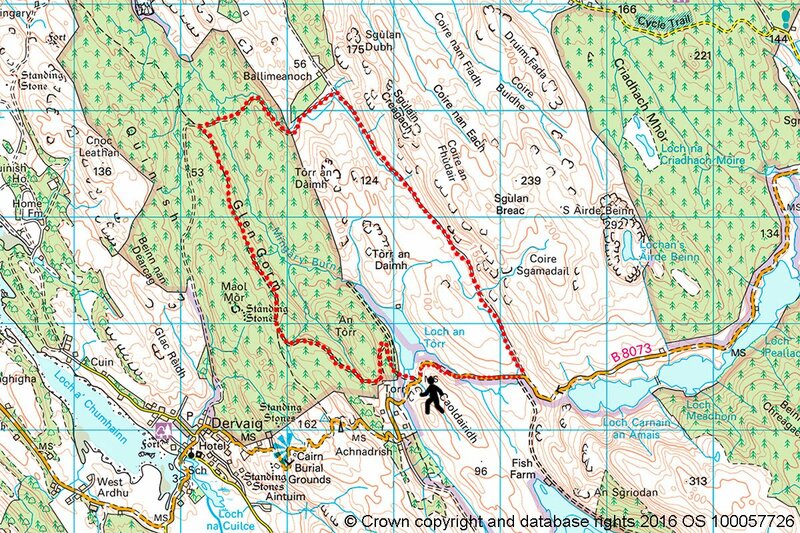 Starting at Knock follow the track along the south west shore of Loch Ba. 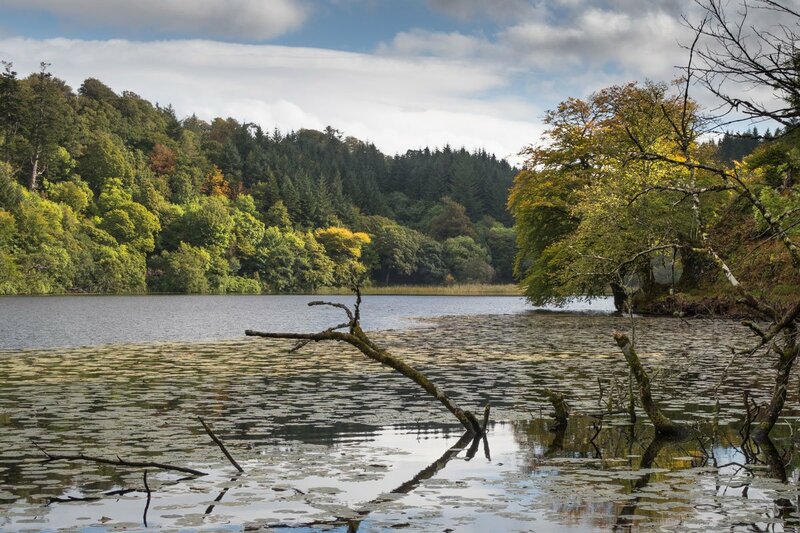 The name of the loch means ‘Loch of the Cattle' and this often seems an apt name as you pass grazing cows, while walking between sections of woodland and open shore. The track leads to Glen Cannel, a wide river basin flanked by mountains. 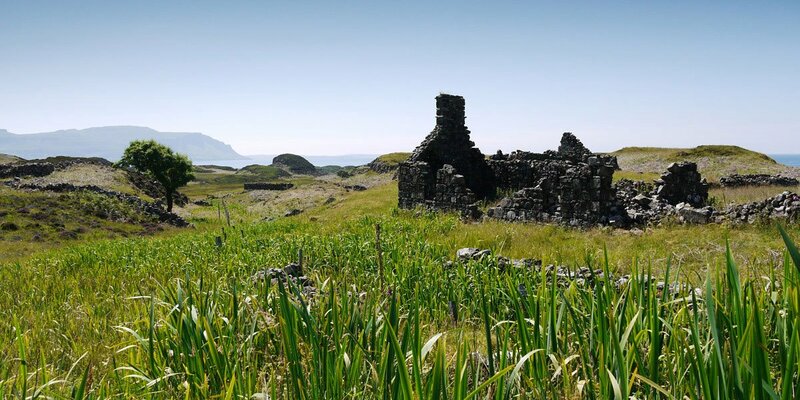 You will find an old farm at Gortenbuie, at which point most walkers return back to Knock. Starting at Gruline follow the signposted track to Macquarie Mausoleum before continuing past the buildings at Gruline and following the path along the north east shore of Loch Ba. 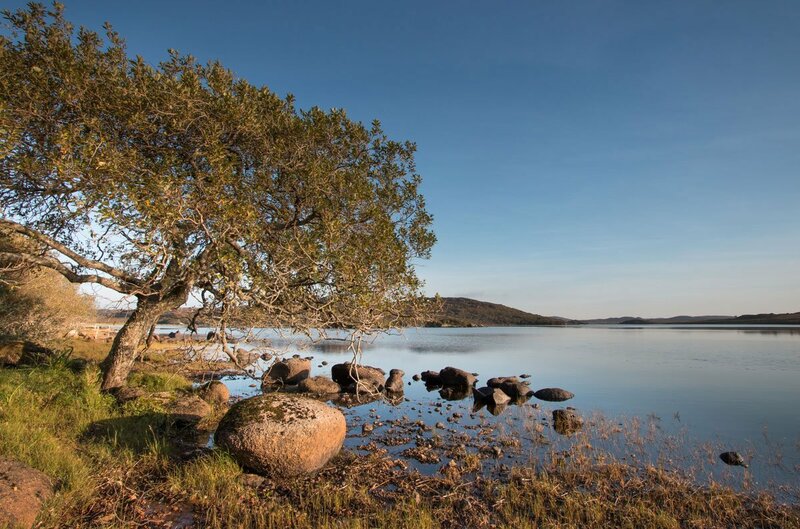 This is a beautiful part of the loch, with mature woodlands and pebble beaches. 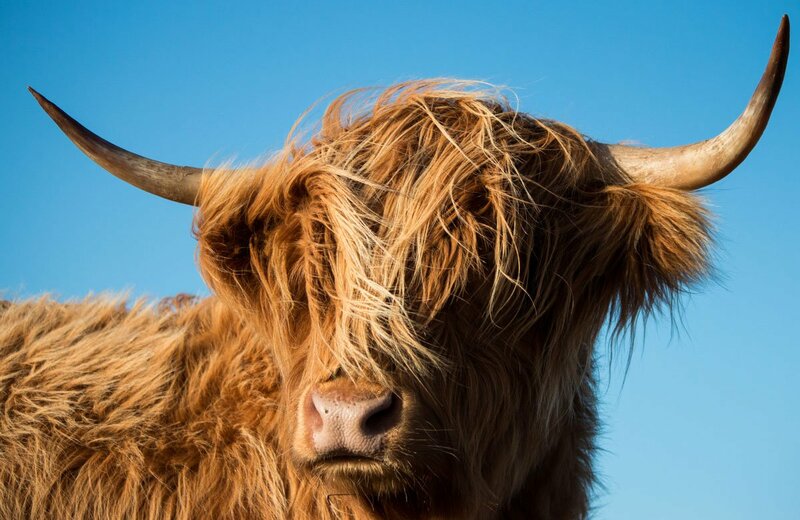 Please take care not to disturb local residents as you pass Gruline Home Farm and keep to the main track as you pass the cottages beyond Gruline House to reach Loch Ba and the oak woods beyond. Return the same way. 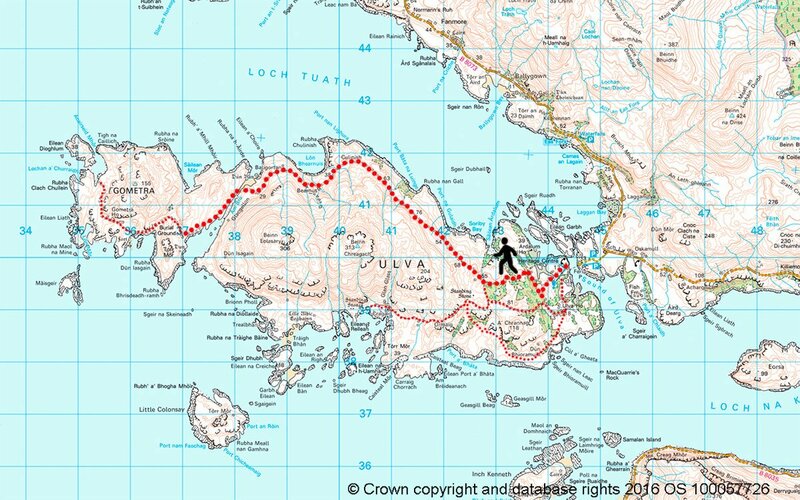 Visitors staying on Mull's north west coast may also take advantage of the excellent walking available on Ulva. 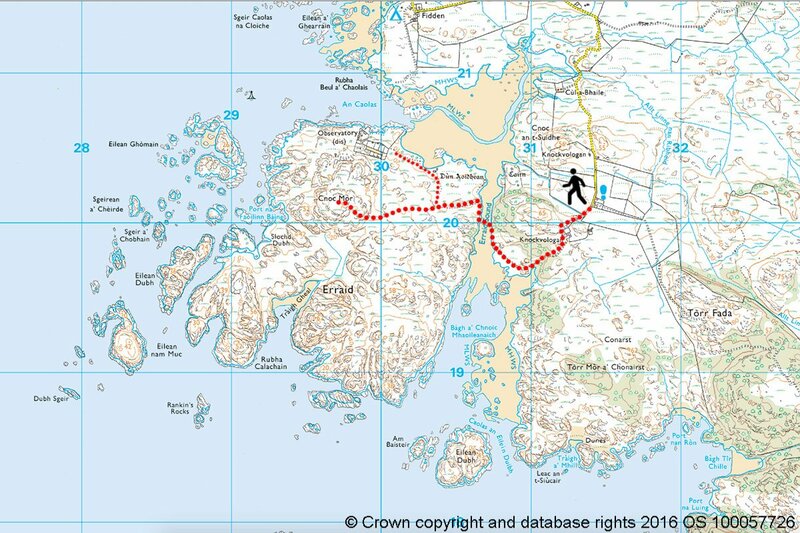 The Isle of Ulva has a very good range of walking trails that allow easy exploration of the beautiful island. 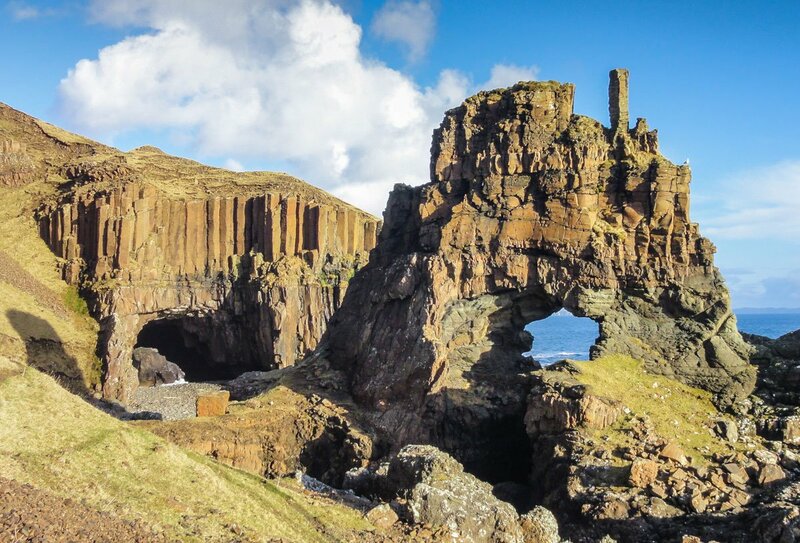 Shorter walks such as the ‘farm circuit' are easily accessed from the Boathouse and those wanting to explore further can head to the coast and visit Livingston's cave where there is columnar basalt geology. 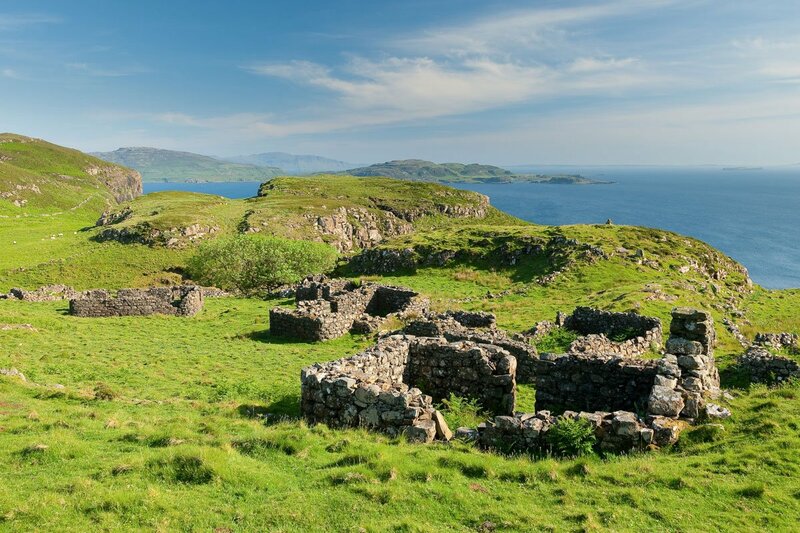 A longer track on the island's south side climbs over the hill, passing through the ruined village of Ormaig before arriving at Crackaig. 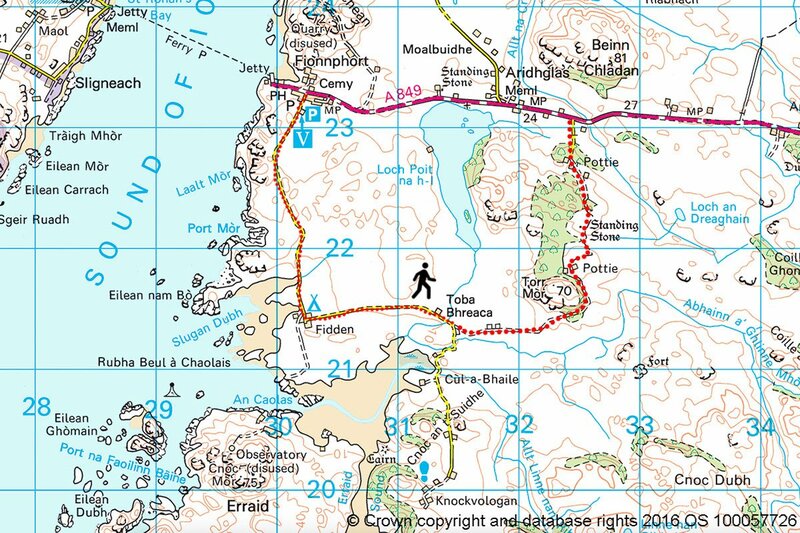 Along Ulva's north coast is a track which runs all the way to Gometra, a small island off Ulva's west coast that is connected to Ulva by a bridge. 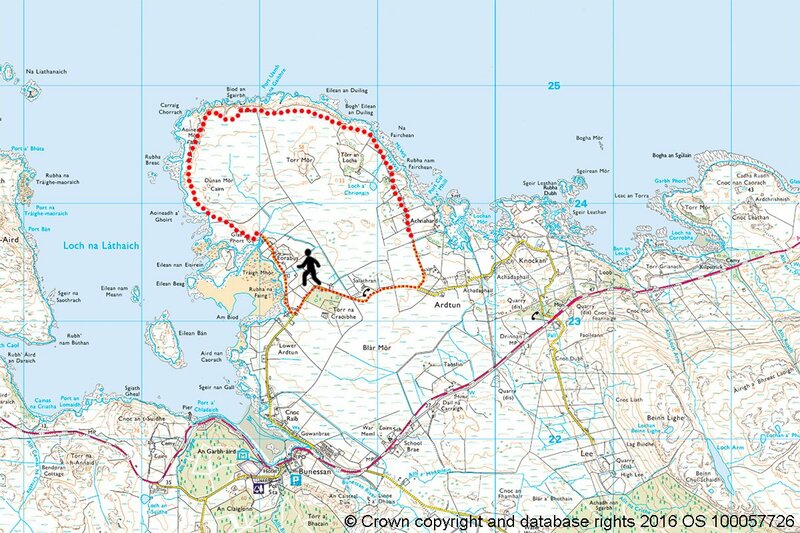 This is a fantastic day's walk that will take you though some remote and beautiful areas of the Isle of Ulva. 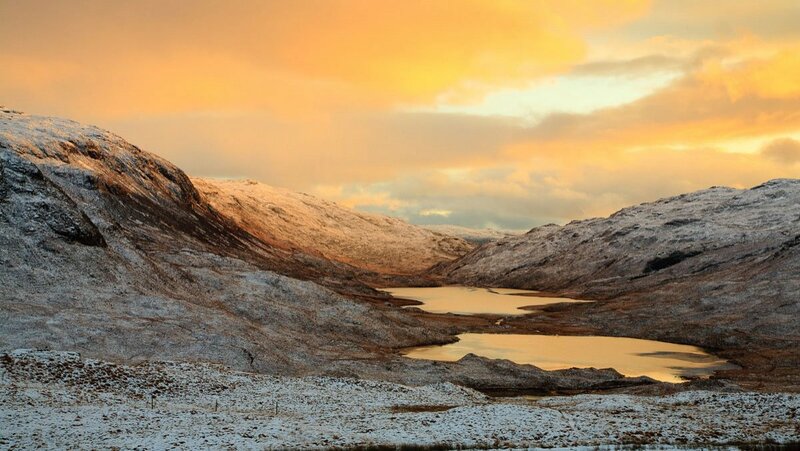 Gualachaolish is an old clearance village reaches via a track that skirts the flanks of the hillsides above Loch Shelve. 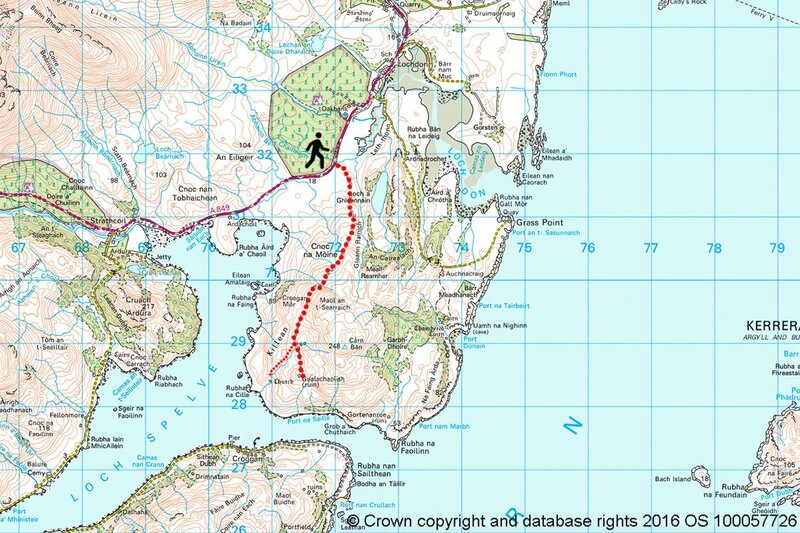 The track for this walk starts just after a bridge (the witches bridge) on the A849 just after you have left Lochdon heading west. 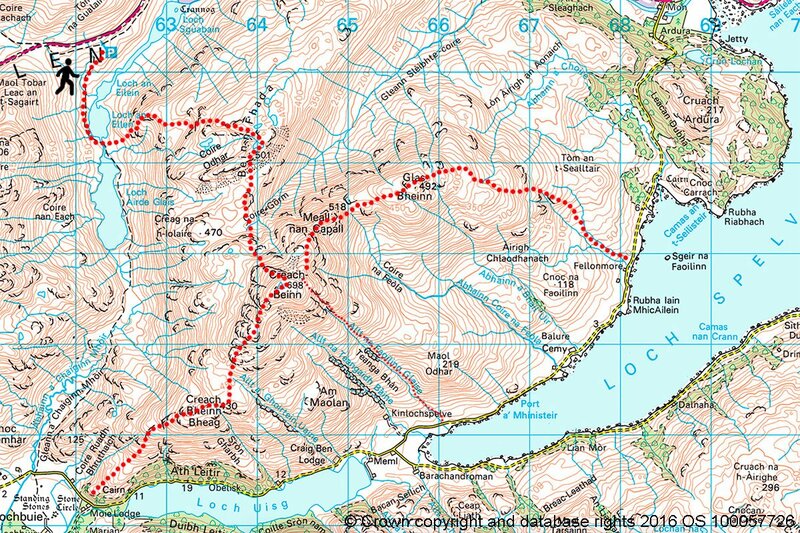 The route is fairly easy to follow, though boggy underfoot in places. 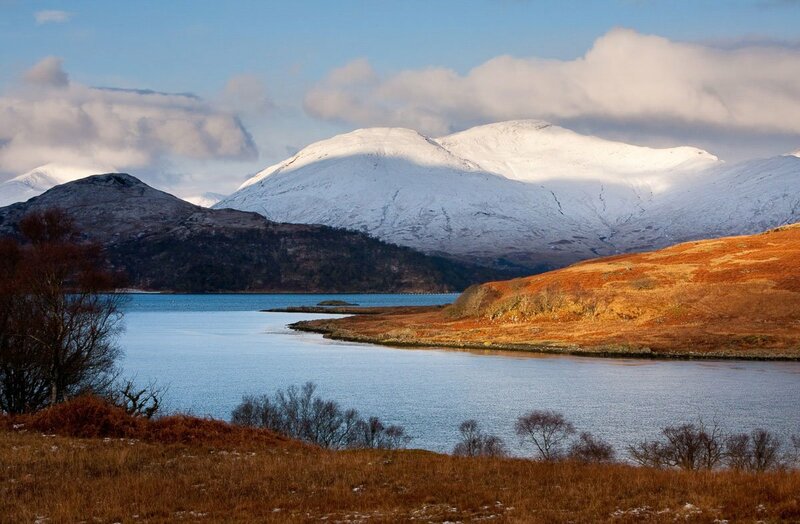 There are excellent views over Loch Spelve and towards Ardura and Dun da Ghaoithe. 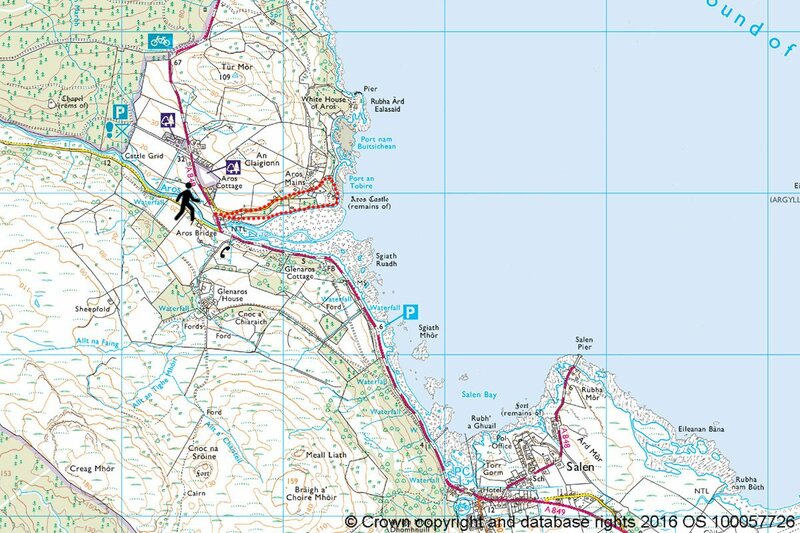 This is a great area for seeing short eared owls and hen harriers. 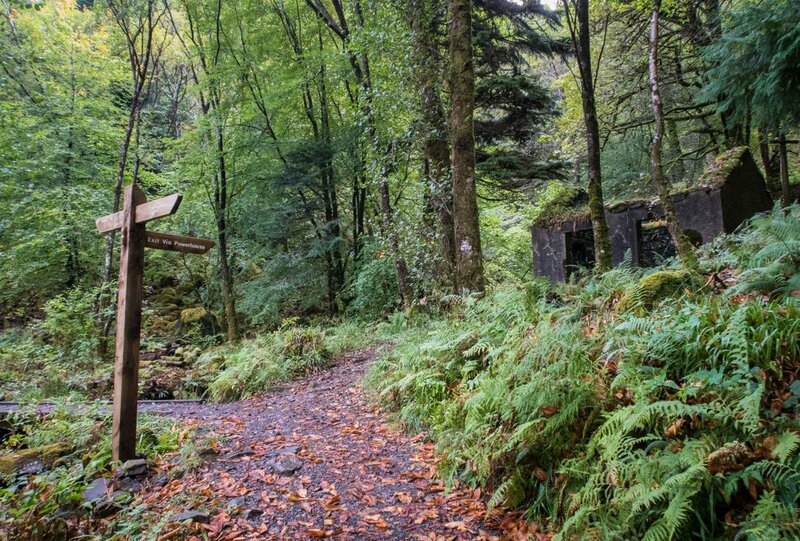 Before reaching the clearance village of Gualachaolish, you first pass through Killean where you can also drop down the hill side (following a burn) to visit the remains of the chapel. 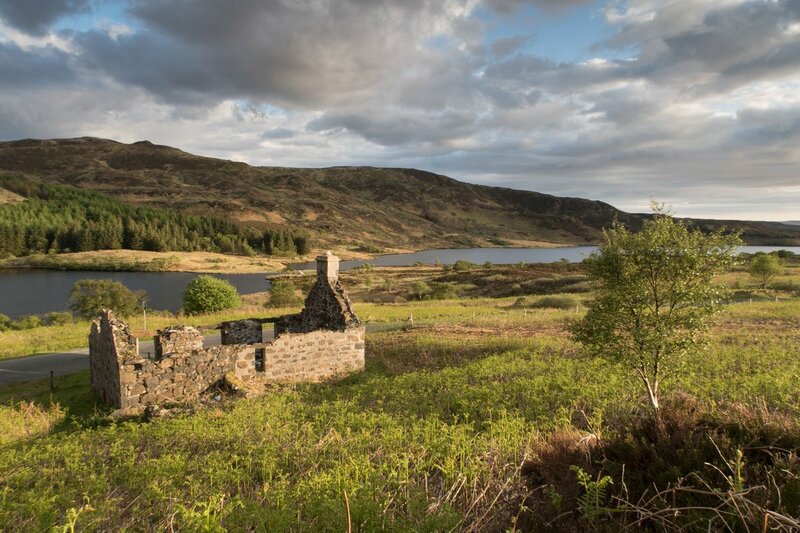 The houses at Gualachaolish are quite well preserved and the views toward Croggan and the narrow tidal entrance of Loch Spelve are excellent. Return the same route. 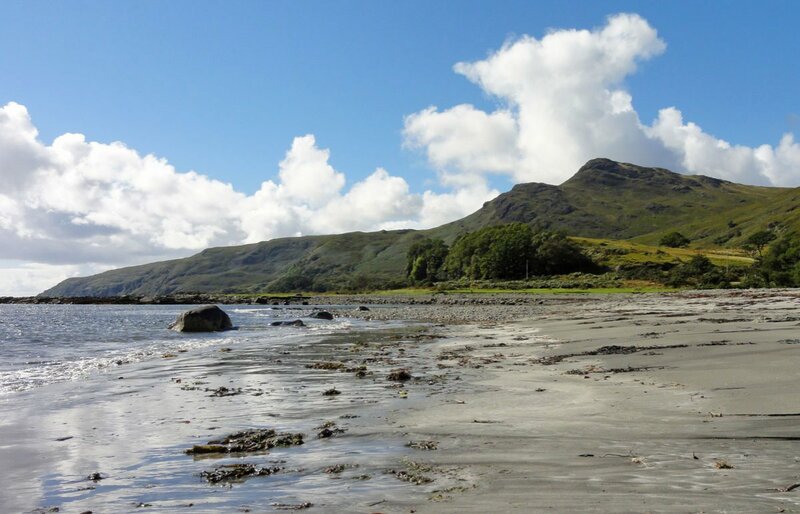 Starting at the Croggan road end this beautiful Isle of Mull coastal walk follows the coast around the headland. 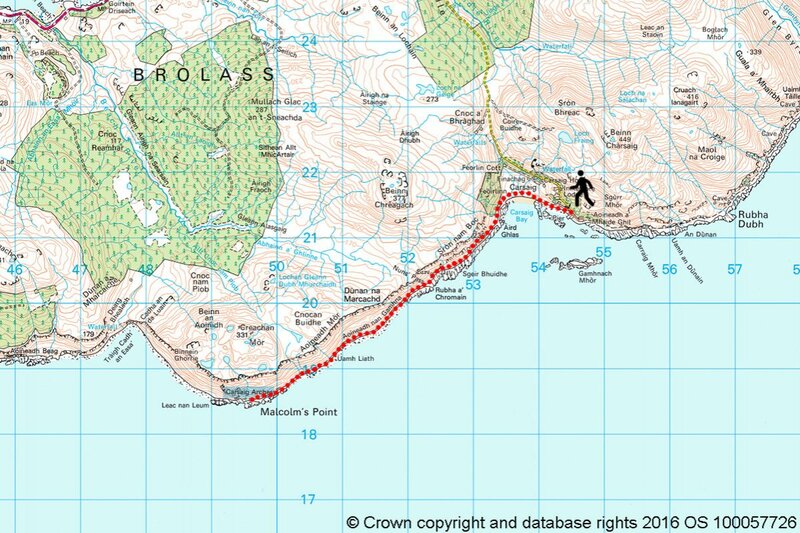 Passing through deciduous woodland and rocky coast there are the most fantastic sea and mountain views, and the area is a wildlife hotspot. The tides here race into and out of Loch Spelve, and as result there is always some wildlife activity to observe. 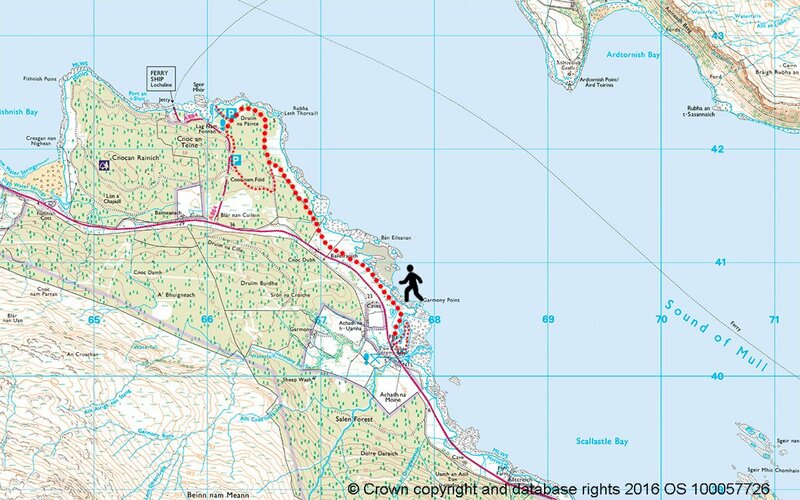 The track is easy underfoot and heads around the coast with great views towards the mainland and the Firth of Lorne. 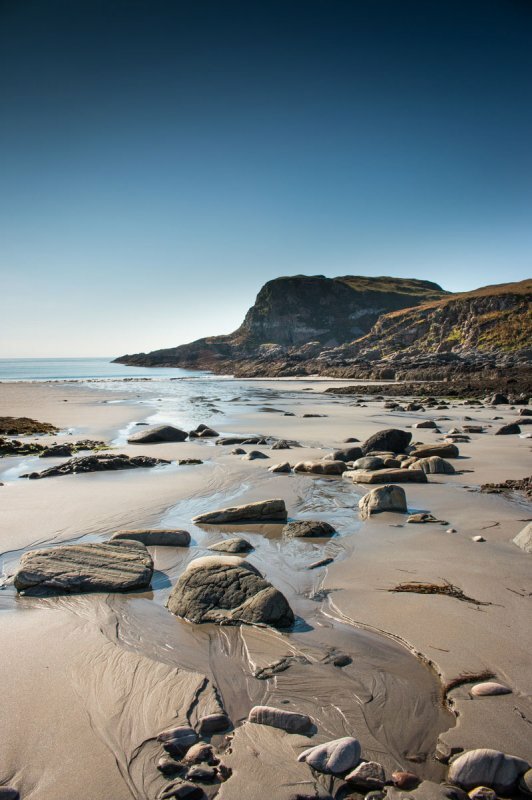 Portfield beach is a sandy expanse with rocky islets providing shelter to the waters of Port nan Crullach. 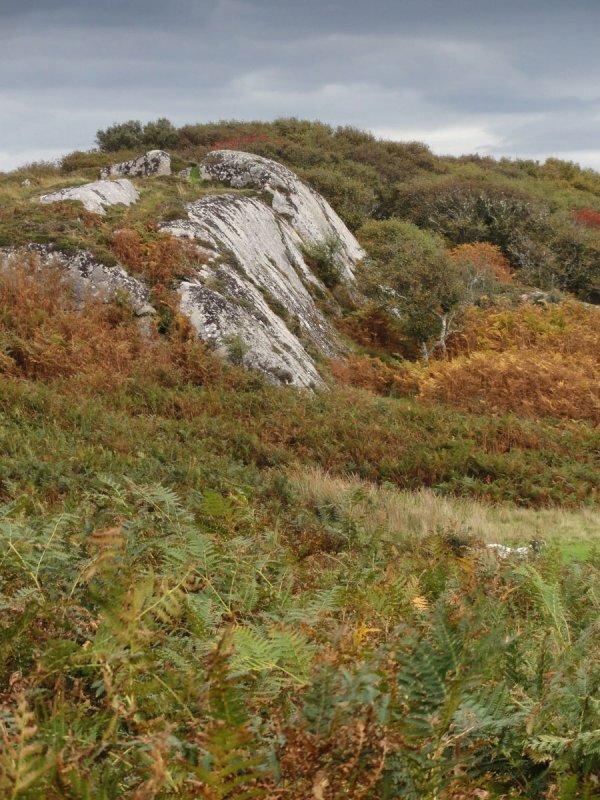 Mature atlantic oak woodland extends from the hillside right down to the shore of the beach and it is a popular place for the resident otter population, so keep your eyes peeled. Above the beach is Portfield itself, a white stone building at which the track ends. Return via the same route. 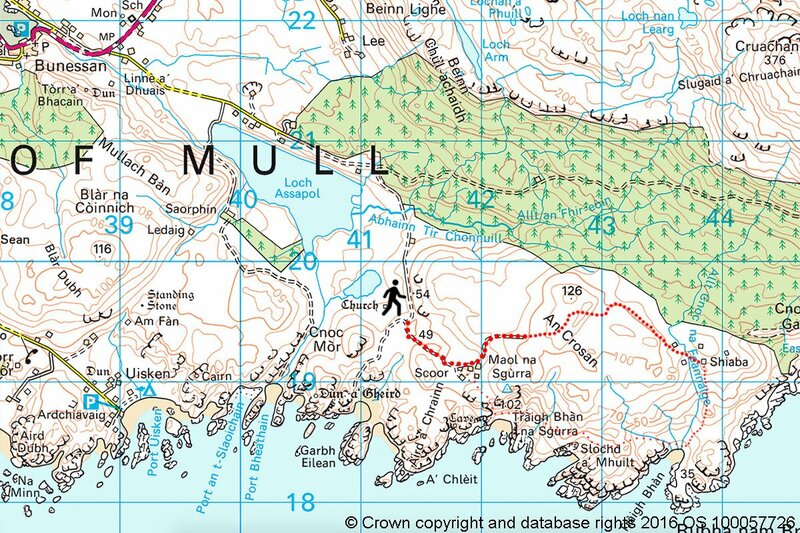 This short walk on the Isle of Mull, starts by the bridge over the river Abhainn an Tomarain. The path crosses over fields with mature trees and the way is marked by a series of white stones. We should warn, the route can be rather wet underfoot! 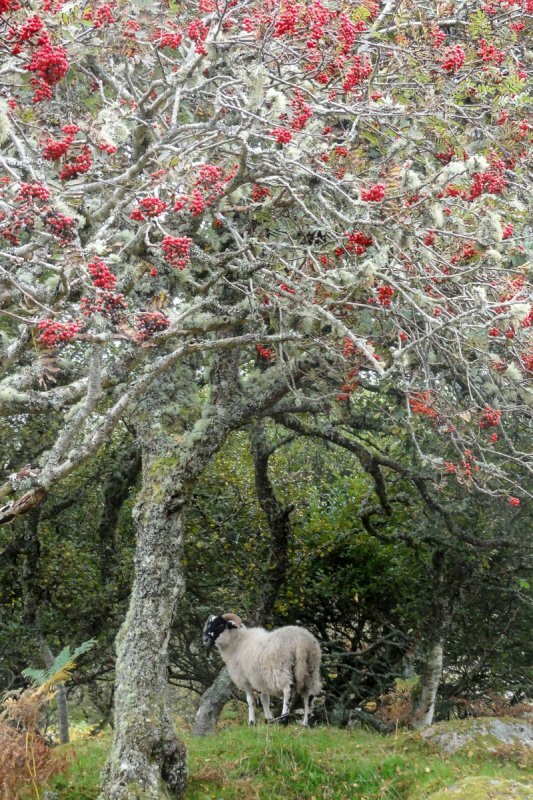 Red and fallow deer often graze around here along with livestock. 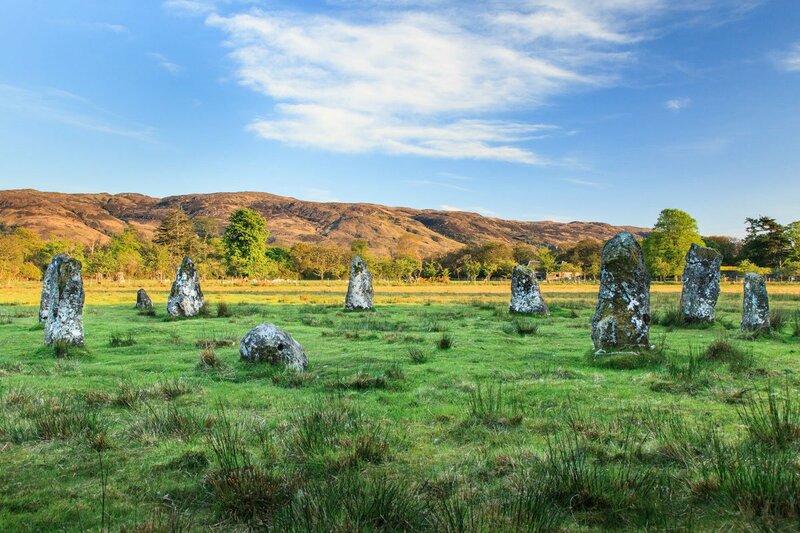 The circle itself is well preserved, and the setting with the mountainous backdrop of Ben Buie, one of Mull's most striking mountains, is magnificent. 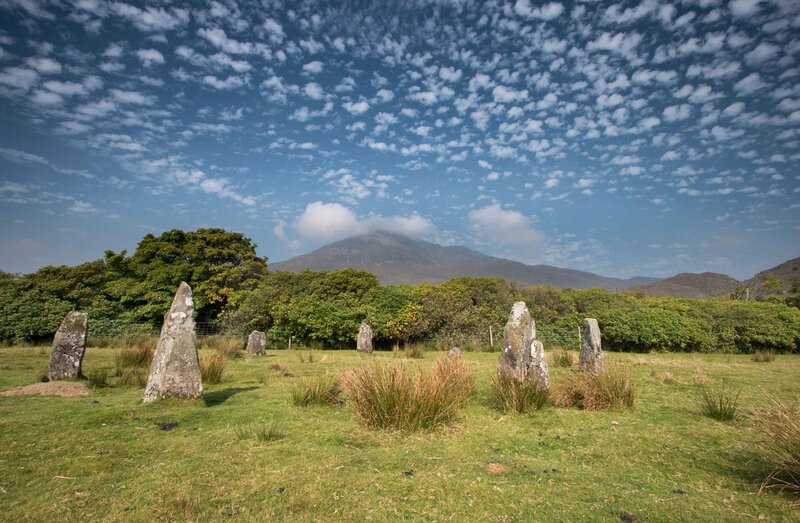 The circle itself dates to the late neolithic or early bronze age and the tallest stones stand at nearly 2m high. Return via the same route. 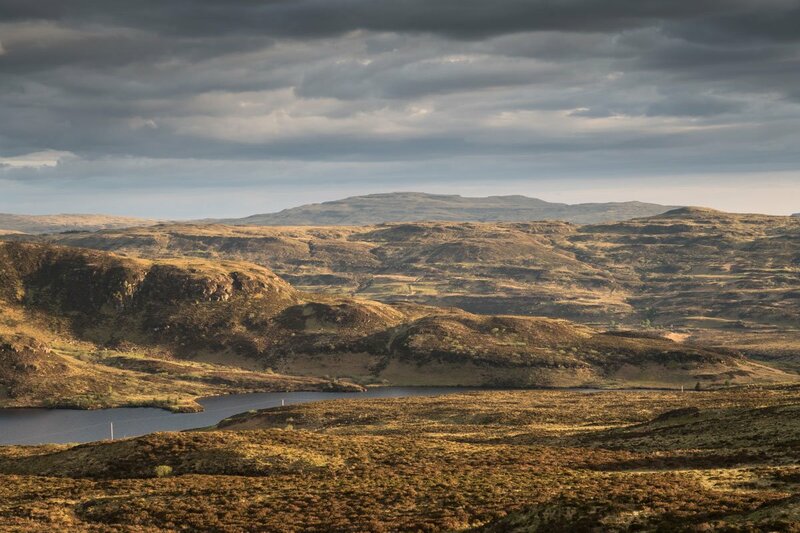 This beautiful low level walk crosses over some of the Ross of Mull's regenerating interior landscape, a mix of new birches, gnarly old oaks, granite outcrops and a fair portion of bog and bracken thrown in the mix! 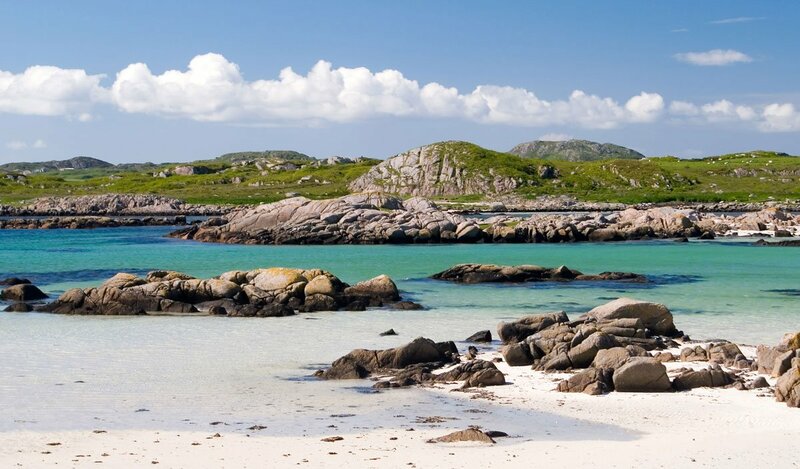 It also ends at one of the island's finest beaches, the stunning Traigh Gheal. Begin the walk from the farm buildings near at Knockvologan. 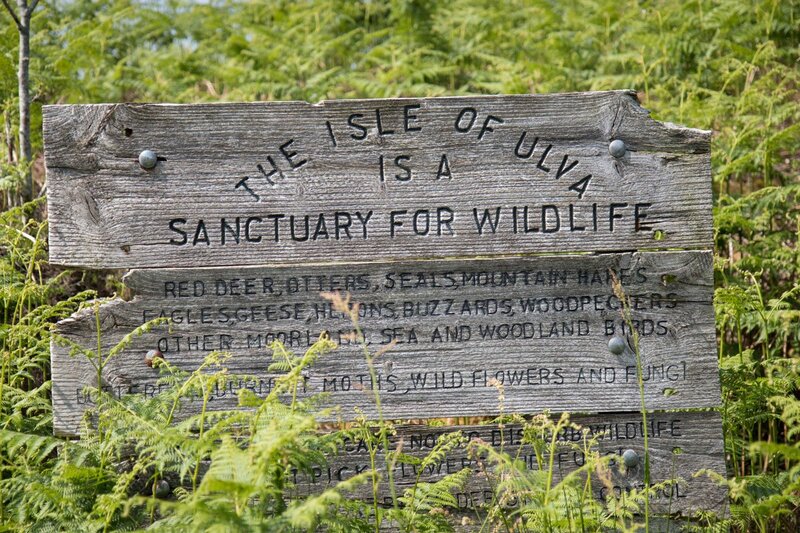 A sign informs visitors about the flora and fauna in the reserve. 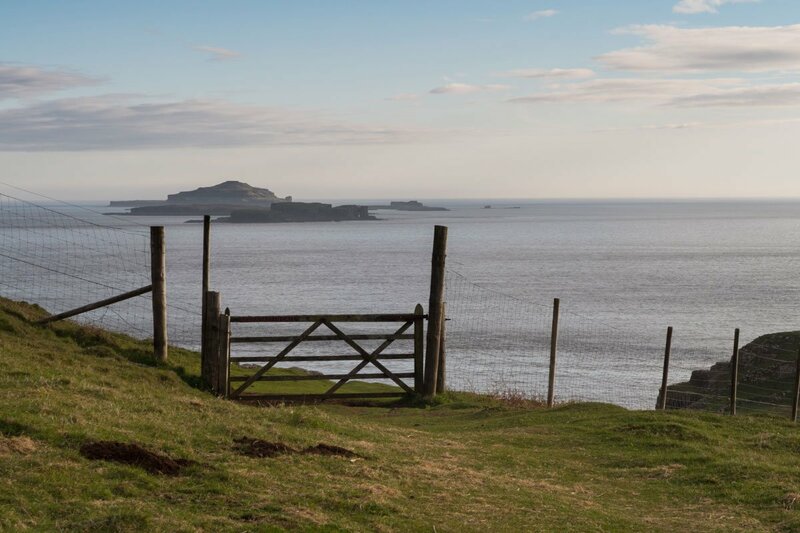 The path rises and crosses over Torr Fada from where there are excellent views over the Ross and surrounding seas. 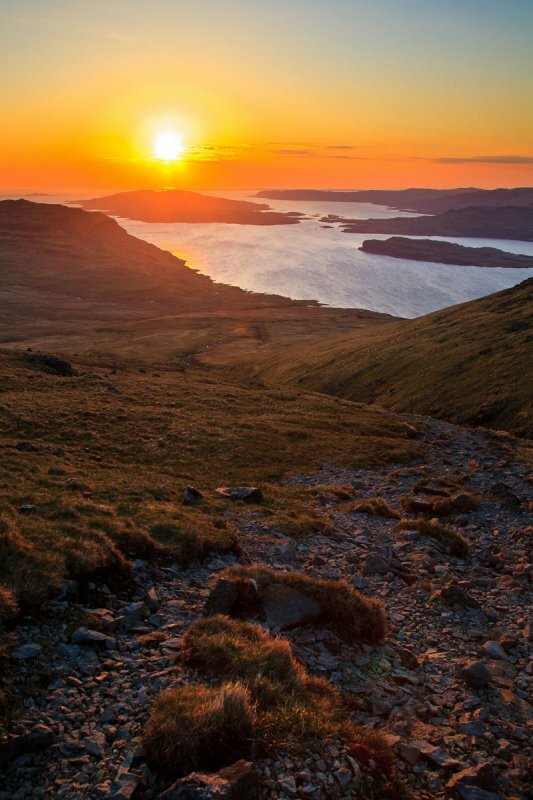 The path then descends toward Mull's south coast crossing a series of makeshift bridges. 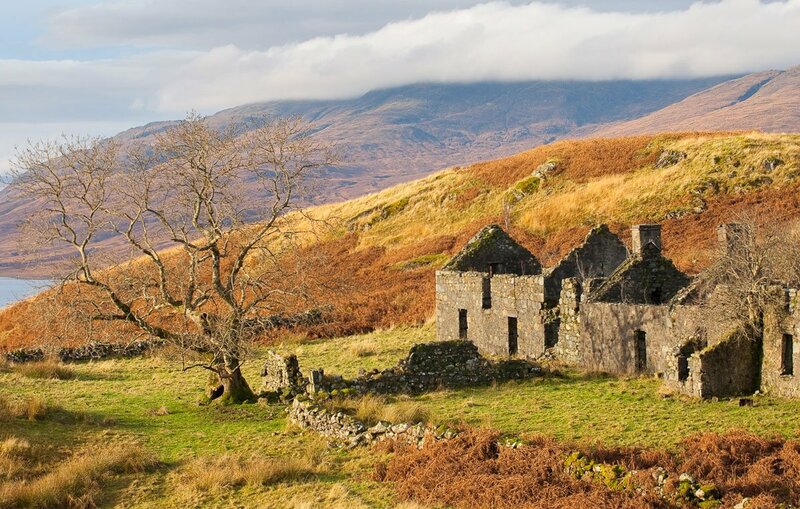 As you near the beach you pass the ruined highland clearance cottages of Tireragan. The way then enters gnarled woods before emerging at the stunningly beautiful, large expanse of white sand at Traigh Gheal. Return the same route. 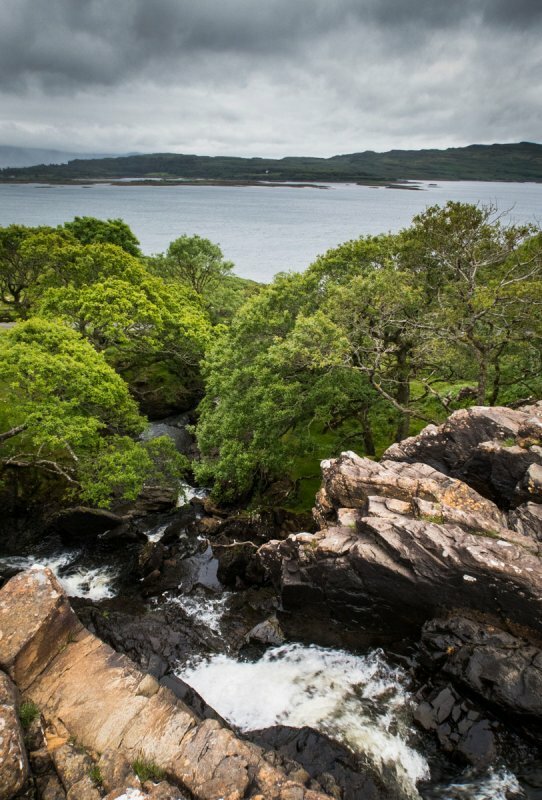 Glen Forsa cuts through Mull's interior from the sea at the Sound of Mull to Glen More. 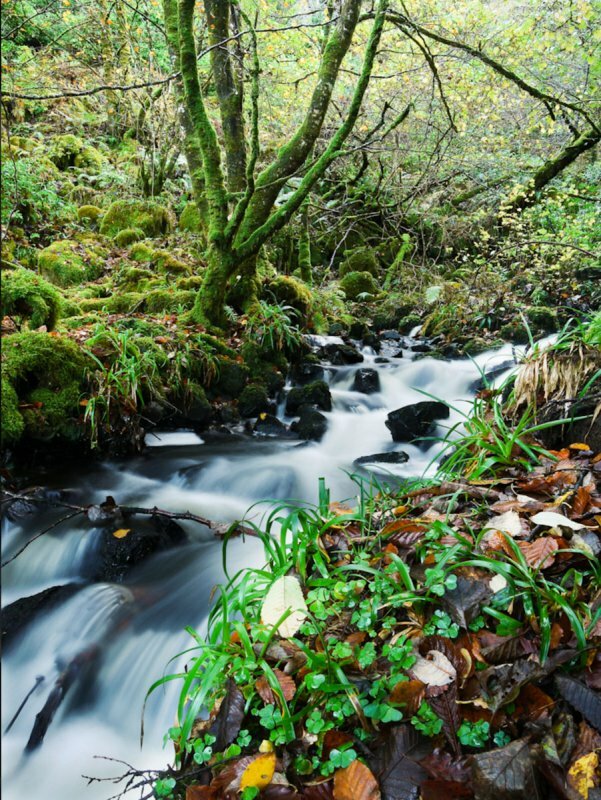 The River Forsa runs through the base of the glen and there are areas of woodland, hillside and mountain. 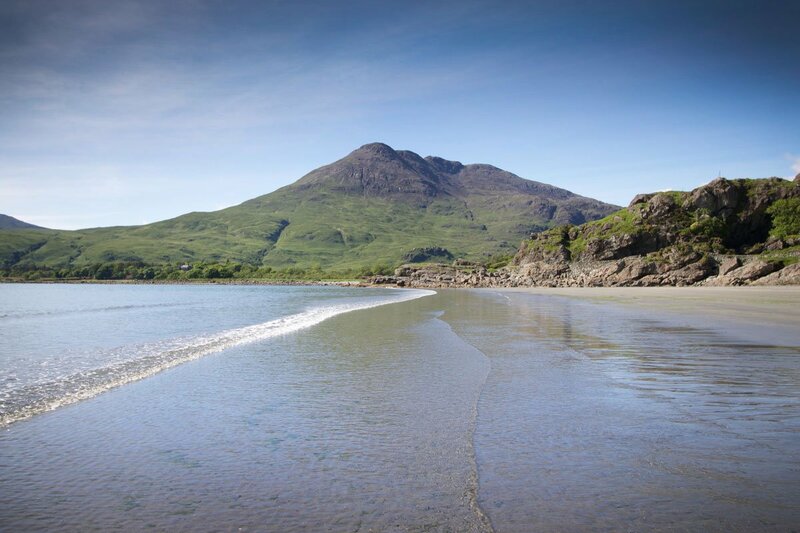 From lots of points on the Isle ofMull, the distinct mountain profile of Beinn Talaidh is visible. 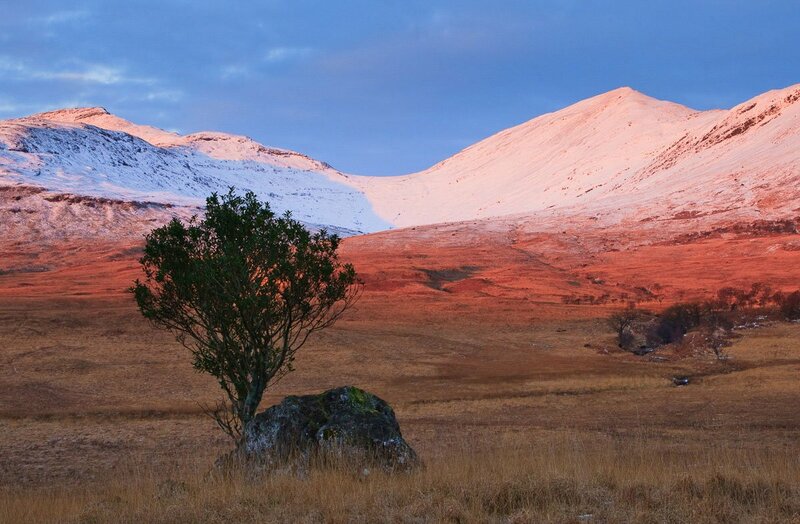 When viewed from the start of the glen near Salen Beinn Talaidh is framed beautifully at what looks to be the head of the glen. 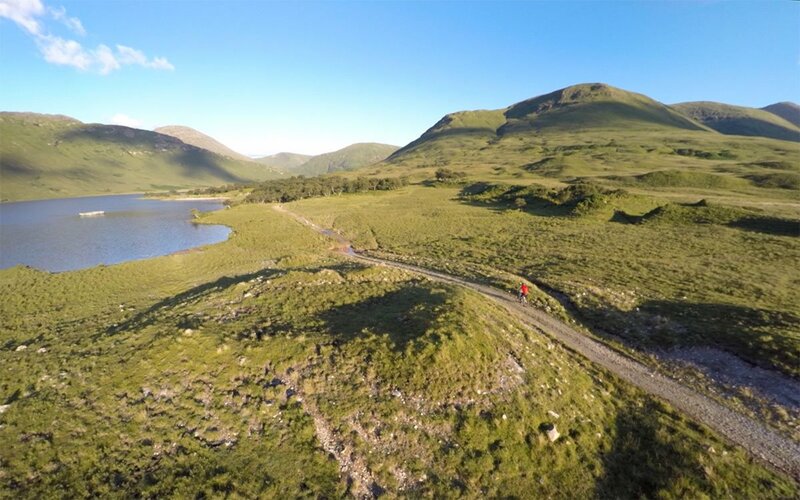 There is a gravel vehicle track which gives easy access to the start of the glen. 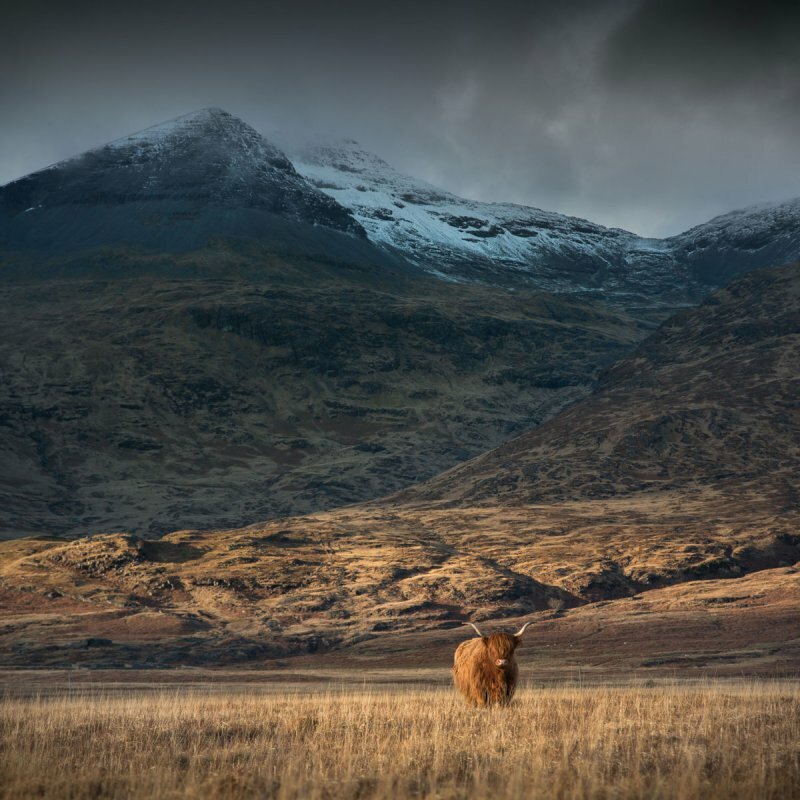 Highland cattle and sheep are farmed here and there is much wildlife, with red deer and eagles being a common sight. 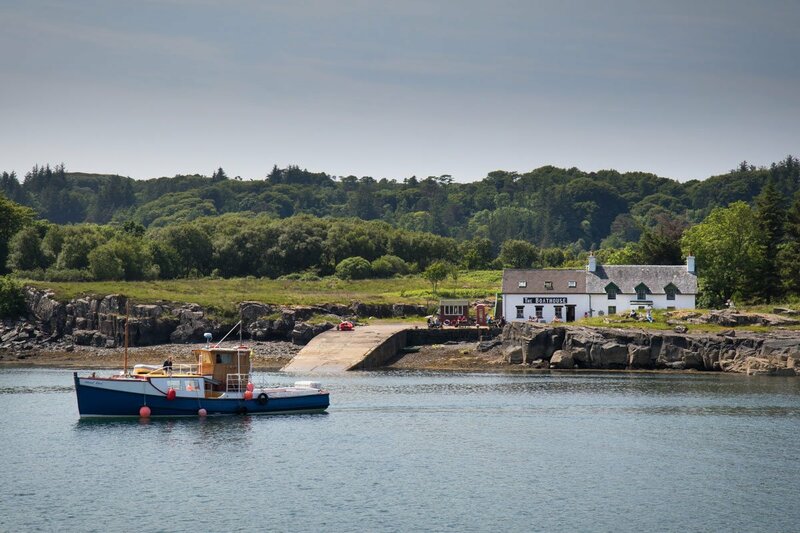 Passing the cottage Kilbeg, the track continues to follow the course of the river. 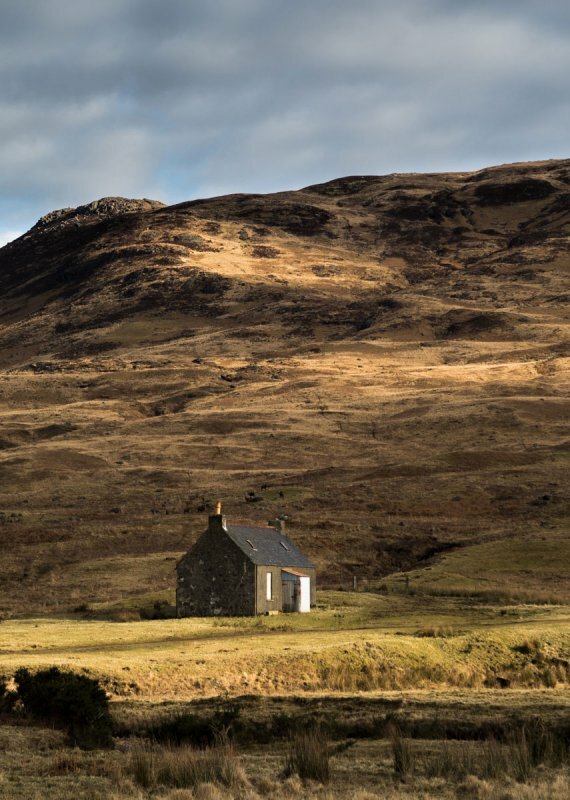 There are numerous old buildings and bothies along the glen and after passing the sheep fanks the track rises up to the MBA run bothy Tomsleibhe. There is also the Dakota memorial here commemorating the 1945 airplane crash, when a Dakota struck the mountain. 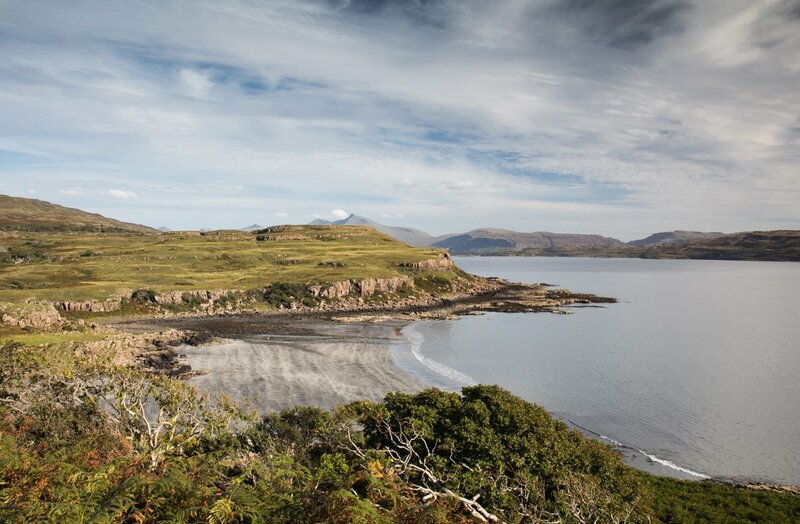 Many walkers return at this point, exploring the river along the way, but those wishing to ascend Ben Talaidh can do so following the broad steep flank of hillside right to the summit, from where there are exceptional views over the Isle of Mull's interior and coast. 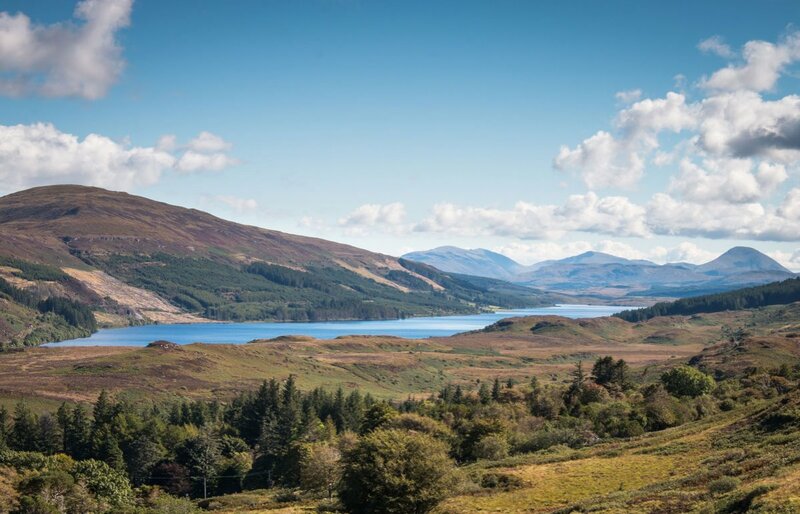 The three lochs that are such a landmark along the journey by road through Glen More also make a fine walk worthy of exploration. The route can be started at either end. From Lochbuie, parking is near the bridge over the Abhainn a' Chainginn Mhoir. 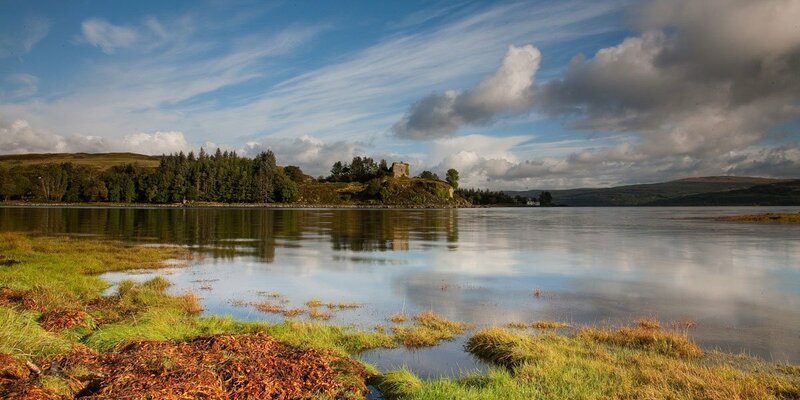 The track follows the course of the river rising steadily toward the first of the lochs Airde Glais. The track can be boggy underfoo, but the way is clearly discernible all the way along. 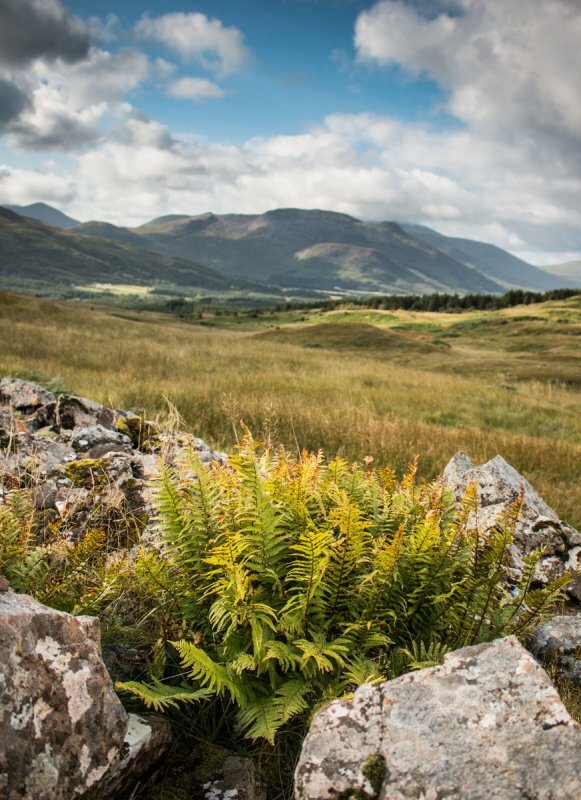 As well as the linear walk through the glen a detour can be made to climb either Ben Buie or Creach Beinn, both fine peaks worthy of a day's walk. This make the walk circular, but adds considerably to the difficulty and effort required! 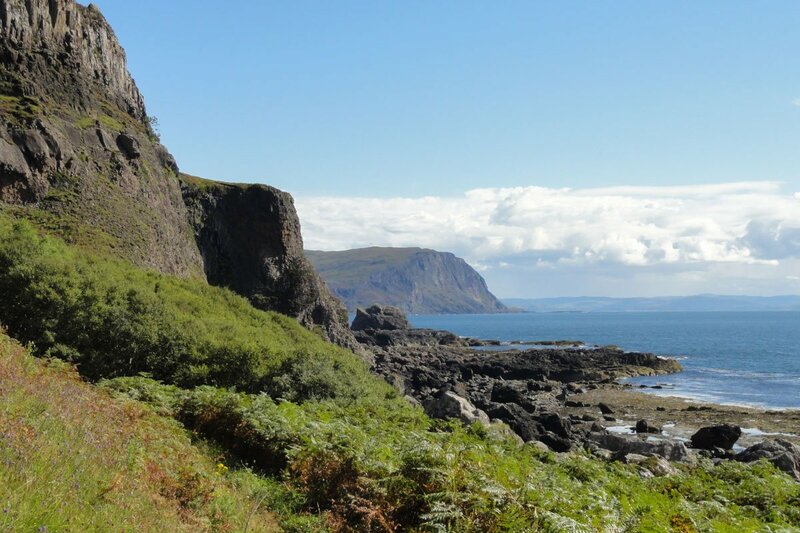 The walk to the Carsaig arches is perhaps one of the finest coastal walks on the Isle of Mull and is highly recommended. Be prepared however, the route traverses some difficult terrain and times are therefore slower than distances on a map might indicate. Starting at Carsaig the path heads west crossing the beach before passing beneath the high cliffs that run above the shore line. This is a great area for seeing (and smelling!) 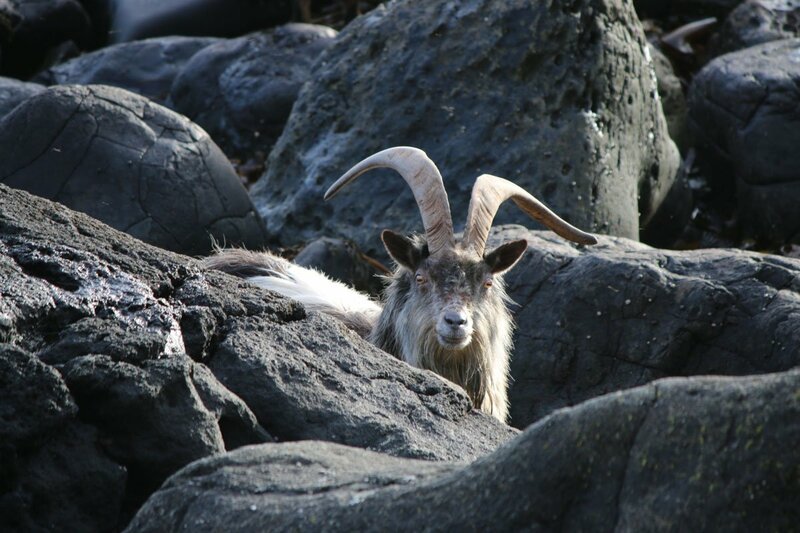 Mull's wild goat population who can often be seen munching kelp along the shore. 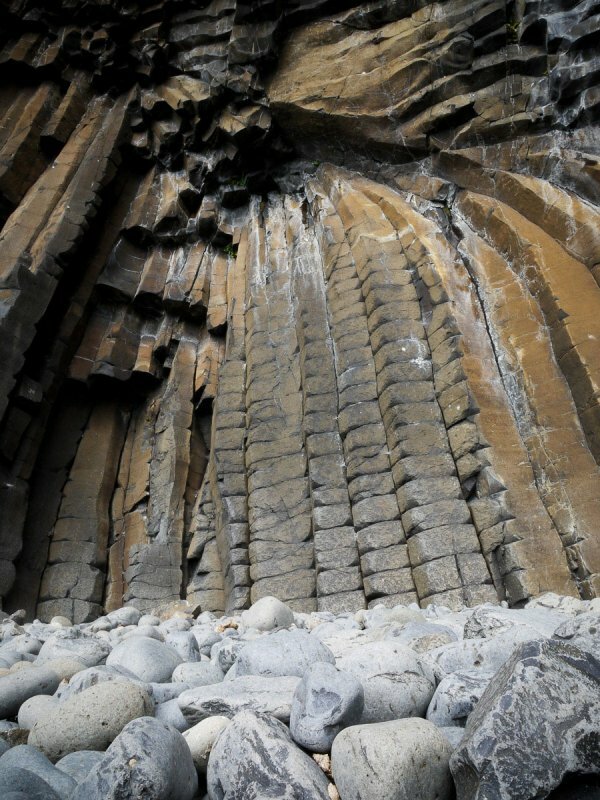 The spectacular geology of this area and sheer beauty of the coast make this an outstanding walk. 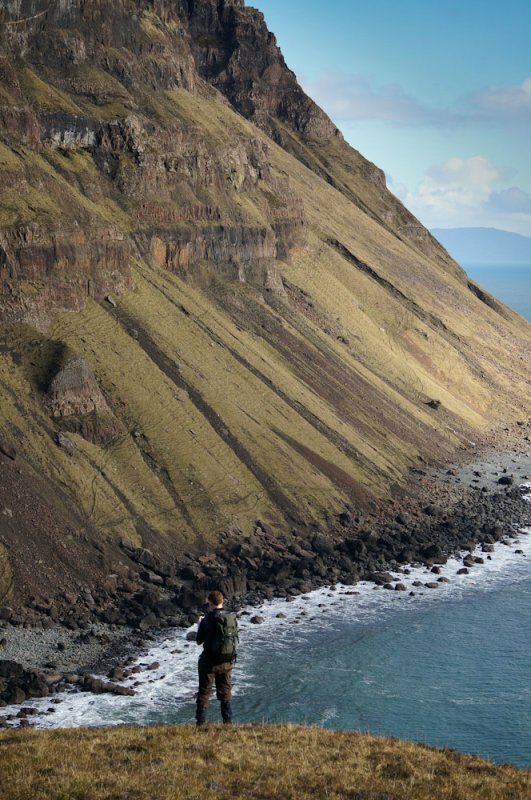 The cliffs reveal Mull's geological complexity and the KT boundary (dinosaur extinction event) is visible. The way becomes easier underfoot before getting rougher again as you reach the arches themselves, where the last section is very exposed and in wild weather can feel quite intimidating – please take care. Return the same way. Starting south of Bunessan at the Scoor road end, follow the track though the farm buildings and onto the open hill beyond. 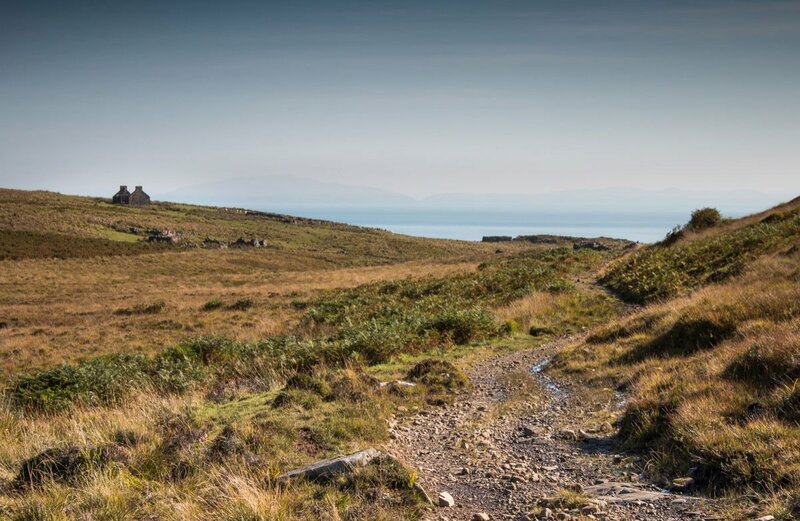 The track rises giving great views out to sea with the Paps of Jura in the distance, and closer by, the dramatic cliffs of the Isle of Mull's southern coast at Carsaig. The ruined village of Shiaba comprises a collection of cottages along the course of the burn Allt Cnoc na Feannaige. Some of the cottages are well preserved; at one time over 350 people lived here and there are many old signs of the land having been worked and farmed. There are numerous excellent sandy beaches in this area for those wanting to do a bit of exploring. 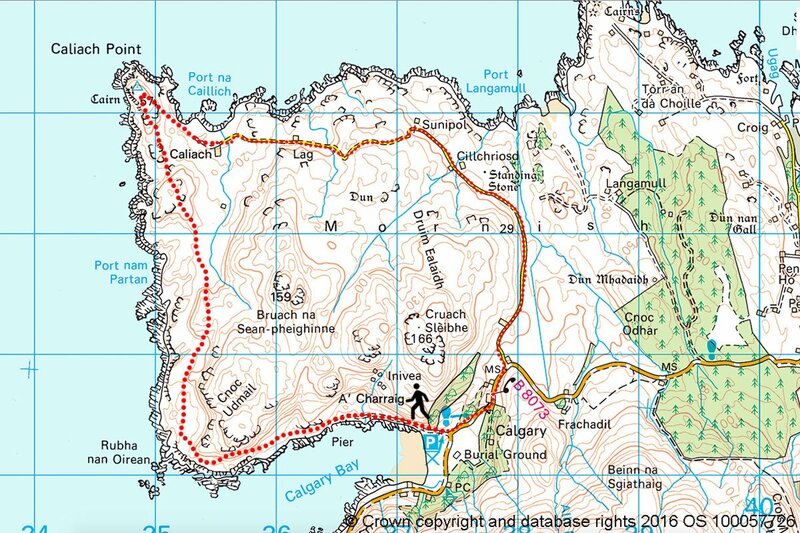 By following the course of the burn you can head to the coast and the beautiful beach Traigh Bhan. There is a ruined cottage here that used to be the village shop for Shiaba, a handy location for stocking up with fresh produce landed by sea. 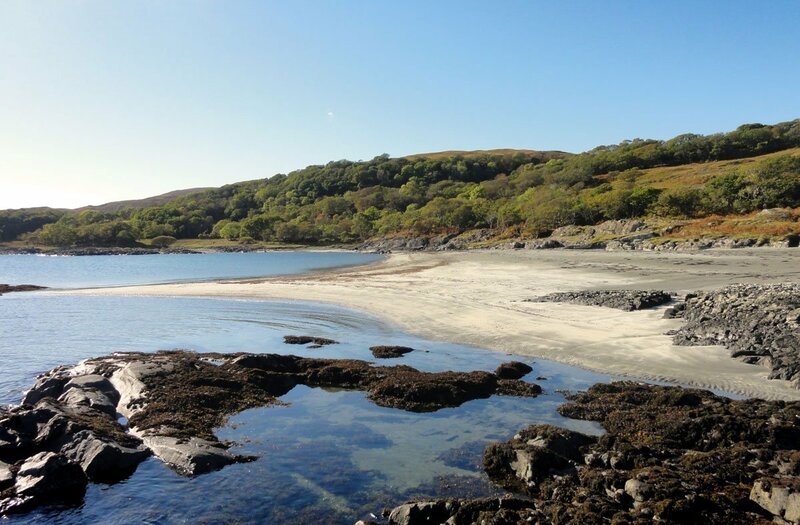 This is also one of the beaches that the villagers left the Isle of Mull from to board the emigrant ships during the clearances. From here, heading west, there is just one fantastic beach after another, but the terrain is largely pathless and can be arduous in places. The easier option is to return along the same track from Shiaba. 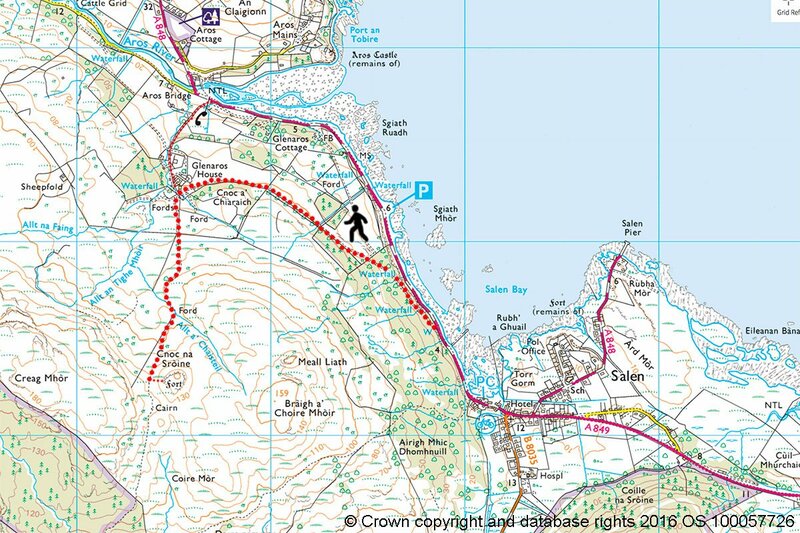 A lovely circular walk that offers superb sea views and the option of finishing in Bunessan and getting lunch. 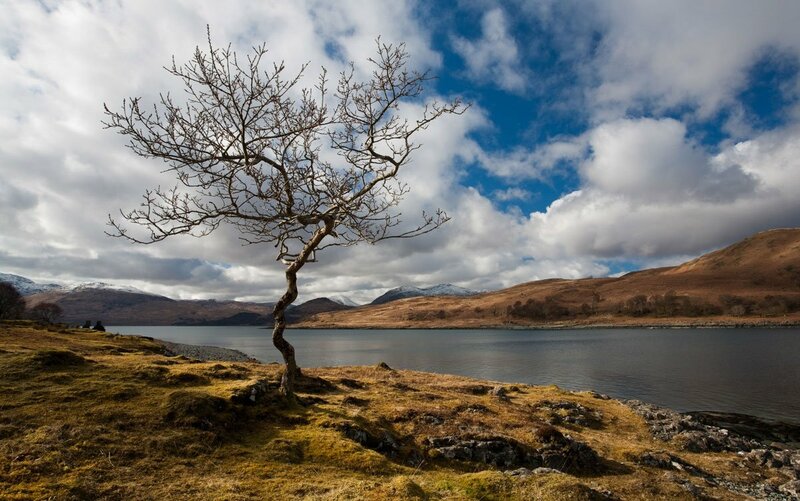 Begin the walk by heading north along the road that runs beside and shore of Loch na Lathaich. 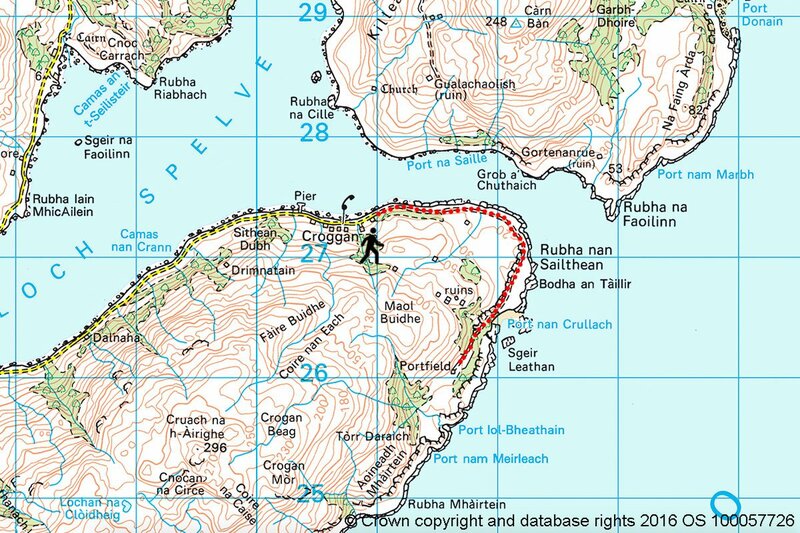 After passing the last buildings at Eorbus continue following the farm track out towards Aoineadh Mor where you will find nice columnar basalt formation and a great view across the mouth of Loch na Lathaich. 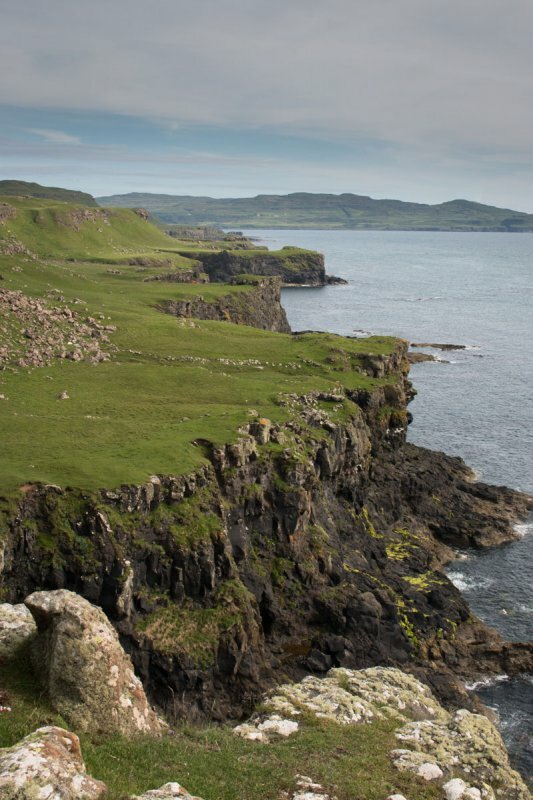 Continue around the headland enjoying the views over the sea toward Staffa,the Treshnish Isles and the cliffs of Ardmeanach. 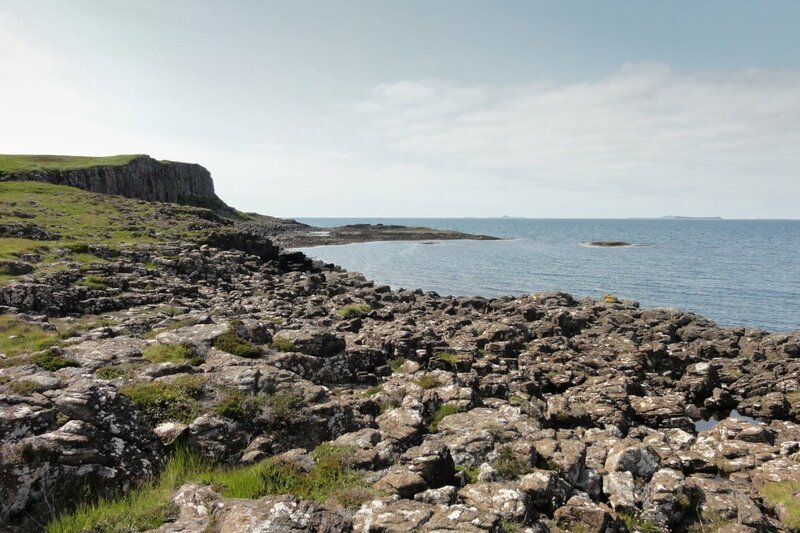 At the peak of the headland there is a gully by the coast and around this area you can find leaf fossils of deciduous trees that once grew beside a prehistoric lake! 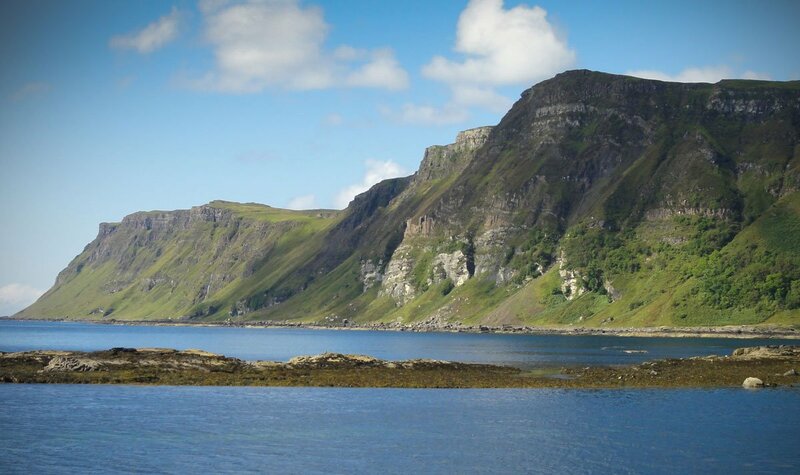 From here continue around the coast before regaining the Ardtun loop road. 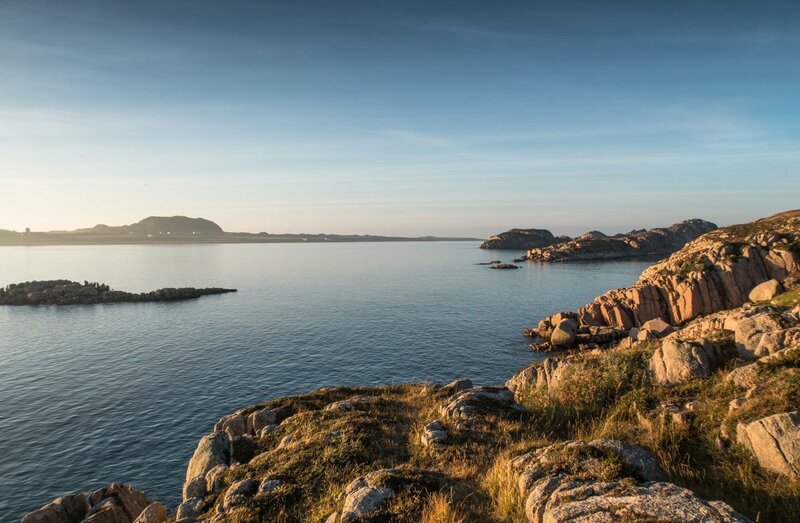 The beautiful island of Iona offers an excellent choice of low level coastal walking as well as the chance for those who like hills to climb the island's high point Dun I (101m). Here we highlight the main routes. 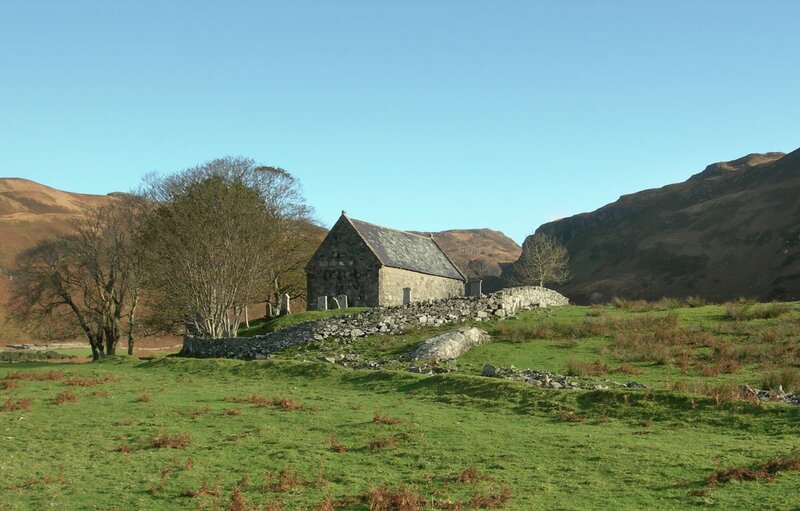 Head north through the cottages of Baile Mor passing the abbey as you go. 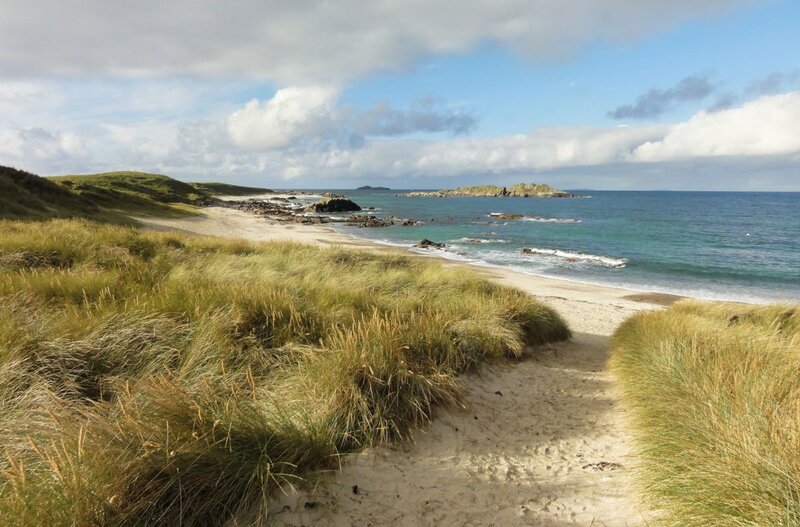 A path leads up Dun I, or you may continue to Iona's northern beaches Traigh Bhan and Traigh an t Suidie on the west coast. 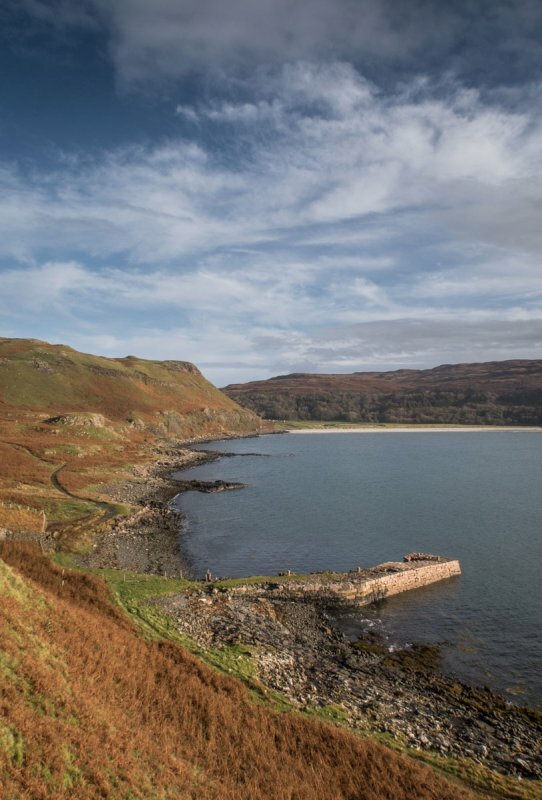 A circular walk around the coast can be made passing the stunning little beach at Port Ban before arriving at the Bay at the Back of the Ocean and golf course. 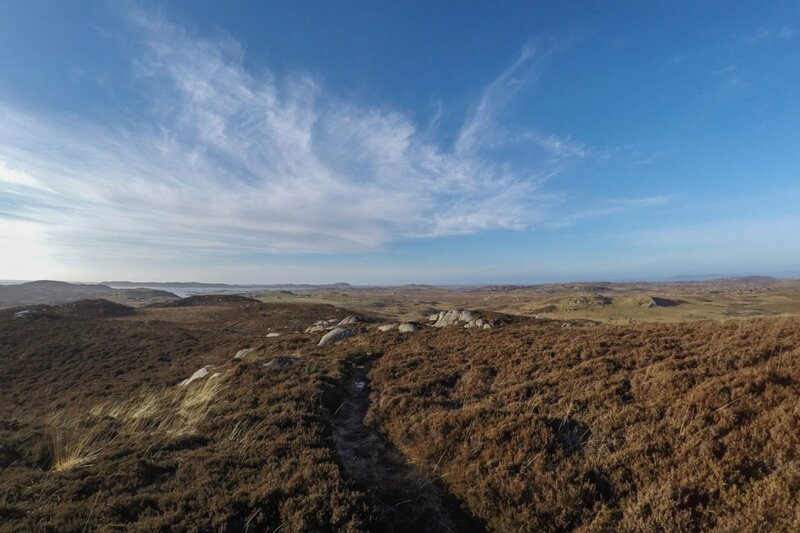 Heading South from Baile Mor you head towards the Bay at the Back of the Ocean where you follow a path south crossing Iona's more rugged southern half to arrive at the pebble beach of Cloumba's Bay. 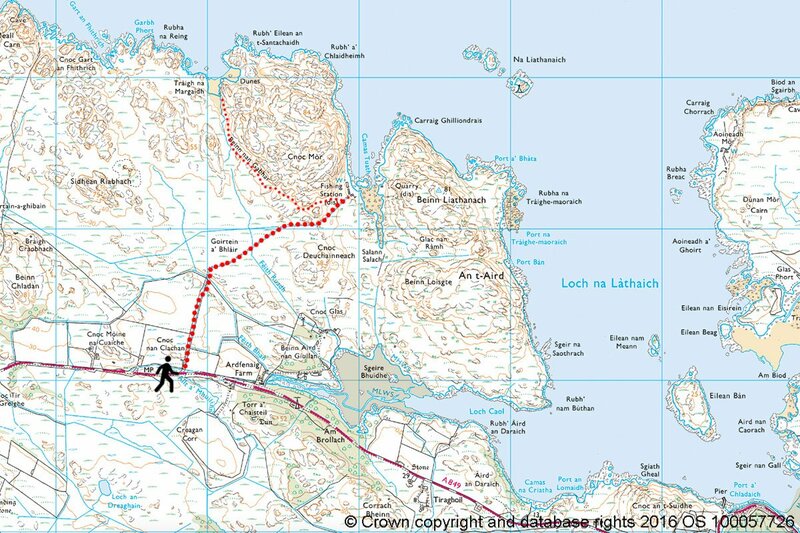 Return can be made the same way or loop round, passing Druim Dhughaill and Ruanaich on the way back to the road. 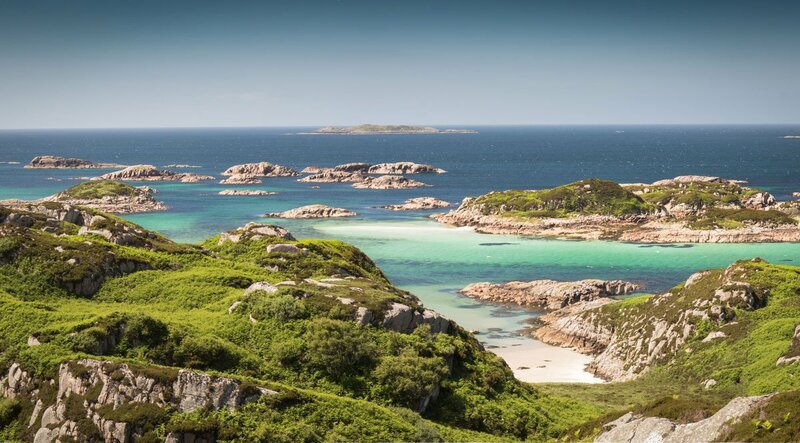 Following an old drover's road this route crosses from the white sandy beaches on Mull's west coast at Fidden, heading inland with fantastic views of the surrounding granite landscape. 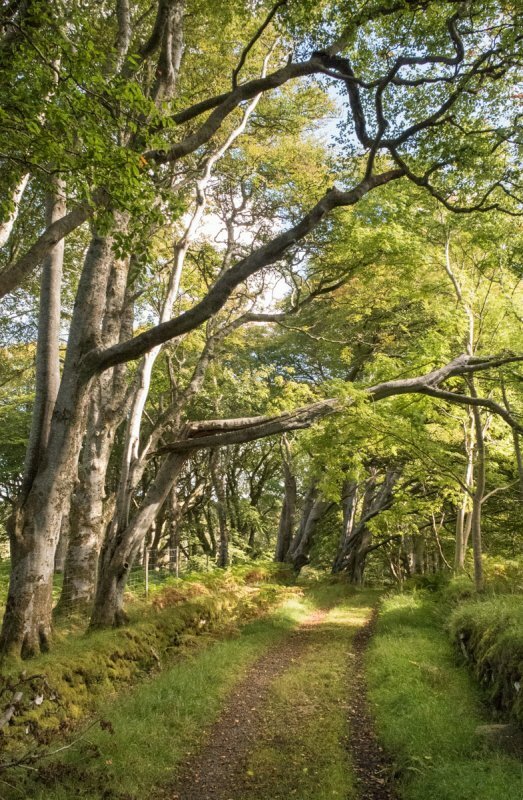 The track rises, passing through a patch of stunted ancient oak woods and rocky outcrops. Reaching the walk's high point the view to the north opens up over Ardtun and the Isle of Mull's Ardmeanach cliffs. The track gradually descends before emerging at the settlement of Pottie near Ardtun. 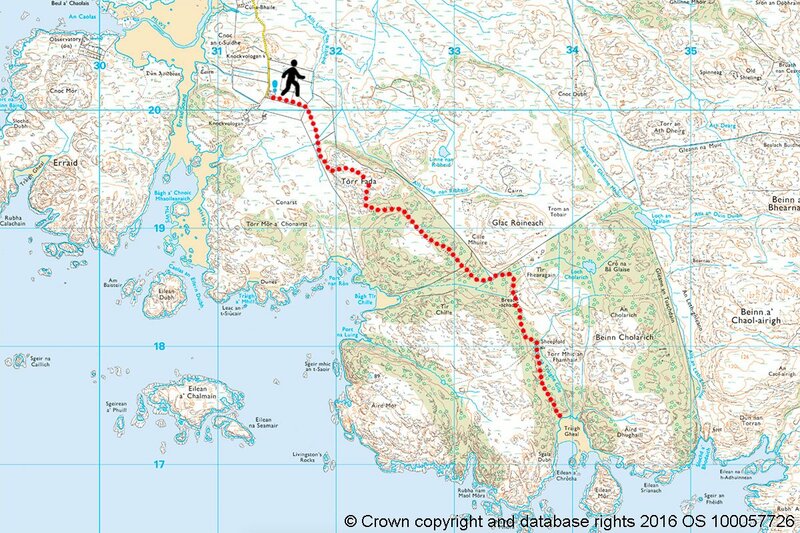 The walk can be made circular by following the single track road, or else return can be made along the same track. 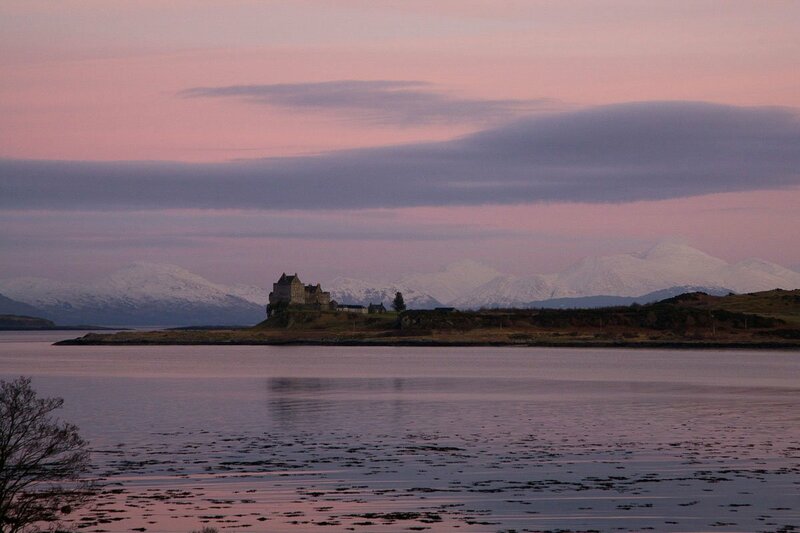 The distinct pink Ross of Mull on the Isle of Mull, was at one time mined and used in construction around the world. 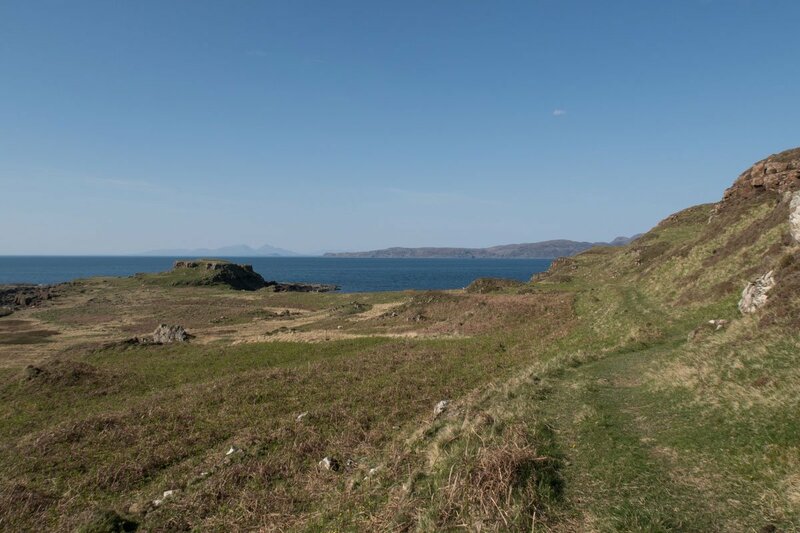 This reasonably short walk from Fionnphort takes you through the old workings at Tormore and takes in some of Mull's beautiful coastline that is so distinctive to the Ross. Starting a short way back along the single track road to Fionnphort follow the track heading past Bruach Mho. Gradually climb up the hill and pass through the disused granite quarry. There are information signs here about the quarry. 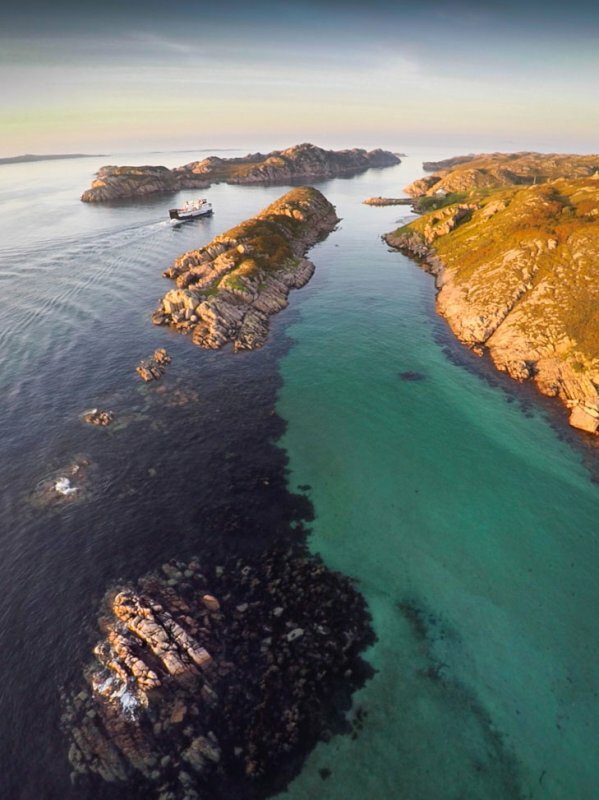 The path then descends via a narrow stone cutting and heads toward an old fishing croft and the safe anchorage of the Bull Hole, where the Iona ferry moors. There are some beautiful expanses of white sands here and at a very low tide these can be walk over most of the way back to Fionnphort. 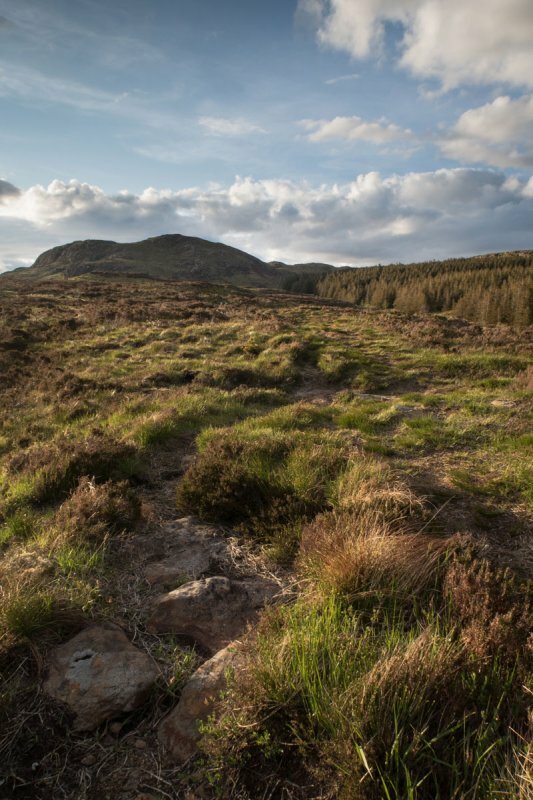 The more usual return to Fionnphort follows the many paths and trails that traverse the hill. 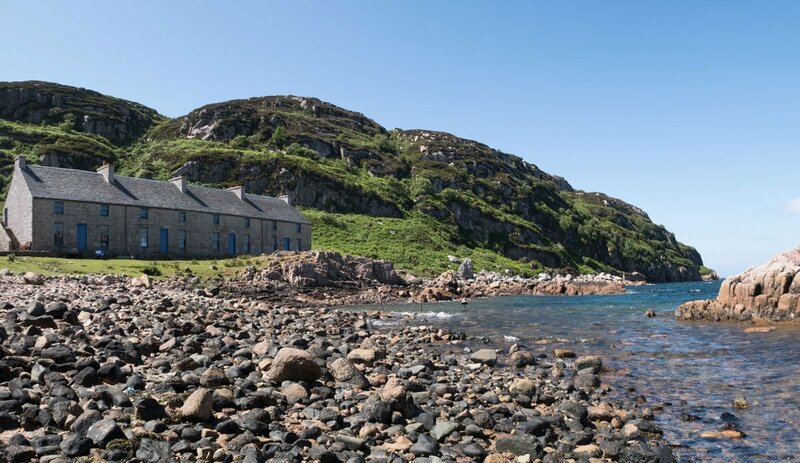 There are great views across the sound to Iona and after a short time you arrive at Fionnphort, the Isle of Mull's most westerly village, via the split boulder beach. 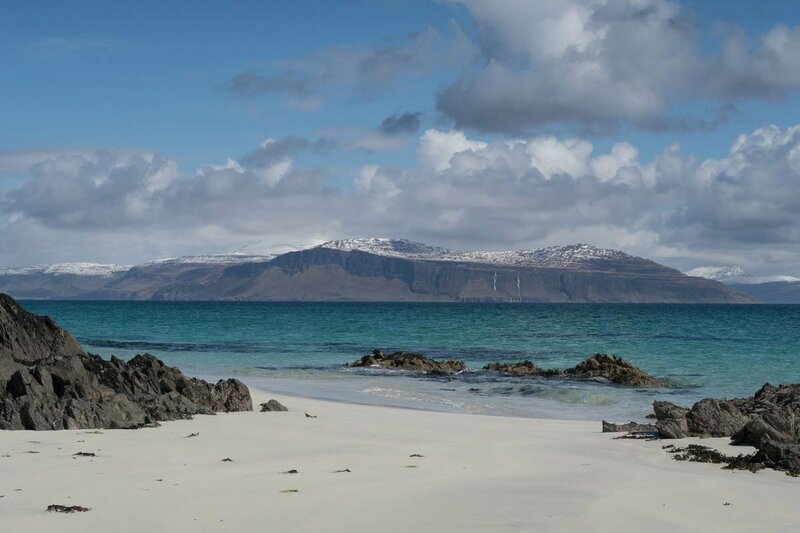 While many of the beaches on the Ross of Mull are along the south and west coast, the north facing Market Bay beach near Camas is well worthy of exploration. 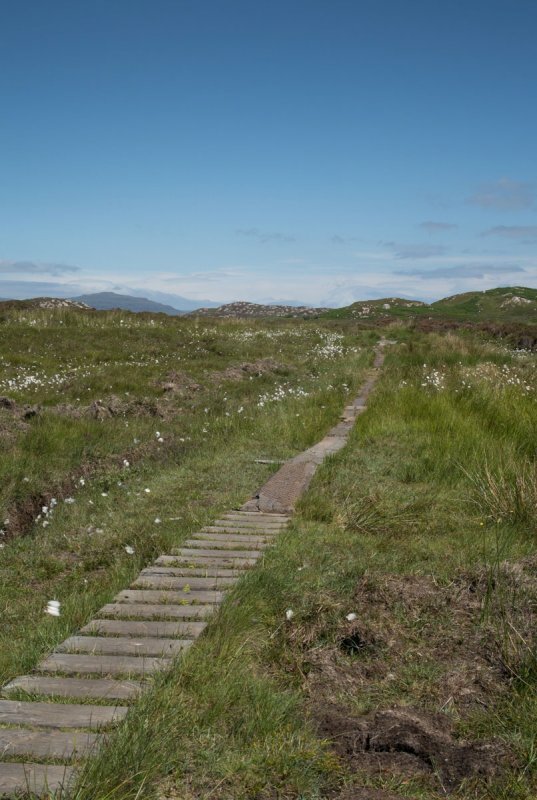 Not far from the filling station at Adfenaig follow the track which heads north in a straight line and is reinforced with timber boarding, to Camas, which is run by the Iona Community as an adventure camp. The cottages were originally part of the granite quarry across the bay. 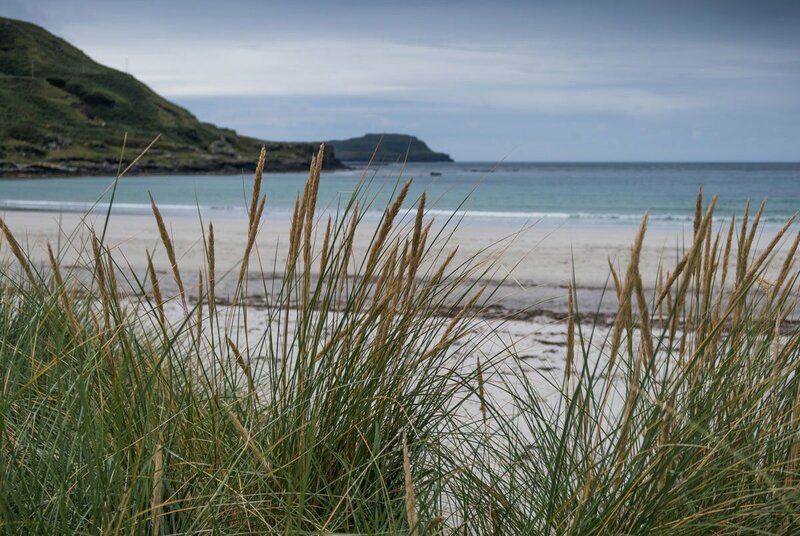 The path to Market bay is signed as you arrive at Camas and heads over the hill before descending to the sheltered waters and expanse of sand. There are two main beaches to explore. 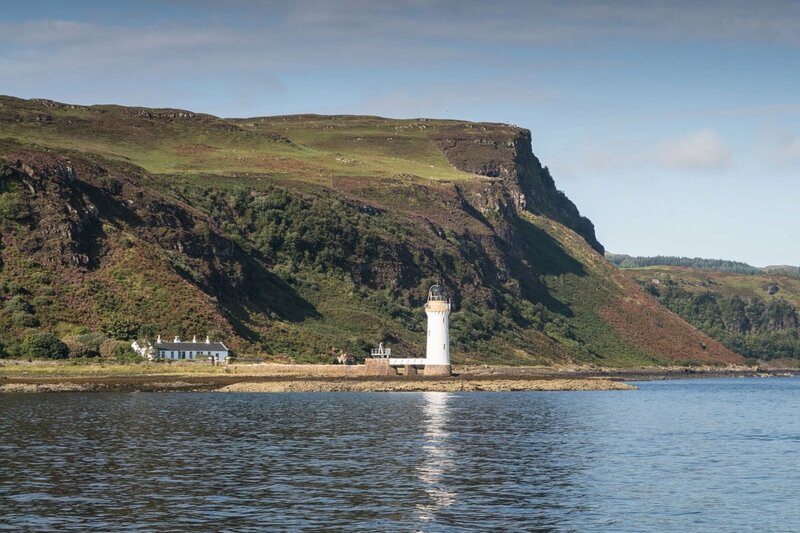 The views to Mull, Staffa and the Treshnish islands are stunning, and it is a great place to watch out for marine life heading along the coast. Return via the same track. 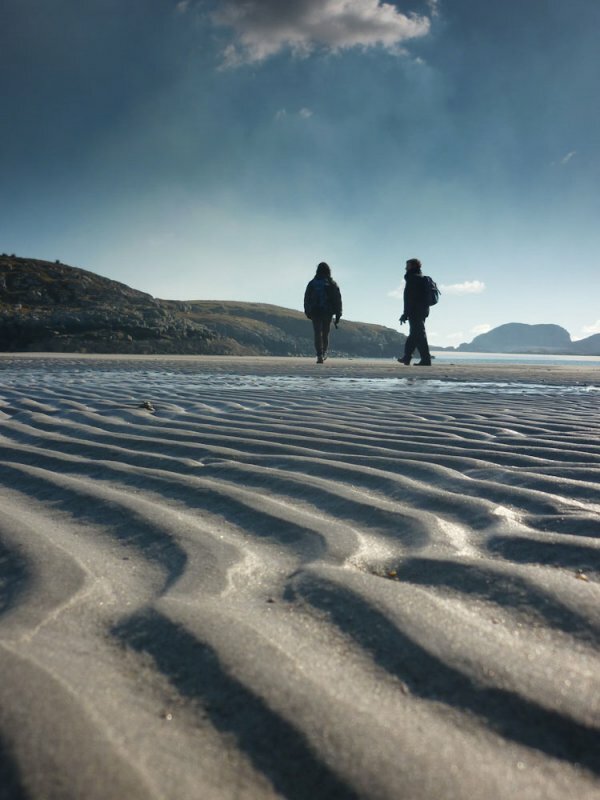 This spectacular walk begins at Mull's south western tip and the large expanse of fine white sands that make up Knockvologan beach. 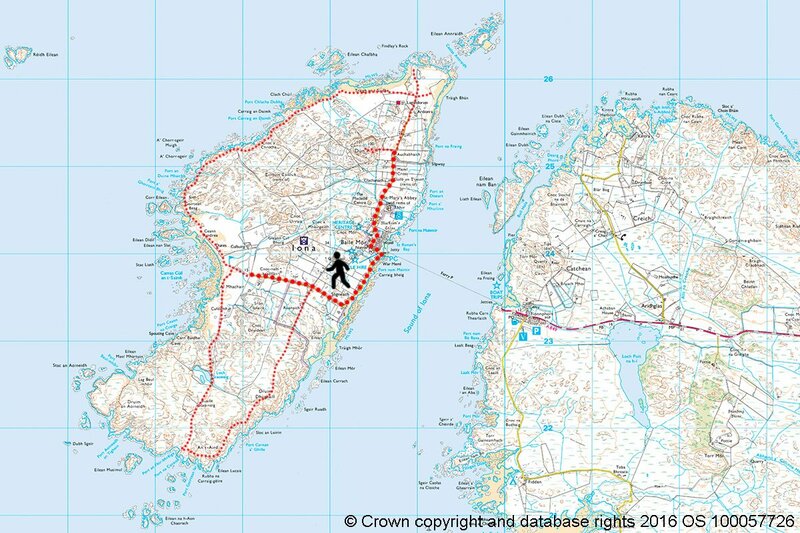 The crossing to Erraid is made by walking across a tidal sandbar, so a check is required of the tide time tables to avoid becoming marooned. 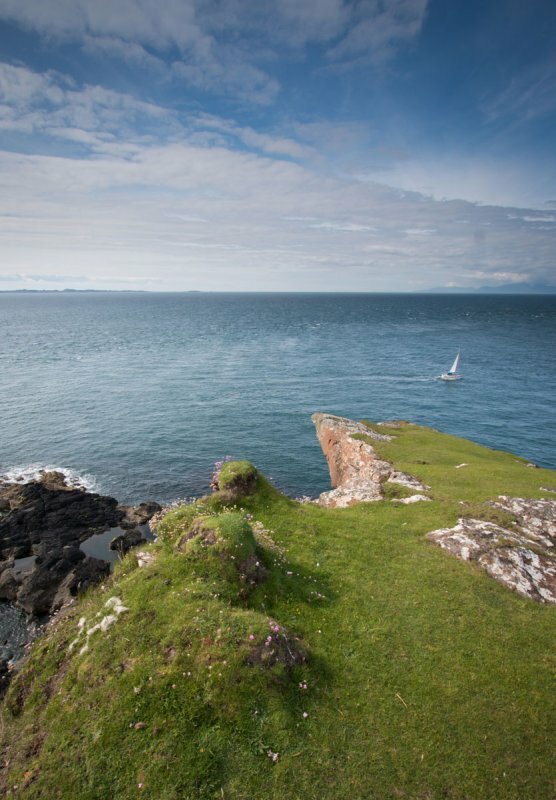 Erraid is the island featured in the Robert Louis Stevenson book, Kidnapped. In the book David Balfour survives for four days stranded before realising the island is tidal! Avoid making that same mistake! 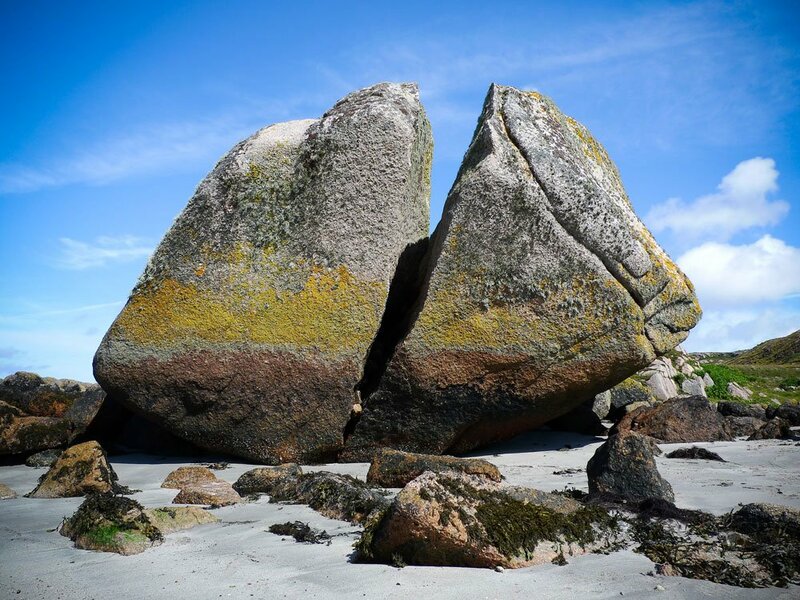 Like the Ross of Mull, Erraid is an island of pick granite rock. A row of houses and buildings that were built for the lighthouse keepers faces north, in a position sheltered from the southwest Atlantic winds. The cottages are now used by the Findhorn Foundation. 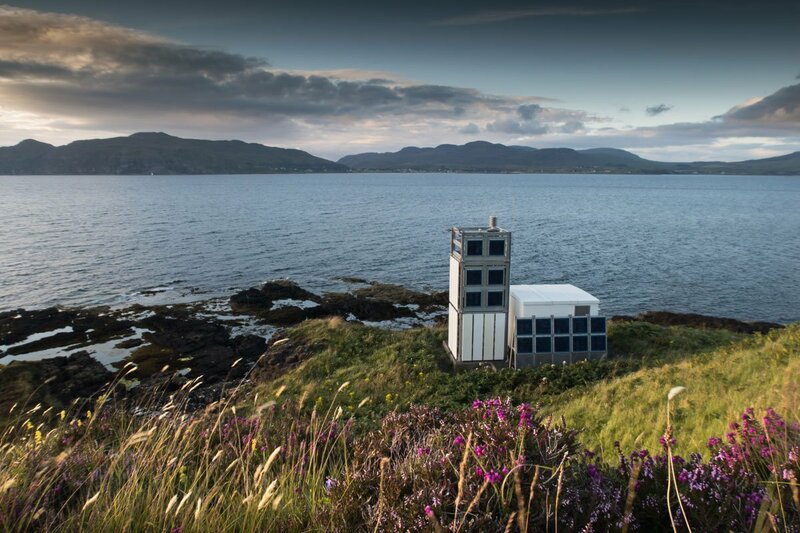 Climb higher passing the signal station until you gain the high point (Cnoc Mor), which has the most fantastic panoramic views over the Isle of Mull, Iona and the Torran Rocks to the south. 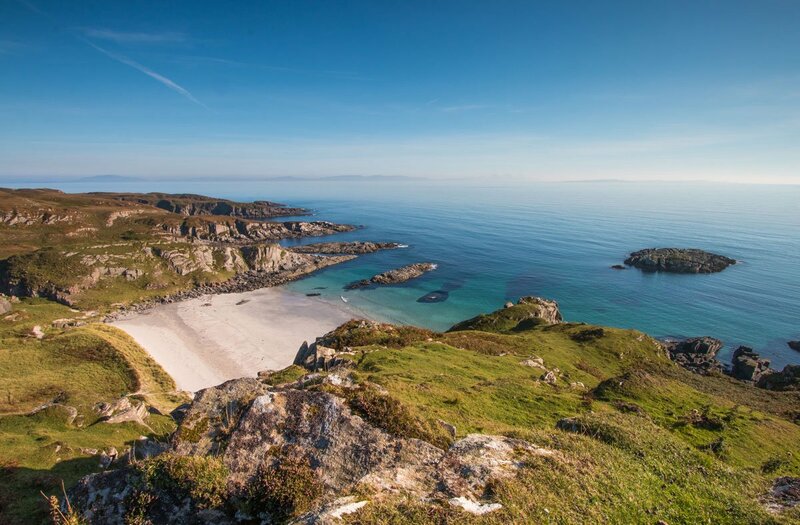 There is a great beach Traigh Gheal on the south of Erraid, and spectacular views to the west over the many islets off Erraid's west coast. Return to the Isle of Mull via the same crossing. Before the high tide!